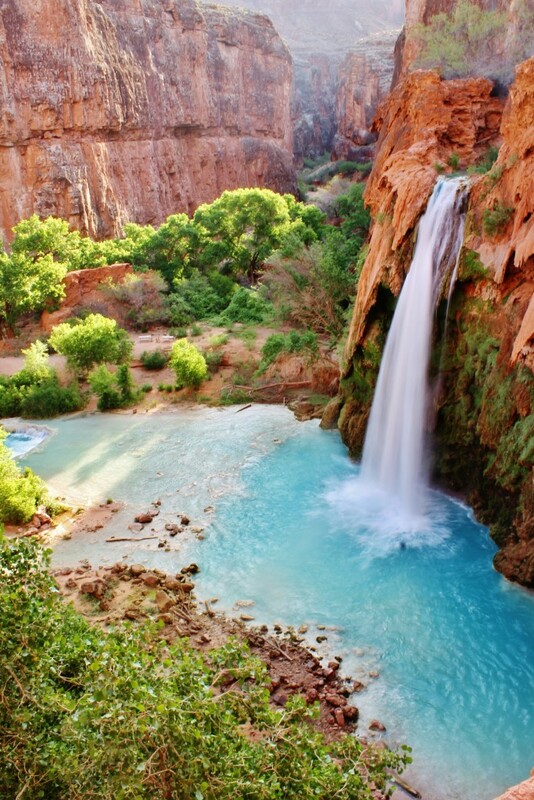 At a whopping 277 miles in length and a mile deep, the Grand Canyon makes is one of the 7 natural wonders of the world. If you are traveling by car, it costs $30 to get into the park and your park pass is good for 7 days. The park also has a couple of entry fee free days and they can be found here. 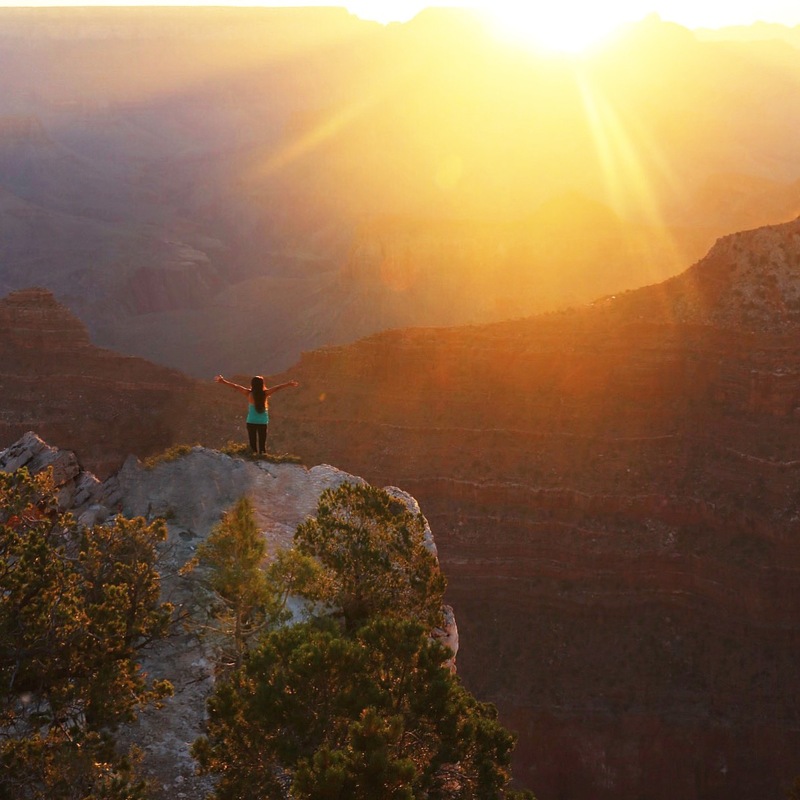 If you’re looking to take some epic pictures and just admire the view, then your first stop should be Mather Point. Located at the South Rim, it is the most popular viewing area for tourists and offers some stellar views. The only downside is that this viewing area can get pretty crowded during peak season (May-September) but it is still totally worth the stop. In my opinion, one of the best ways to experience the Grand Canyon is to spend the night in the park. 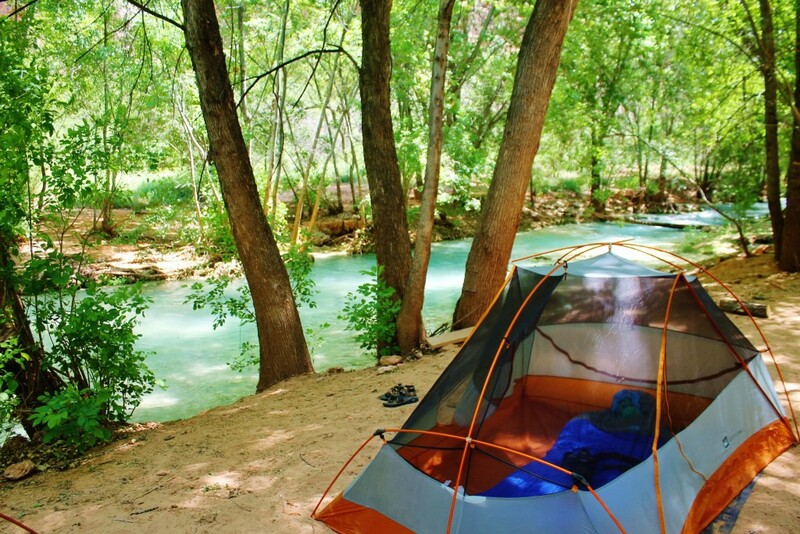 They have both lodging and campsites available. The reason I recommend this is because experiencing the night sky out there is truly incredible. Because there aren’t any big neighboring cities, there’s hardly any light pollution and it makes for some phenomenal star-gazing. The other best part of staying inside the park? Sunrise over Mather Point. I remember taking a solo trip out to the canyon and just sitting there by myself, wrapped in a blanket watching the sun come up over the canyon. Definitely made the list for one of the top 5 sunrises of my lifetime. 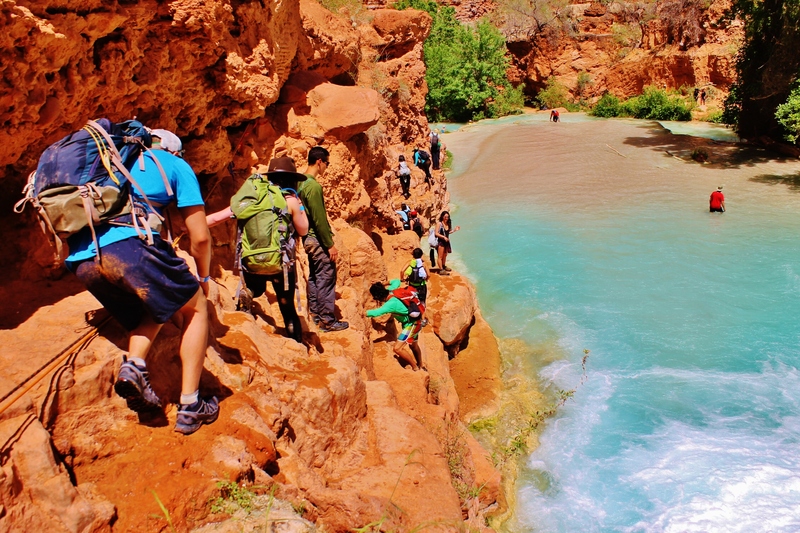 If you’re up for it, the South Kaibab Trail is one of the best ways to experience the canyon up-close. The trail descends into the canyon is a total of 7.1 miles. You can find a detailed description of the trail here. 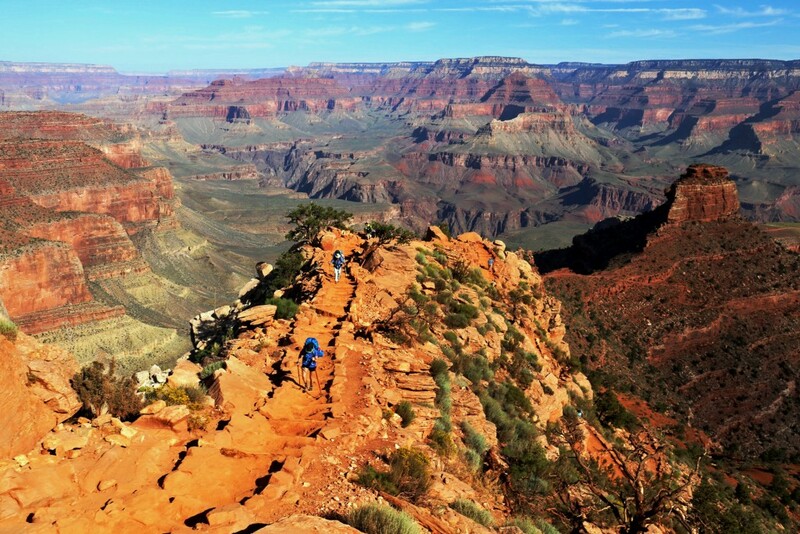 After a long series of switchbacks, the entire trail offers absolutely STUNNING views of the canyon. Just remember that because the trail descends, you will be going uphill on your way back so be sure that you bring PLENTY of food/water. I wouldn’t recommend hiking this trail in the heat of the summer when it is 100 + degrees out. 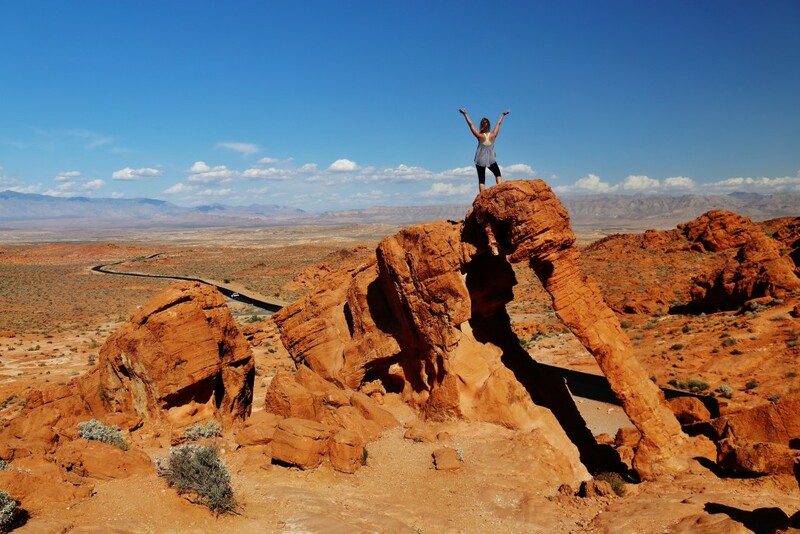 However, if you do decide to go during the summer or just aren’t in the best hiking shape, it is still worth it to go a mile or two on the trail because even the views from the beginning of the trail are amazing. Note: During tourist season and weekends the only way to get to the trail head is by parking at the visitors center (Mather Point) and then taking the bus to from there. (buses run every 15 minutes). If you have the extra time and money, I would recommend taking a helicopter tour of the canyon. 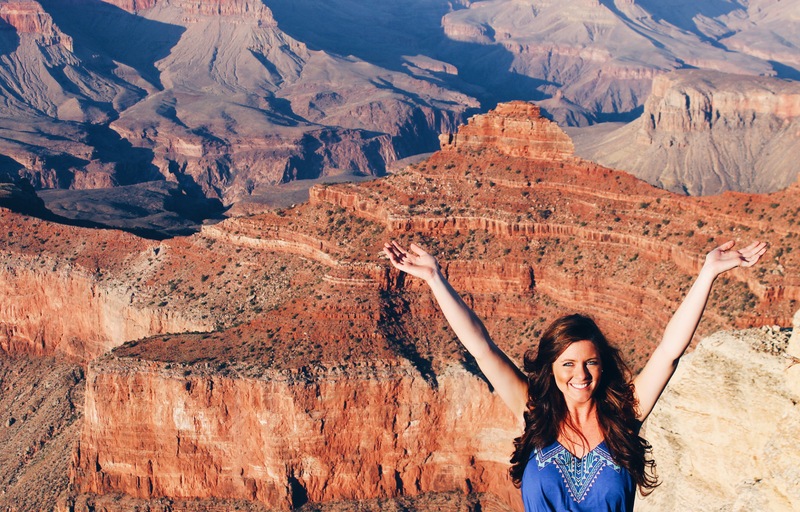 It offers a different perspective and lets you see just how massive the canyon truly is. 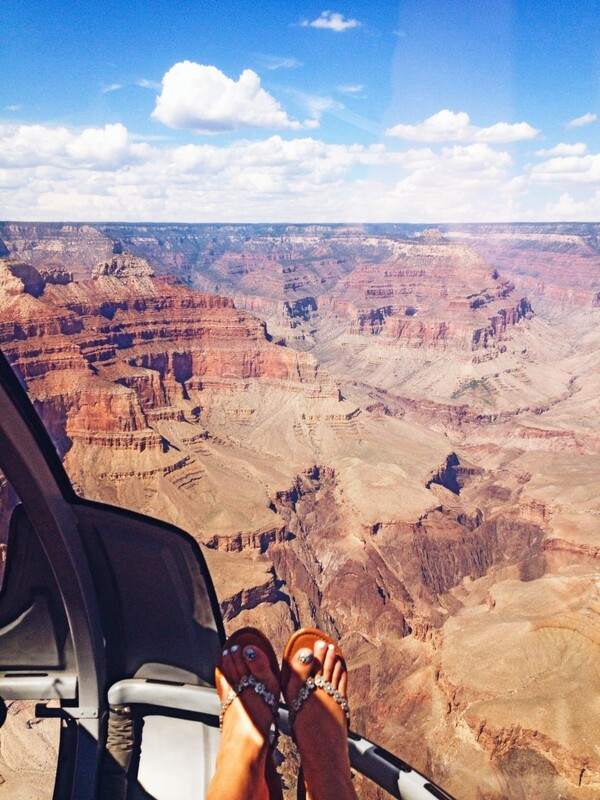 The first time I ever laid eyes on the Grand Canyon was from a helicopter. One thing that you can’t see from the ground is how much of a drastic drop-off and change in landscape there is. You’re just flying along, everything is flat and green and then BOOM, a plummeting drop of red and orange rock. Once over the canyon, you can see the Colorado River and how the landscape changes. Some rock is orange and red while there is some that is white and green. 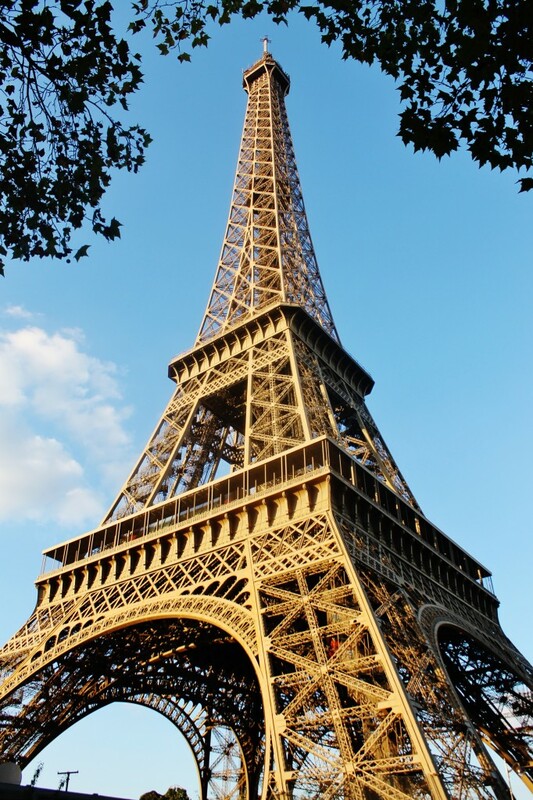 I used Papillon Helicopter Tours and you can find more information on them here. 1. 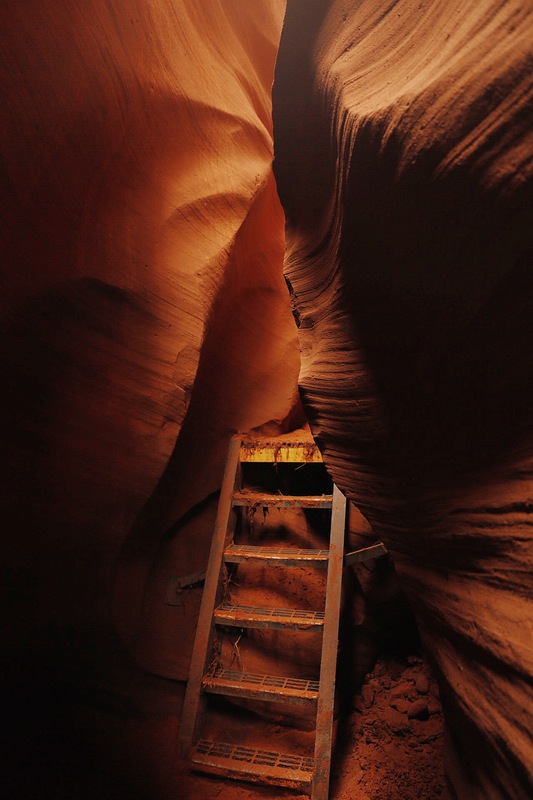 Because Antelope Canyon is on Navajo land, it is impossible to see Antelope Canyon without a tour and a guide. Most of the guides are very nice and knowledgeable. They also are know the good picture spots and will help you take them. The sightseeing tours are designed for tourists so if you want a slower-paced tour to take serious photos, you can book a photography tour here. 2. If you are going during peak tourist season (May-September), I would recommend making a reservation ahead of time. When I went in September we didn’t have a reservation and got in, but we did have to be a little bit flexible with the time and wait for a couple of hours. You can find more information on making reservations here. 3. Because the canyon has grown so much in popularity over the past couple years, you will have other people in your photos. Most of my pictures were snapped at the last second before another person came around the corner. I would wait for gaps of people or try to stay at the end of my tour group because in the summers, the canyons are basically a constant flow of people. This is why it is best to try to reserve the first tour of the day. I did that in the off-season a couple of years ago and we pretty much had the canyon to ourselves. 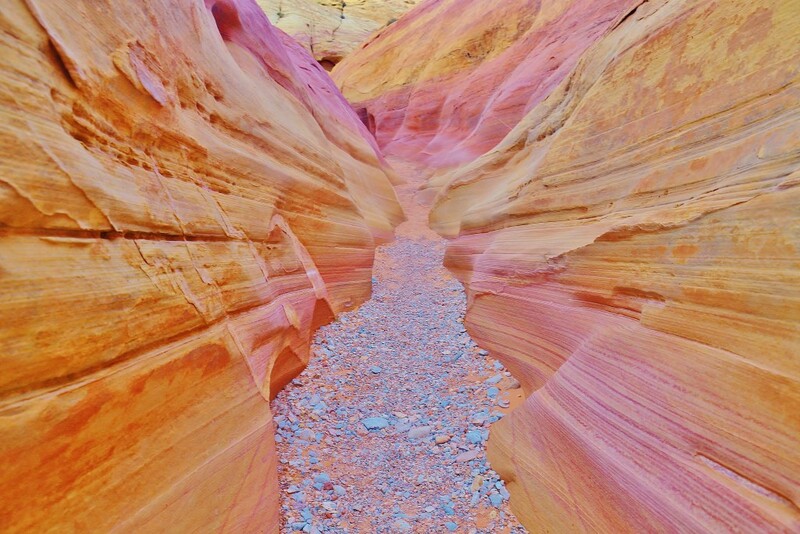 There are two different canyons that you have the option of touring, Upper Antelope Canyon and Lower Antelope Canyon. 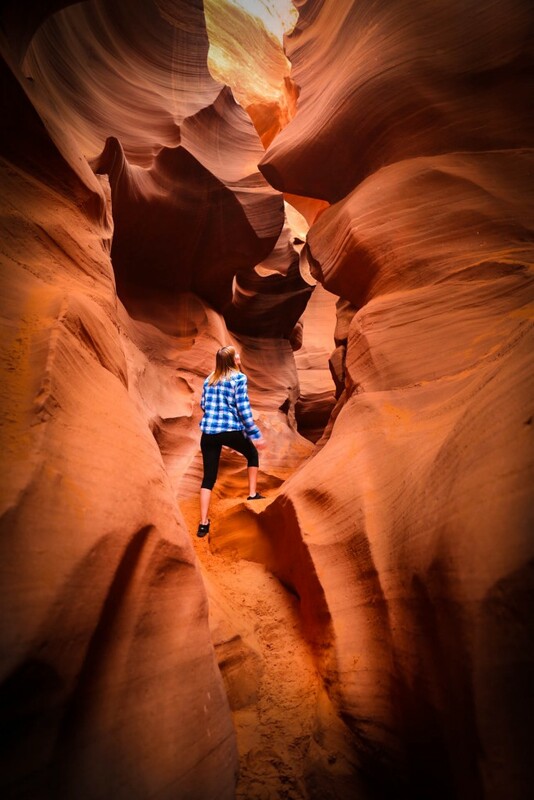 Out of the two, I personally prefer Lower Antelope Canyon. 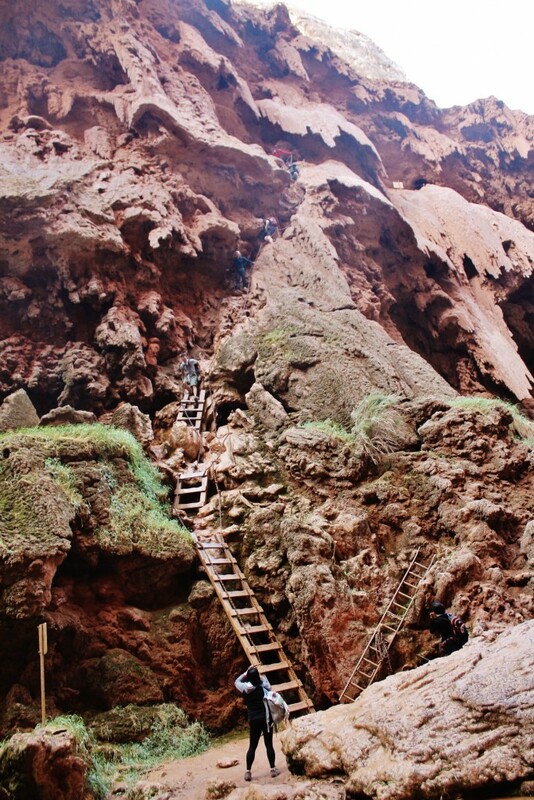 This is because it tends to be a little bit longer of a tour, less crowded, and you get to enter the canyon through a series of stairs and ladders that upper doesn’t have. Upper tends to be a bit more popular and is a little bit more expensive to get into. When I went, Lower Antelope Canyon was around $30 and Upper Antelope Canyon was about $50. At lower, you can park near the canyon and walk to you tour. At upper, your tour company will take you on a jeep from the parking lot to the canyon opening. 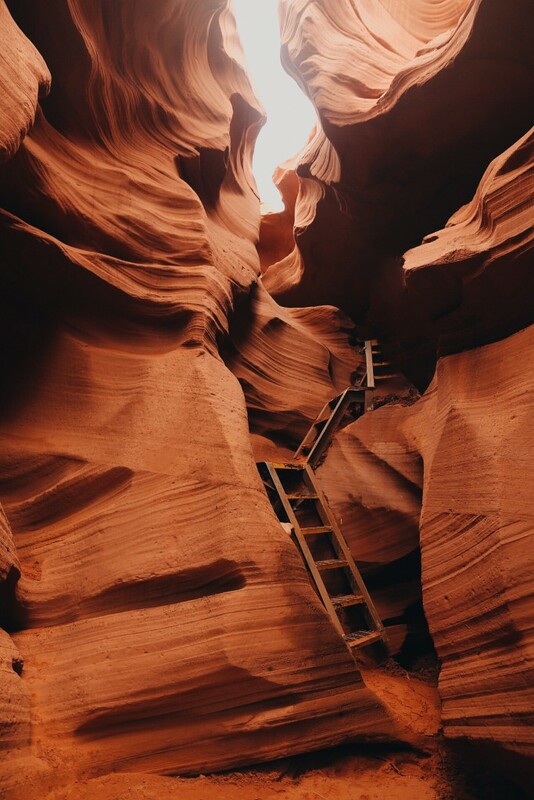 One cool thing about Upper Antelope Canyon is that around mid-day (exact times vary depending on the season), beams of light shine down to the floor of the canyon which you don’t get at lower. A guide will usually throw a shovel of sand into the light, so you can capture and amazing picture. So if you do visit upper, I think it’s worth it to research and go during the time of these light beams. If you’re visiting lower, the best time to visit is closer towards the morning or afternoon when the sun is lower in the sky so the lighting isn’t as harsh. 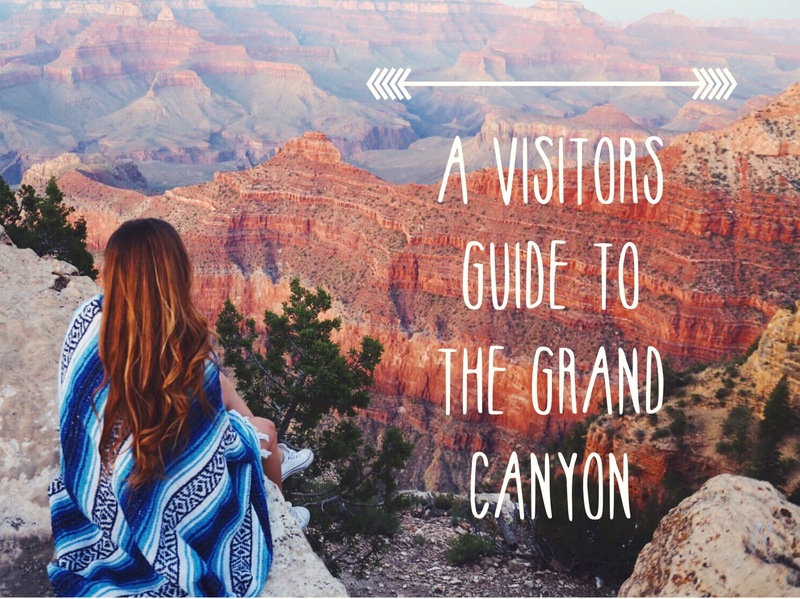 If you have the whole day, this makes it convenient to plan a visit to both canyons. Located only 5-7 minutes from Antelope Canyon is Horseshoe Bend. Horseshoe Bend is a drop-off that you can park and walk to. 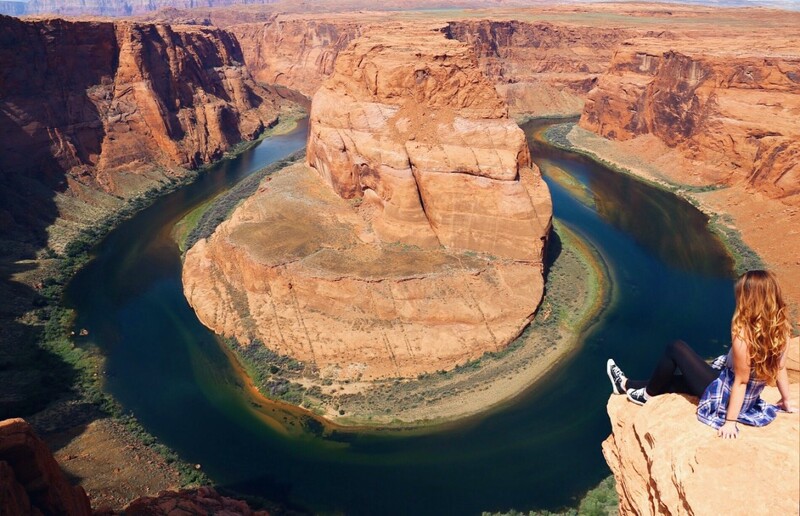 It’s a viewpoint of the Colorado River and is shaped like a perfect horseshoe (imagine that). Horseshoe Bend is totally free and super accessible so there is no excuse to miss it if you’re in Page. The parking lot can get a little crowded during weekends and in the summer, so I would recommend getting there before 9 a.m. or so. I went around this time and there were still a good amount of parking spots left and it wasn’t too crowded down by the edge. Once you park, the viewpoint is a short walk from the parking lot. (about 10/15 minutes). Tip: It’s good to bring a GoPro or a wide-angle lens or if you have one. Depending on where you stand, it can be difficult to get the entire view of the bend in the picture. I know because every time I go here I forget my GoPro so bring yours if you have one! 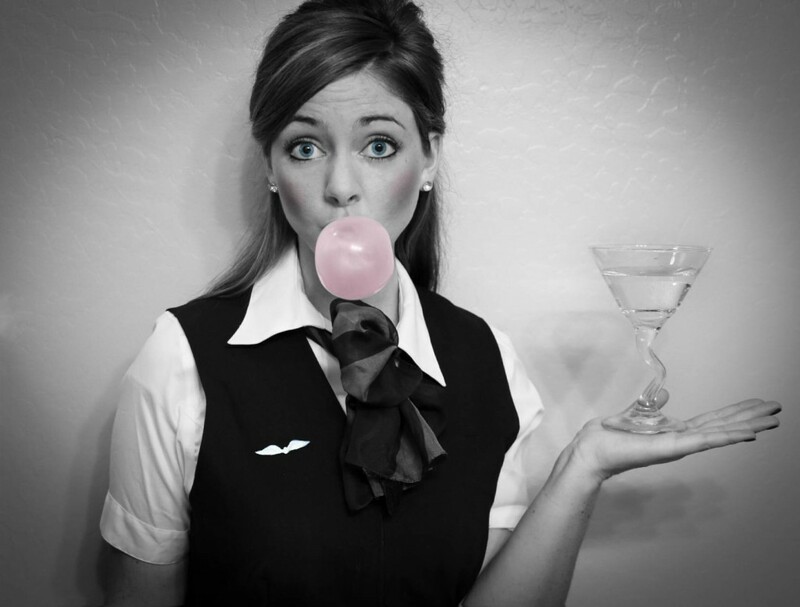 So You Want to be a Flight Attendant? So you want to be a flight attendant? Or maybe you’ve just been thinking about the idea and want to know a little more about the job to see if it’s something that’s right for you. Either way, I’ve put together some tips/insight to help you learn a little bit more and hopefully help you nail the hiring process! 2. 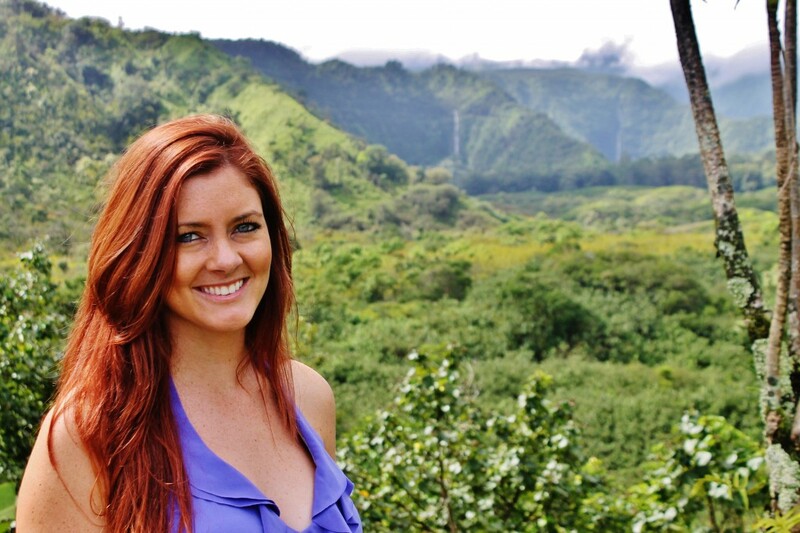 You DON’T need “flight attendant school” prior to being hired! If you get hired by an airline, they provide their own specific training geared towards the policies of the company. You can’t become a flight attendant without graduating through their program. So don’t buy into the general online flight attendant schools/classes because these are just people looking to rip you off and steal your money. What airlines DO typically look for prior to hiring is a strong customer service, medical, or safety background. 4. The main purpose of our job is SAFETY. Most people think that our job is just being friendly, serving drinks, and providing good customer service. Which we DO do… or most of us anyway ;). What people don’t know is that we are actually first responders and are there to save lives. In our training, we are taught how to successfully evacuate a plane full of people in a matter of minutes, put out fires, perform CPR, command a life raft, and how to respond in a variety of other emergency and medical situations. Believe it or not that stuff does happen and we are there for more than flashing a smile and pouring you a coke. Bonus points if you talk about safety in your interview! 5. You will have to work out of a “base.” Each airline has “bases.” In other words, a city that they operate out of. Each airline usually has multiple bases. If you are a reserve, you will most likely want to live in that base or have a crash pad because it’s impossible to be on call from another city. If you hold a line, then you can commute in from other cities and work your scheduled trips. So living in a different city than where you work can definitely be done in this job. Just know that sometimes it will be hard or make your working days a lot longer. 6. Yes, we fly for free… but we fly “standby.” Flying standby means that you don’t have a guaranteed seat and that you basically are on a list for the seats leftover that the airline didn’t sell to paying customers. It’s never been a problem for me because if the flight is full, flight attendants can take the extra jumpseat. The only time where it can be a little bit sticky is if you have more than a couple flight attendants wanting the same jumpseat. Most of the time, planes will have two or three extra jumpseats so you’re in the clear but if you were to be competing with someone for it, the seat usually goes to the more senior flight attendant, depending on your airline’s policy. 7. It’s not so much about how you look anymore. Yes, you still need to be groomed and presentable but there is less emphasis on weight and looks than back in the day. When I started out applying for this job, someone I knew very well tried to convince me not to apply because she had heard horror stories about flight attendants having to weigh in and routine beauty checks. For anyone wondering, this is so NOT true. Flight attendants DID have to weigh in back in the day. Heck, you basically had to be a supermodel but now it is more about your qualifications and personality. You do however, need to be a certain height to reach the overhead bin and be able to strap yourself into a jumpseat. 8. It’s not always glamorous. 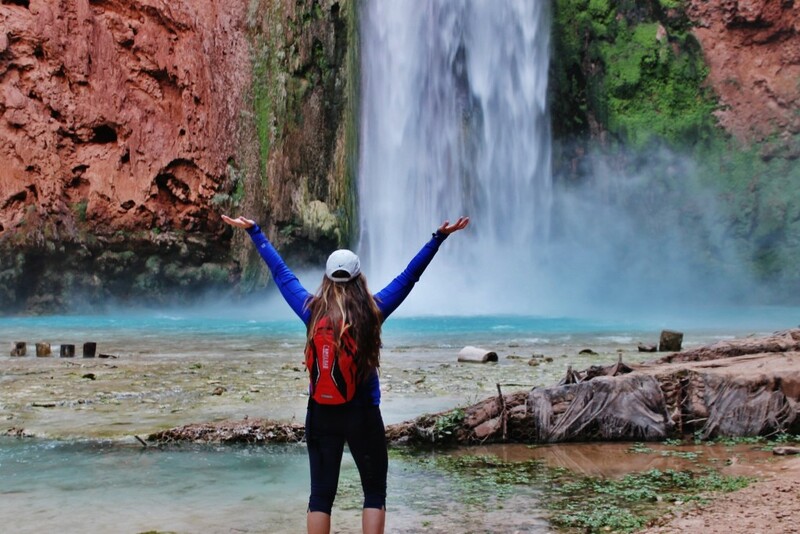 Despite what you may see on my instagram (@fly_with_jenna), being a flight attendant doesn’t always mean swimming with turtles in Hawaii or sitting at the top of waterfalls. On most of my adventures, I’m taking advantage of the free flights and exploring on my off days. The reality of this job can sometimes mean working 3 flights, dealing with rude customers, and then sleeping for only 6-7 hours in a hotel room in some random city just to wake up and do it again the next day. Overall, I would say that working as a flight attendant is one of the best jobs in the entire world, you just need to know that there will be some hard days and have the right personality. If you’re the kind of person who doesn’t like doing things on your off time, or get worn out very easily then this job probably isn’t for you. But, if you love being on the go, seeing new places, and the thought of being trapped a cubicle terrifies you, then you are probably reading the right post. Even though you deal with rude people sometimes, I’ve found that there are WAY more passengers out there who will make your day rather than ruin it. And those passengers tend to be the only ones that you remember anyway And even though you may be working a 12-13 hour day, the work is EASY. When I lay down at night, I’m not checking my e-mail or worrying about a deadline or meeting. As soon as I step off of the plane, I get to leave work behind me. And even though there are times when I get off a work trip and am running on very little sleep, it’s worth it because the next day I can wake up and go to any city I want. Flight attending is like any job in the way that there are both pros and cons. Just know that it isn’t glamorous 24/7 but that in the end, the good outweighs the bad. Before you do anything, be sure to join the group “Flight Attendant Career Connection” on Facebook. It is a community of flight attendants and aspiring flight attendants that is full of questions, tips, insider hiring information, etc. The purpose of this group is to help people become flight attendants. Flight attendants will also post when their airline is hiring. My friend found out that Southwest was hiring through this page since it wasn’t advertised anywhere. With some help from flight attendants on the page, she ended up getting hired! This is an EXTREMELY helpful and valuable resource for those of you who are seriously looking to find a job as a flight attendant so take advantage of it! My list of suggestions is pretty general to almost all airlines. If you want to find out more about the hiring process of a specific airline, there are many helpful forums online with people who have actually been to the interview so search one for your airline and be sure to go through ALL of the comments. It can be overwhelming but I found that was one of the biggest things that helped me prepare for my interview. Indeed and Glassdoor are both great websites that I used. 1. Start off by applying online. Almost all airlines start with an initial online applicaiton and will contact you from there. The best way to see who is hiring is by going to this website here. They have a list of all the airlines who are hiring and the links to each company’s airline application. 2. Once you have applied, the next step is usually a phone or video interview (it depends on the airline.) For my airline, I had an automated video interview. The questions would pop up on the screen and you had a certain amount of time to answer each question. Each answer was timed and recorded, which was kind of awkward so just be ready for that. 1. This kind of goes without saying but wear something professional. You want to look fresh and presentable. There’s a reason it’s a VIDEO interview. Ladies, you will want to wear your hair pulled back and neat. Men, I would recommend being clean shaven! 2. Review a list of possible questions. The questions are going to be pretty general for the interview. Look up interview question lists. For example “Tell me about a time when ____.” are pretty popular questions for airlines. Brainstorm a couple of scenarios that could act as answers for different types of questions. For example “One time I was interning at a wedding planning company and while I was working a wedding, the caterers forgot their serving tongs. So, I quickly ran to the closest store and got some rather than waiting for them to go back and get them.” This is a versatile answer that could be applicable to many questions like “Tell me about a time when you had to be quick on your feet.” “Tell me about a time when you went above and beyond for a customer.” “Tell me about a time when you took initiative in a situation.” etc. Having a list of flexible stories on hand is one of the tricks that got me the job. Especially because the airlines like to ask you about situations and have you tell them stories rather than general questions where you just give them your opinion. 3. ALWAYS use the S.T.A.R. method. Never go right into answering a question. Take a couple seconds to gather your thoughts so you speak clearly and confidently. Most interviewers specifically look for the S.T.A.R. method so be sure to try and follow it when answering most of your questions. S. – Situation What was happening? Give the interviewer a little background into the situation to which you are describing. T. – Task What was the problem that you had to fix? A. – Action Explain what you did to solve the problem. R. – Results What was the outcome? How did you help better a situation and what did you learn? 3. Remember your answers. If you pass the initial video or phone interview, the next step is the “cattle call” interview and if you make it to the one-on-one interview round they will most likely ask you similar if not some of the same questions from the phone or video interview and you will want to be consistent! Most airlines have what they call a “cattle call” interview. It consists of a large group (usually around 100 people) and from this large group they only pick a few people to be hired (8 people were picked from my group of 100). The interview is what you advance to if you pass the phone or video interview. Some companies will skip the phone or video part and start from a straight cattle call. The interview usually has several rounds and can last from 4-6 hours depending on how far you get in the process. There’s usually an introduction where someone talks about the airline and gives you details about the job. Next comes a self-introduction round where they will make you say something in front of everyone (your name, where your from, what you makes a good flight attendant, etc.) In both of my interviews that I attended, the self introduction parts were timed at one minute so be sure that you be conscious of that. It was awkward when people went over time and those that did didn’t make it to the next round. The next phase is usually a group evaluation where they split you into groups and give you a task. You will usually have someone watching your group. Make sure you remember that this is a GROUP evaluation. In other words, they are seeing how you interact with others and behave in a group setting. Some airlines will try to distract you with a task that seems related to the job or a competition (this can cause people to get bossy or competitive), but remember they are really watching to see how you get along with others. Don’t be controlling and be a good listener, but at the same time take some sort of initiative and offer up some good ideas to the group. You don’t want to be super bossy but at the same time you don’t want to just sit there quietly either. The last round is usually a one-on-one interview. This should be the easy part since you have kind of already prepared with the video interview. Just remember S.T.A.R. and have some versatile scenarios on hand! 2. Someone is ALWAYS watching you. Yes it’s true. This is actually just like a George Orwell novel. You are constantly being watched. So talk to people. Are they observing you just sitting in a seat by yourself? Or are you out there making friends. Go talk to someone you wouldn’t normally talk to. Everyone has a story and usually at these interviews, the stories are pretty interesting. 3. Take Notes. It’s the little things that set you apart from the other hundred people there. I promise you, if you bring your notepad and are writing during the presentation, they will notice. I remember it feeling kind of weird because only a couple people were doing it, but trust me that’s something they look for. It shows that you are organized and taking the interview seriously. 4. Wear a watch. This may seem like a silly detail but a working wristwatch is one of the required items by the FAA when reporting for duty as a flight attendant. No working wristwatch, and you can be fined. The watch tells them that you are dependable and have good time management skills. 5. Keep the outfit simple. You don’t want to wear anything TBT (trendy, bright, or tight.). If your outfit is any one of those three things then you need to wear something else. I wore a simple black two piece suit with a skirt down to my knees, simple make-up, hair pulled back, and black two-inch heels. You want to stand out to the interviewers in your mannerisms and behaviors – not your clothing. 6. Don’t let your nerves take over! Smile! With so much to remember and so many eyes watching you, this process can be SUPER stressful. Don’t forget to take a deep breath and relax! Be yourself! Nobody wants a fake, stone-faced flight attendant. Let your personality come out and be friendly. It’s only 4-6 hours of your life at the most so try to just enjoy it. 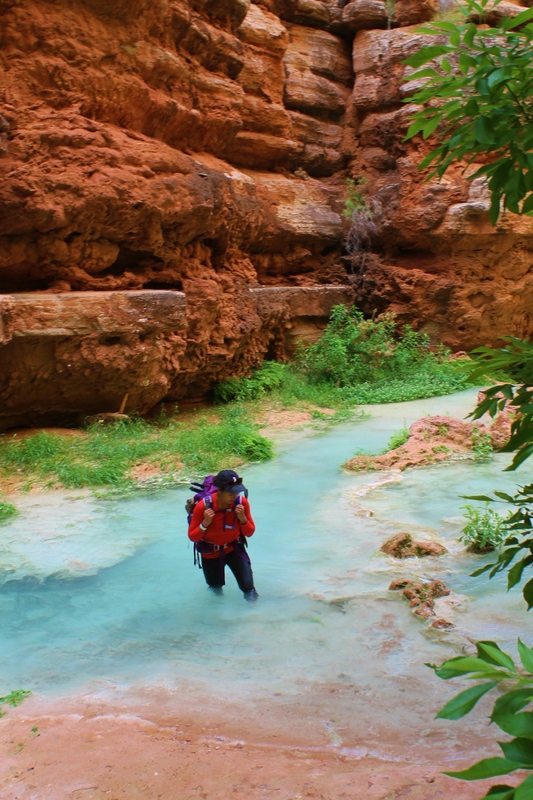 A couple months ago, I went on my favorite backpacking trip of all-time to Havasupai. This Indian reservation that can only be reached by a 10 mile hike into the Grand Canyon (or helicopter) is unlike any other landscape I’ve ever seen before. The long hike in can be tough with a 50 lb pack on your back, but I think that’s what makes the final destination even that much more gratifying. I’ve put together a guide to hopefully help make that hike and planning for your trip a little bit easier. I went on my camping trip with a big group of 25 strangers guided by the fabulous Mina Young Lee, who basically taught me everything about this place. Our trip took place in April 2015. We specifically went during April because it is not yet monsoon season and you are at less of a risk for flash floods. The weather is also not too hot at this time of the year, which makes the hike in more bearable. We spent five days/four nights there. My recommendation is that if you are taking the time and effort to make this trip, you might as well plan to stay for a little while (not just the weekend) because you’re not going to want to leave. The first night we camped out at the base of the trail head, which I HIGHLY recommend doing. 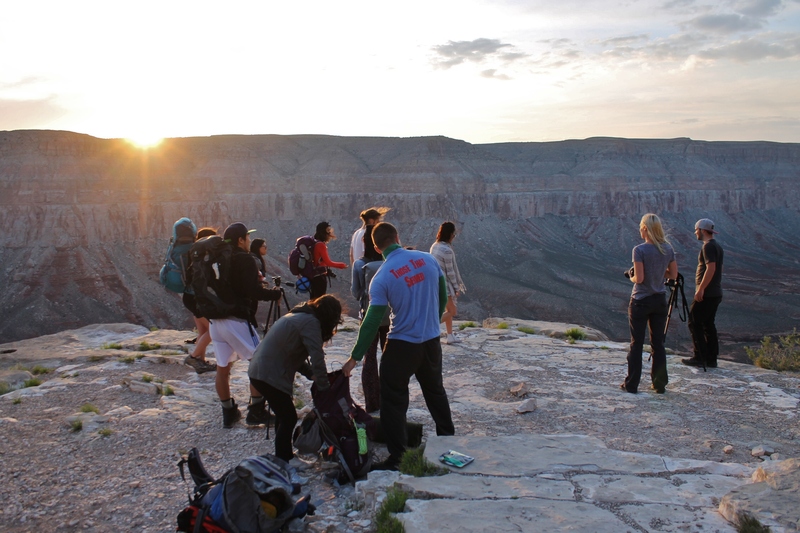 Partly because there’s nothing like camping on the edge of the Grand Canyon looking up at a sea of stars, and partly because it makes such a big difference to start the hike in before the sun. This way, you aren’t hiking in the heat of the day and you get to make the most of your time at the campgrounds. Starting out early also means you get a better choice of a campsite. 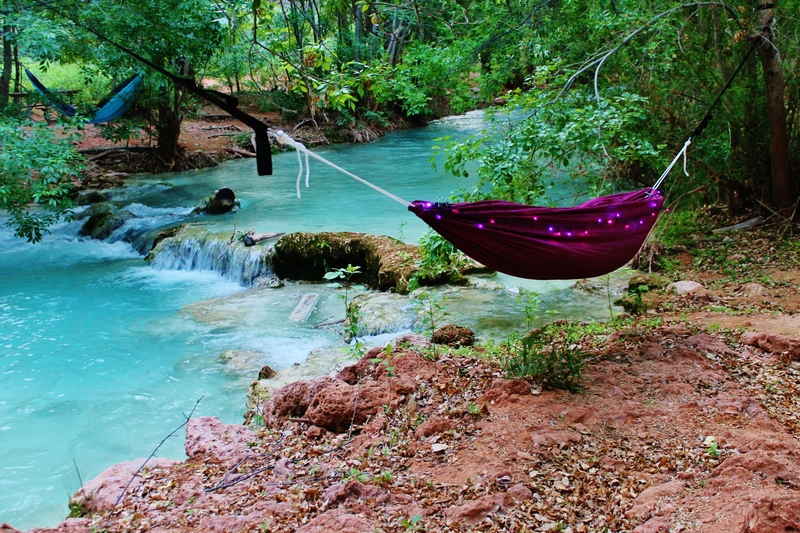 We got a perfect spot right next to the creek, which was the perfect lullaby every night when it was time for bed. Packing is what can make or break you on this trip because you want to pack as little as possible since it will all be on your back for 10 miles. But at the same time, you don’t want to forget anything important. Below is a list of what I packed and I made out just fine. Clothes – I went in April, which had highs in the 70/80’s and lows in the 40’s. Obviously look up the weather for the time of year that you are going and keep in mind that it can always change. Saving space in your pack is really important. Clothes take up a lot of room so an outfit for each day is almost impossible. Just bring the necessities and you will be glad you didn’t over pack. You can also wash your clothes with Campsuds in the creek. Note: you can always forget the MRE’s and do pb&j if you are only staying a couple of nights but that gets old quick and after a long day of hiking it really is nice to have a warm meal. Note: You can pay to have your packs brought in by a mule, but you need to reserve them ahead of time and it is a rough ride down so there is no guarantee that your bag wont have rips or have things shaken out of it. Now that you know what to pack, you need to know where to go. Here is a little bit of info/pictures of the main points that you can’t miss in order of how they will appear on the hike. 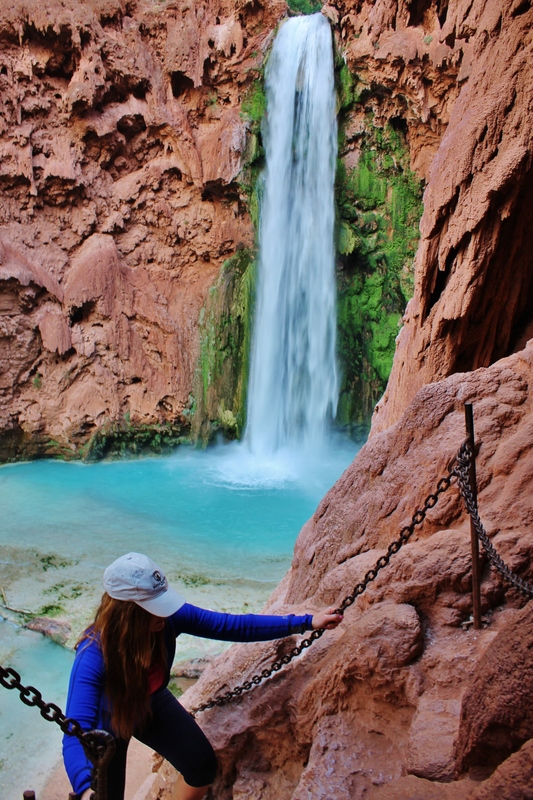 Navajo Falls is the first waterfall you will see on the hike in before reaching the campgrounds. 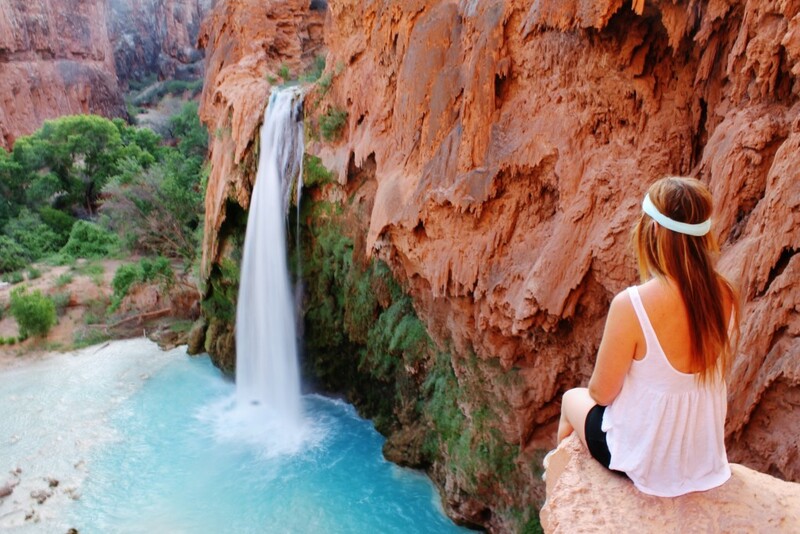 It isn’t too far of a walk from the campsite when you want to come back and swim or jump off of the waterfalls. 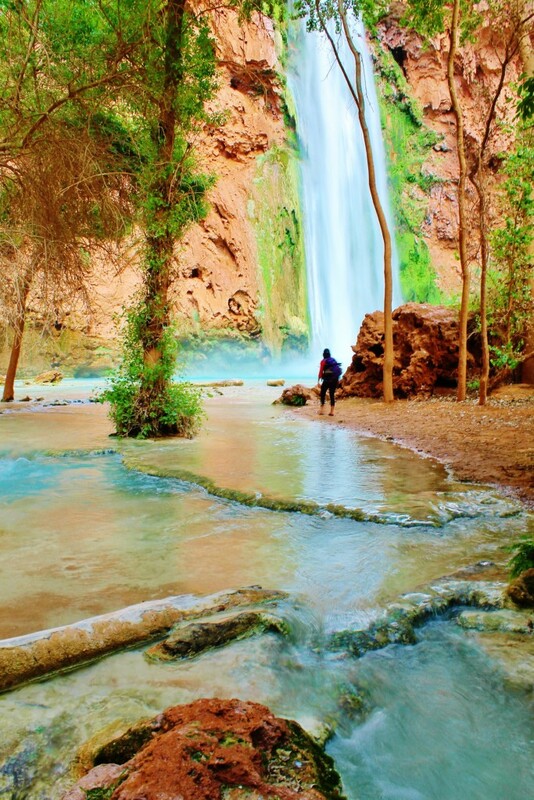 There are two falls, Upper Navajo Falls (pictured above) and Lower Navajo Falls. 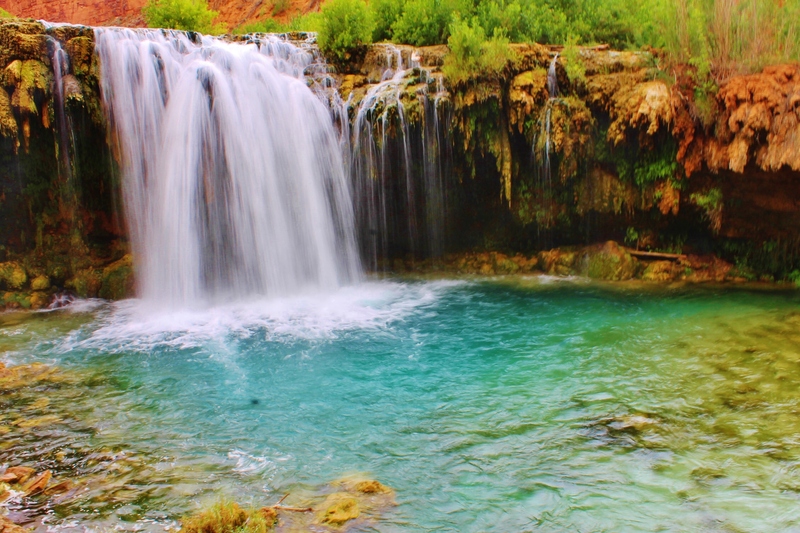 I wouldn’t recommend swimming around Upper Navajo Falls just because swimming disrupts the ecosystem there, but we did swim in lower Navajo Falls. It was neat because you can jump off of these falls and go in and play around behind the fall. Once you reach Havasu Falls, you know you are pretty much at the campsite. This is the waterfall where most people at the campsite hang out. There are picnic tables and people will be swimming, wading in the water, and jumping off little cascades. 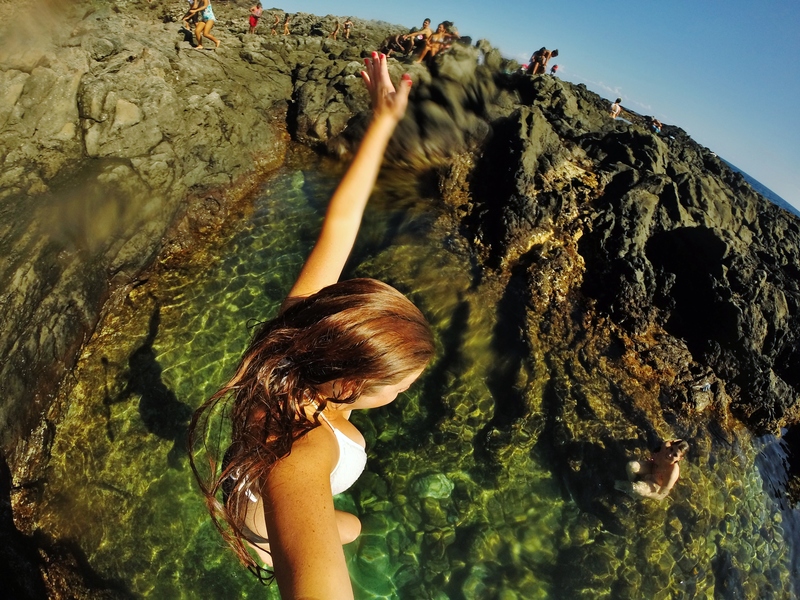 For the daredevils out there, there is a place where you can cliff jump. There is a little ledge to the left of the waterfall where you can climb up and jump. 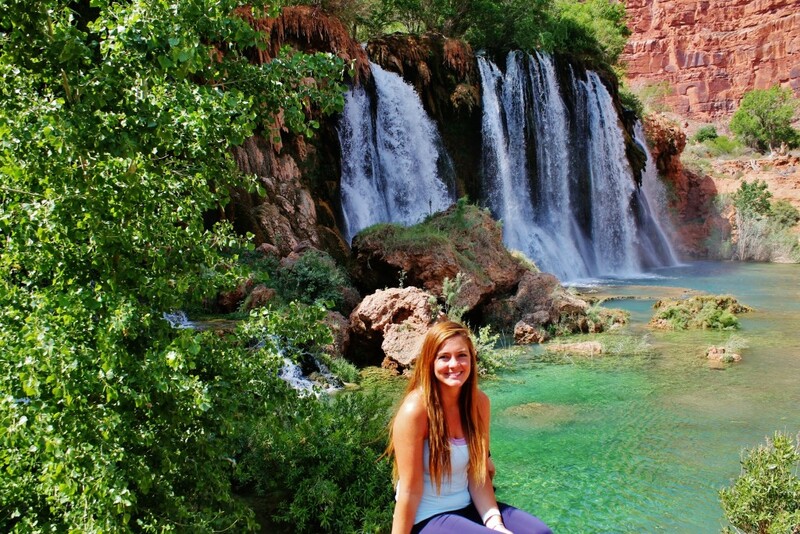 Mooney Falls was probably my favorite out of the falls. Even though you can’t swim in them, you get to descend 200 ft to the base of the falls assisted by chains and ladders. 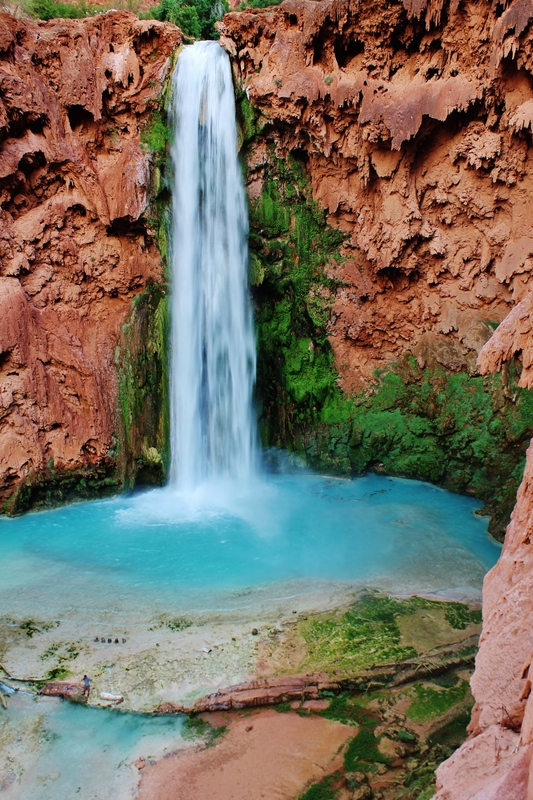 The falls are located right at the end of the campsites and for those who have a fear of heights/don’t feel like making the descent down, there is a perfectly good spot to stand and admire it from the top. The falls got their name from miner James Mooney who fell down the falls to his death. There is just something exhilarating about climbing down the side of a waterfall while you are being sprayed by its powerful mist. This descent is also necessary if you want to continue on the hike to Beaver Falls. 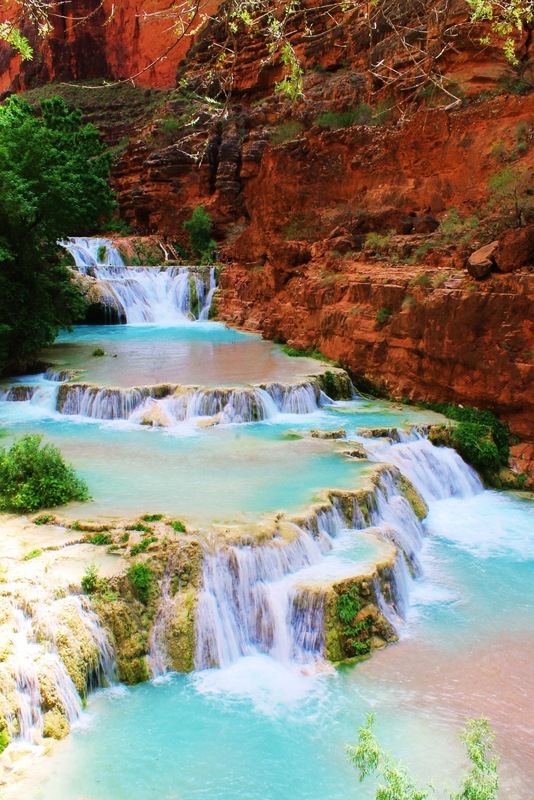 Beaver Falls is an additional 3 miles from the campground but the extra hike is SO worth it. The whole hike there is so scenic and beautiful that it would be an absolute crime to skip it. It’s best to start out pretty early because the place can get crowded during the day. You will pass cliffs, cascades and even get to scale a wall! I put waterproof shoes on the packing list because you will be crossing the river several times. Make sure you bring plenty of water and snacks because there isn’t really anywhere to fill up after the campgrounds. Below are all pictures from along the hike. The trail there can be a little bit tricky to follow at some parts. You can find a more detailed description of how to get to Beaver Falls by clicking here. So on our trip, almost everyone fell victim to the notorious evil squirrels. These squirrels are after your food and they will stop at nothing to get it. They will open your bags, they will open your tent, and they will even chew holes in your bag or tent if they smell any kind of food. One couple that was with us got ALL of their food stolen except for some Cliff bars. Luckily, we all had enough food to help them out but it’s really important that you pack your food in the right way. I was one of the lucky few who didn’t get anything stolen. So how do you outsmart these sly little creatures? The scent is the one thing that will give your food away. So mask the scent and you’re golden. I put my food in double freezer bags and always kept EVERYTHING in my tent, in my backpack with the zipper strings tied together. Be smart and pack carefully because being 10 miles into the Grand Canyon with no food isn’t a joke. But if you do end up falling victim to the squirrel bandits, there is a small general store in the town of Havasupai about 2 miles from the campsite (4 miles round trip). As you may know, reserving a campsite here is NOT easy. Our guide was on the phone for three days straight pressing redial until she finally got to talk to someone. She called immediately after reservations opened up for that year (Feb. 1st). So be prepared to be trying for a couple of days in the beginning and plan early. (She called in Feb for an April reservation). You can find the reservation link/number here. 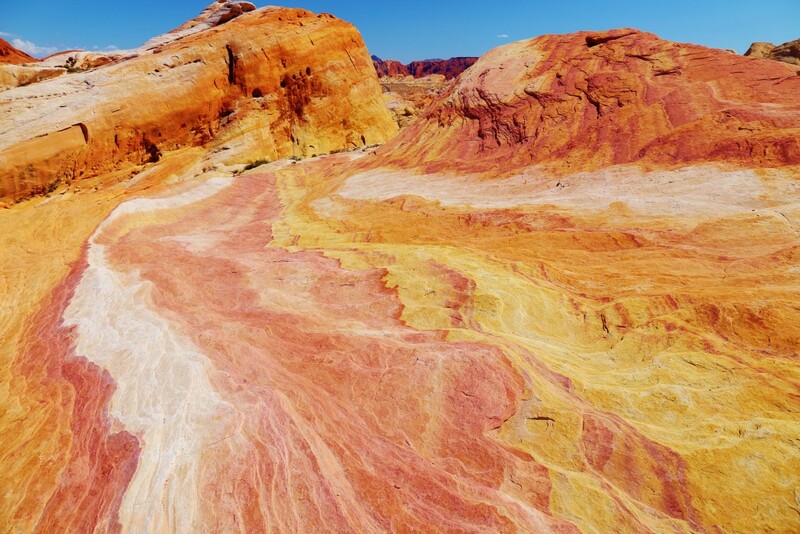 Some people call it the hidden gem of Vegas. 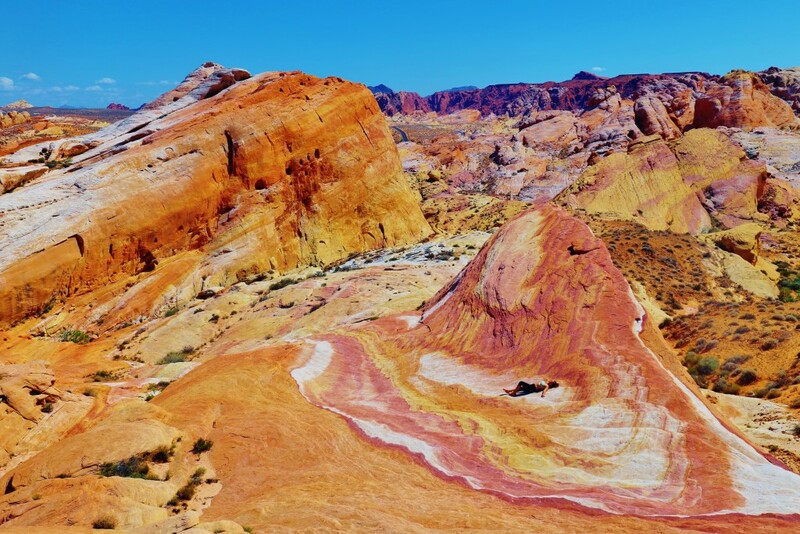 Located only 50 miles outside of the strip, Valley of Fire is a perfect place to escape the crowded Vegas streets. -The state park can get EXTREMELY hot in the summertime, so if you think you have enough water and snacks…double it. We went in early May and were running to the visitors center every two seconds to buy more Gatorade so be prepared! 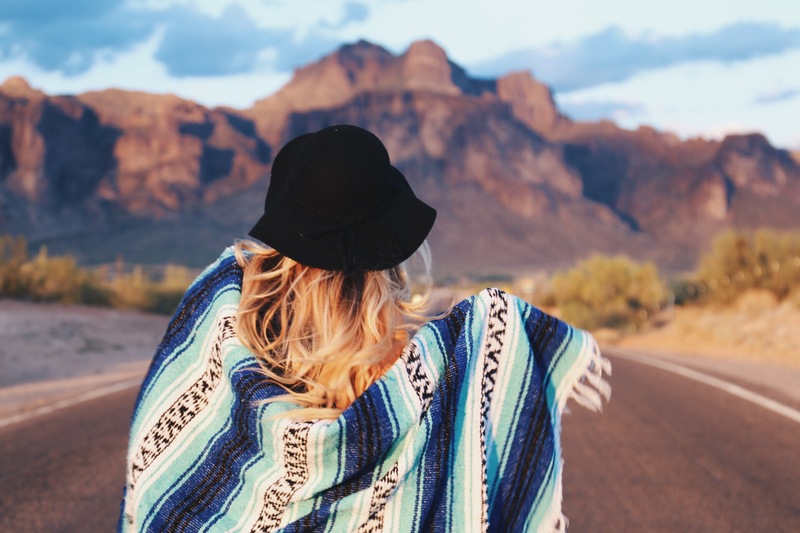 -It is essential to bring comfortable waking/hiking shoes, sunscreen,hat, and sunglasses, and DON’T forget your camera! – It is very helpful to get a park map when entering Valley of Fire as things can be a little off the beaten path with no signage. If you do have trouble locating something, the park rangers at the visitors center are very helpful. We went in and showed them a couple pictures of what we were looking for and they marked it out on the map for us. Crazy Hill is located off of the third parking lot past Rainbow Vista. The parking lot will be on the left side of the road. Once in the parking lot and having your back to the road, you will see a wash that starts from the far right corner of the parking lot. Follow the wash down for about 5-7 minutes of steady walking and veer a little to the right and you will see the hill. Note: There really isn’t any parking close to dips 4 and 5. We ended up parking in the third parking lot and walked to the dips. It is a little ways and there aren’t any clear walking paths so be safe and watch out for cars. 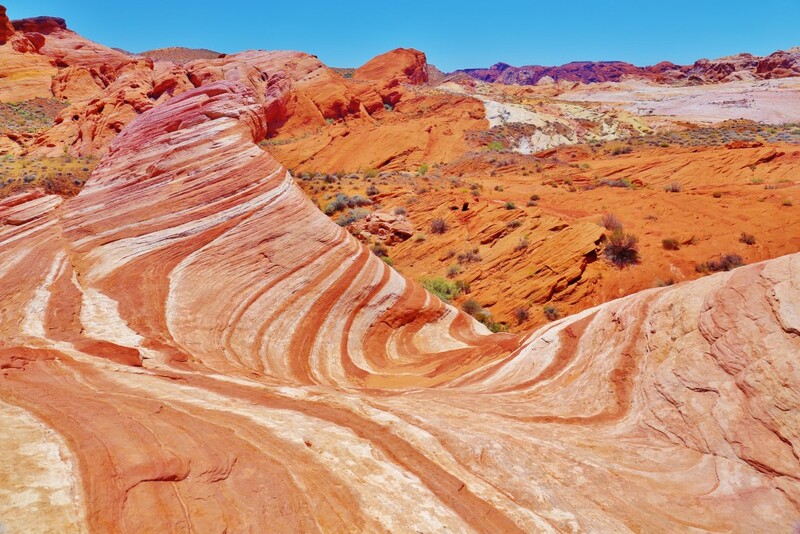 Along with Elephant Rock, the Fire Wave is one of the most iconic formations at Valley of Fire. There are a couple of ways to get to there. One is a trail located across the street from the third parking lot (same parking lot for Crazy Hill). However, we just kept on walking past the slots and stayed along the wash trail and eventually ran into it on our left hand side. You can also find more detailed directions about how to get to the Fire Wave here. We liked this spot so much that we came back for sunset. The way the setting sun lit up the sandstone was breathtaking. 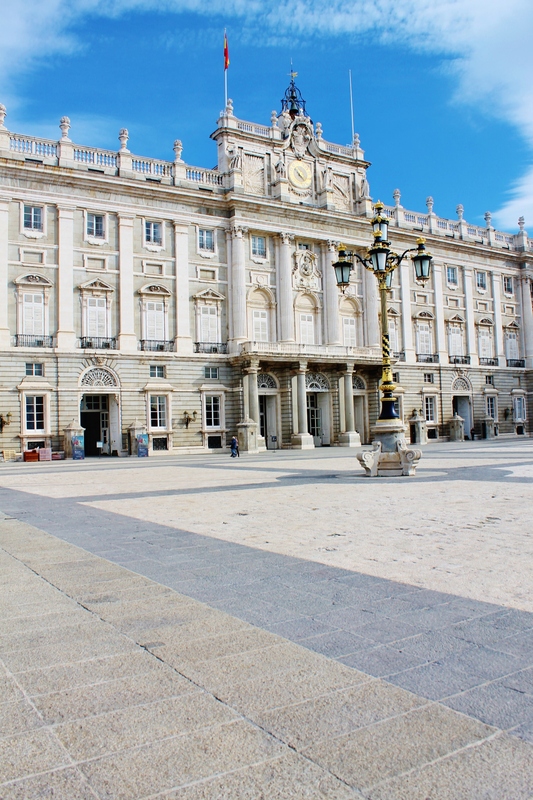 The Royal Palace is a lasting piece of Madrid’s history and culture. 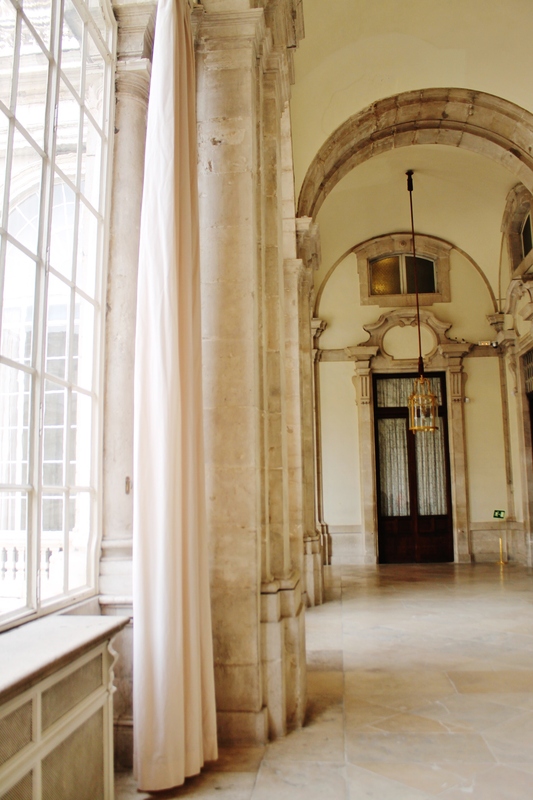 Once inside, you feel like you have been transported back in time. The architecture is absolutely stunning along with all of the artwork and furniture. 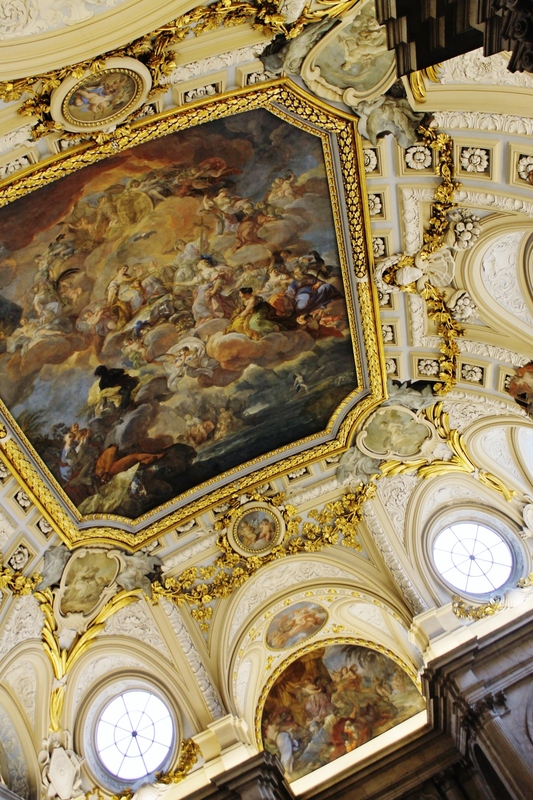 I was mesmerized by all of the detail that went into every ceiling throughout the palace. 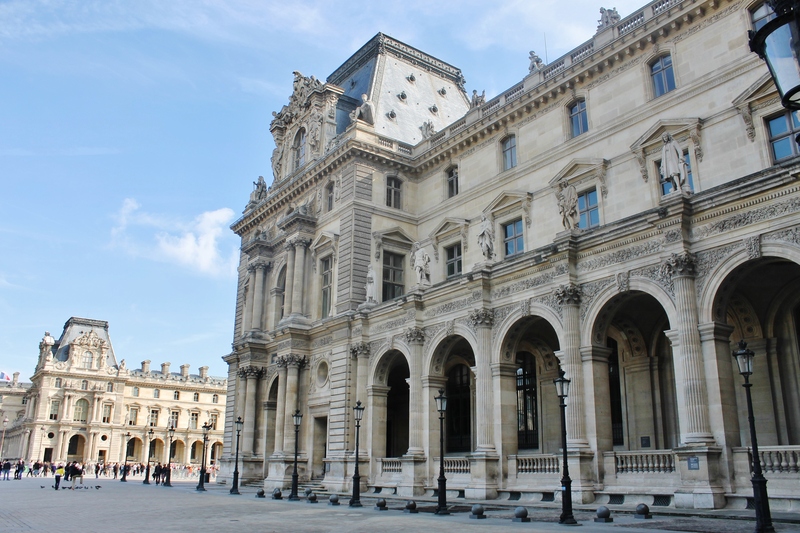 Everything is so well-preserved and you get to see first-hand how royalty lived. We paid about 10 euro for access into the palace and an English speaking guide who was as nice as could be. 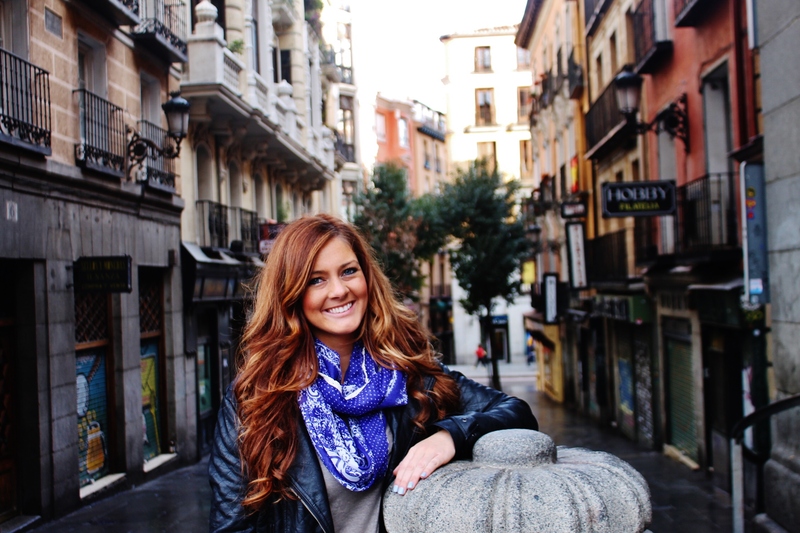 She was extremely knowledgeable and passionate about Spanish history. Note: You are not allowed to take pictures in most parts of the palace and they take the rule VERY seriously so just be aware. 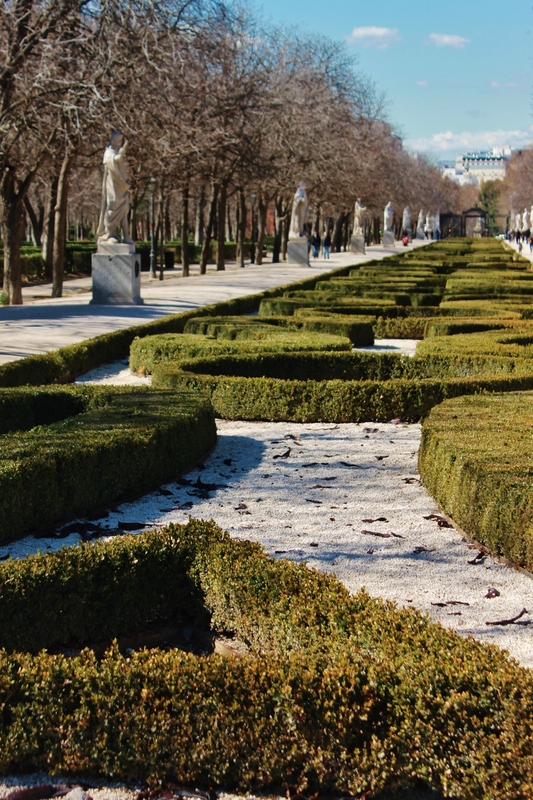 Full of street musicians, beautifully landscaped grounds, and lots of sunny patches to relax. 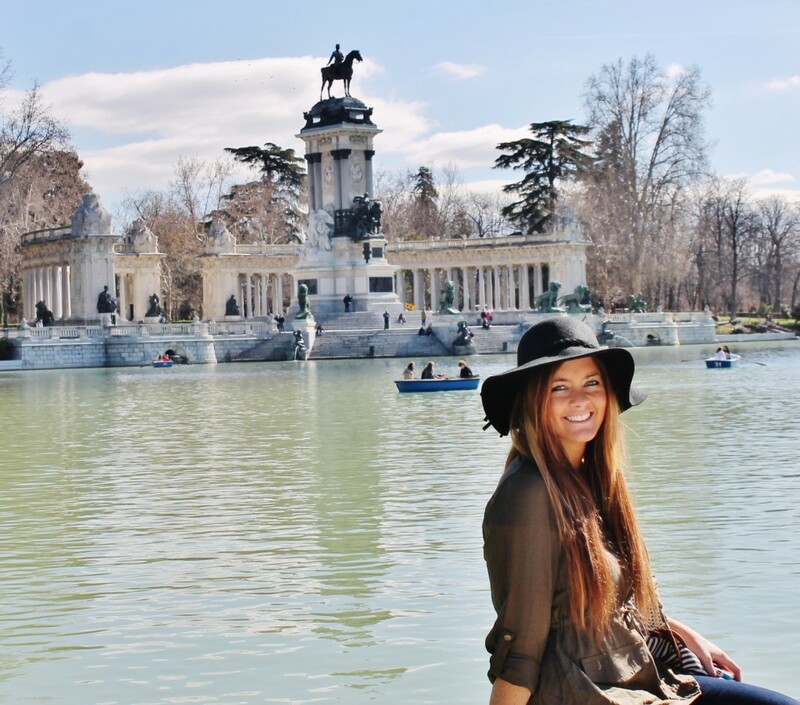 Parque de El Retiro in a way resembles Central Park. It is also home to the Palacio de Cristal (the glass palace) – pictured below. There is a lake with rowboats to rent at a decent price. 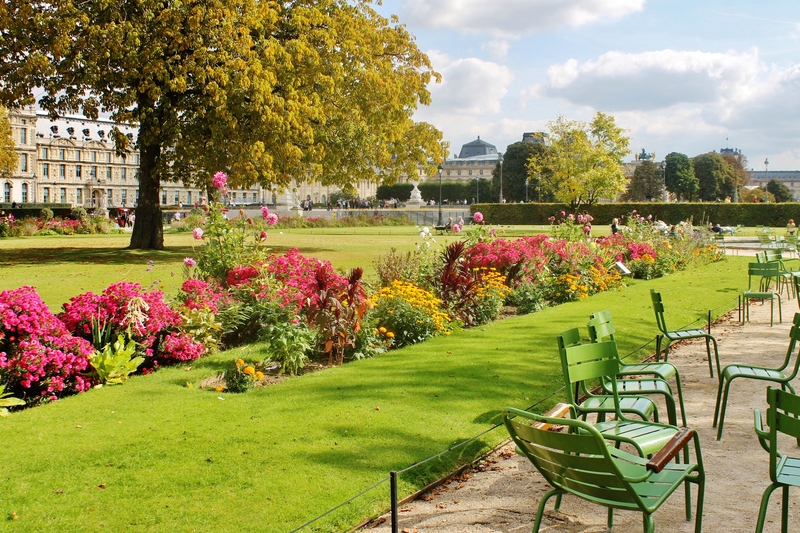 Pack a picnic of fruit and cheese and take in all this park has to offer! 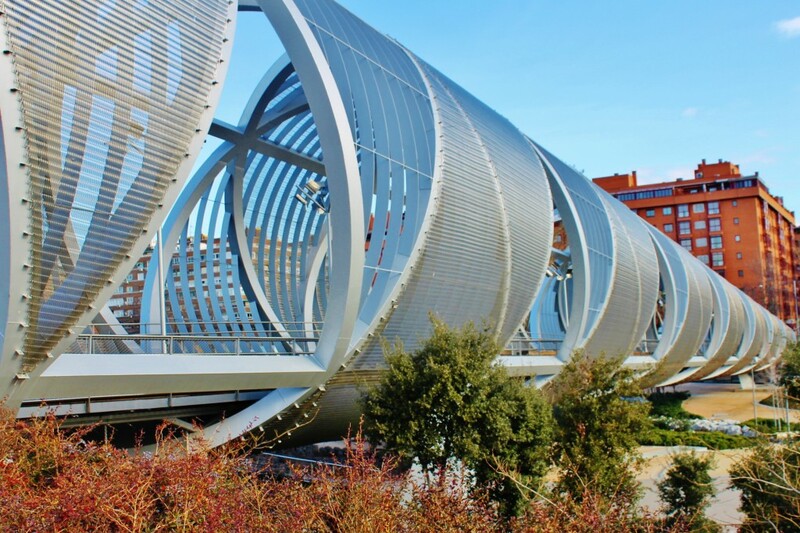 La Latina is a vibrant neighborhood located right outside Madrid’s center. 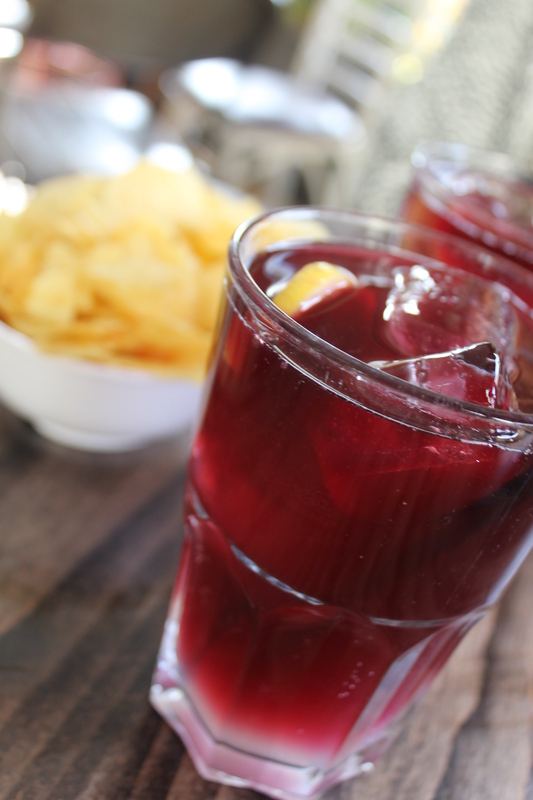 There are many restaurants that provide an atmosphere great for enjoying drinks and tapas. 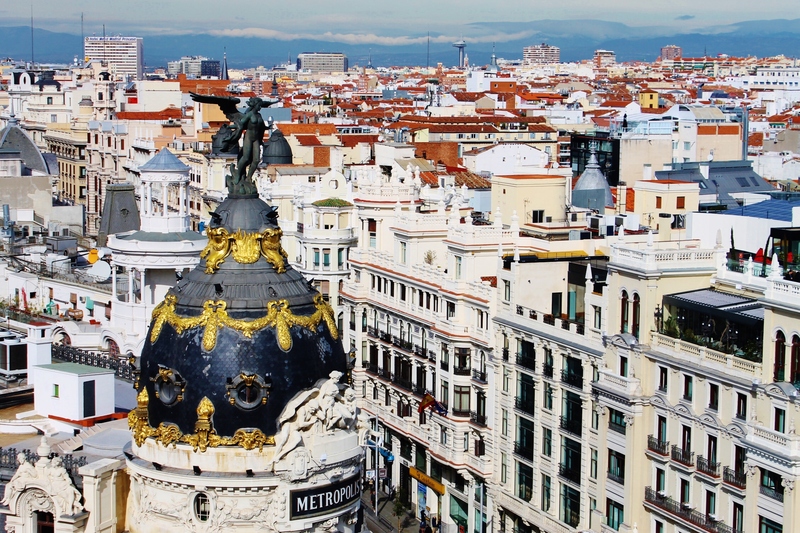 The great thing about this area is it tends to be a little bit less touristy and you can experience Madrid more like a local. My favorite restaurant was El Viajero. We asked to dine in the upstairs room which has a lovely view of the streets down below. If you go here you MUST NOT LEAVE without trying one of their mojitos. 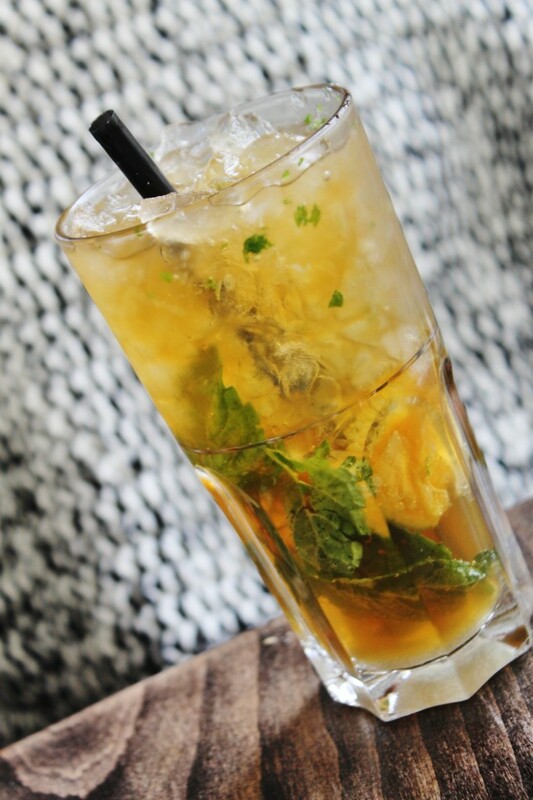 I don’t really even like mojitos and I wanted to order five more. I would also recommend the spanish omelet (pictured below). It was gone from my plate in a matter of seconds. 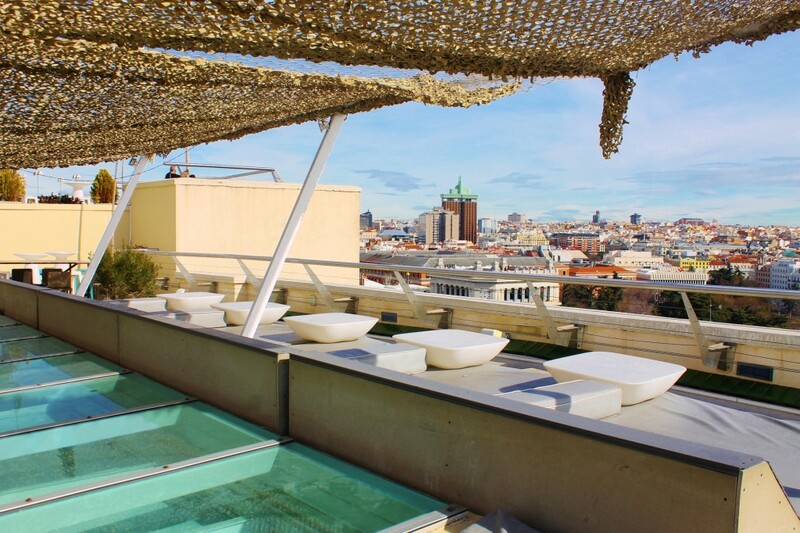 For one of the best rooftop views of Madrid, this is the place to go. It’s only three euro to get to the top. There is also a cafe downstairs if you need any refreshments. The rooftop also turns into a bar at night. 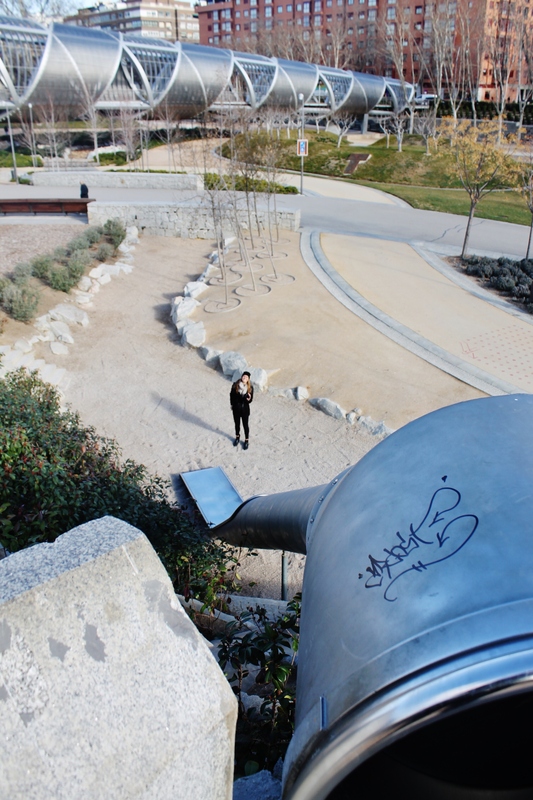 Don’t forget your camera and be prepared to be amazed by the almost panoramic view of this beautiful city! 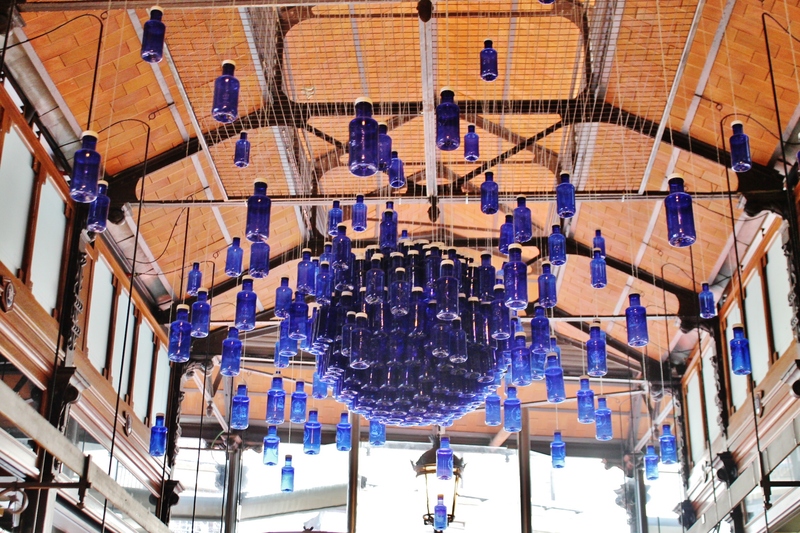 The Mercado de San Miguel is only a short walk from the central Plaza Mayor. 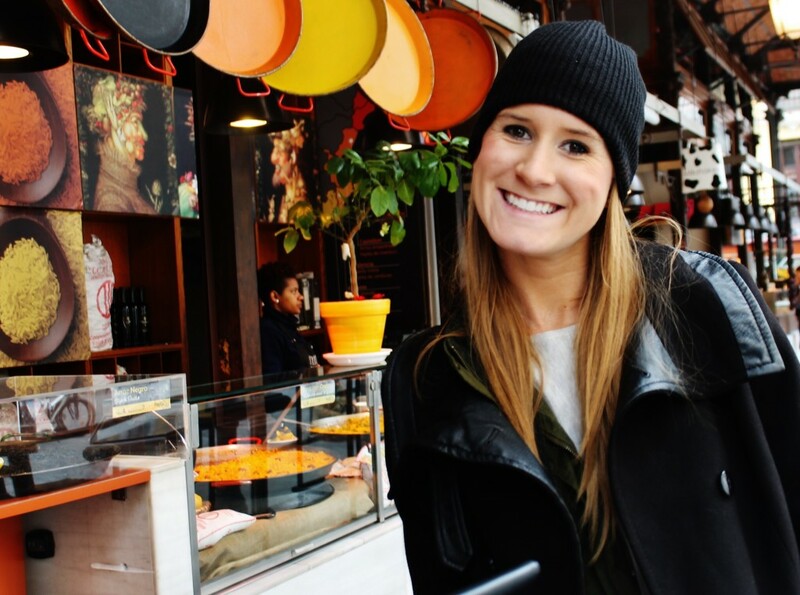 It is an old-style market that has everything you could possibly imagine food-wise. 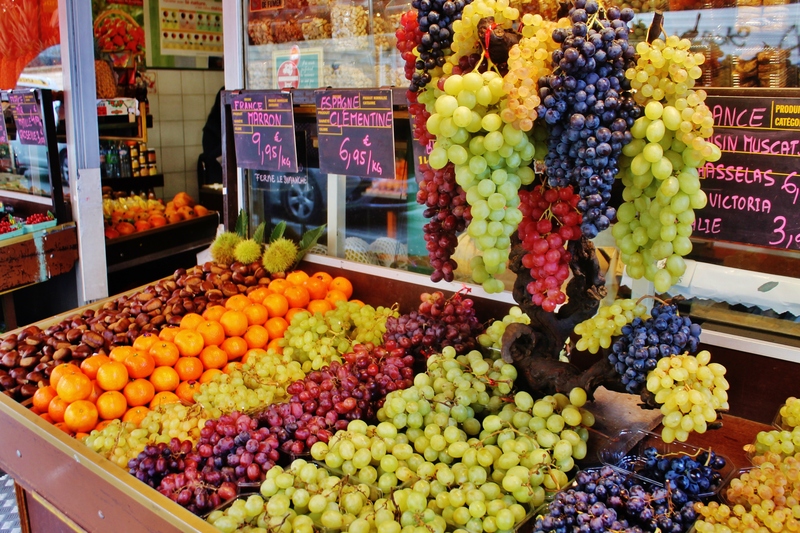 Wine, pastries, tapas, cheese, pizza, paella, fresh fruits and vegetables, and seafood are just a few of the things you will find in the expansive market. The market attracts high volumes of tourists but locals also come to enjoy all that the market has to offer. 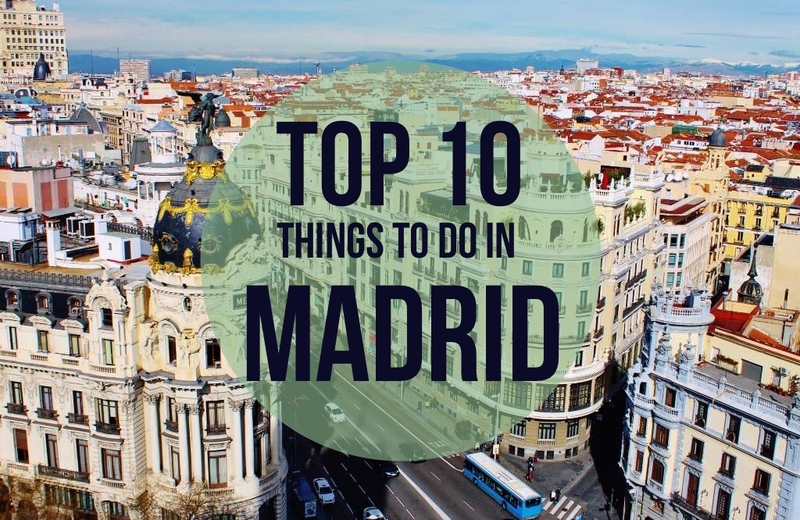 If you are coming from the direction of Plaza Mayor, go until you see Catedral de Almudena (the big church next to the Royal Palace) and then take a left until you cross the bridge with glass siding. At the very end of the bridge, you will see a little area to the right with a fence and a hill. We just climbed over the fence and sat down on the other side. You might already see some locals gathered there depending on the night. 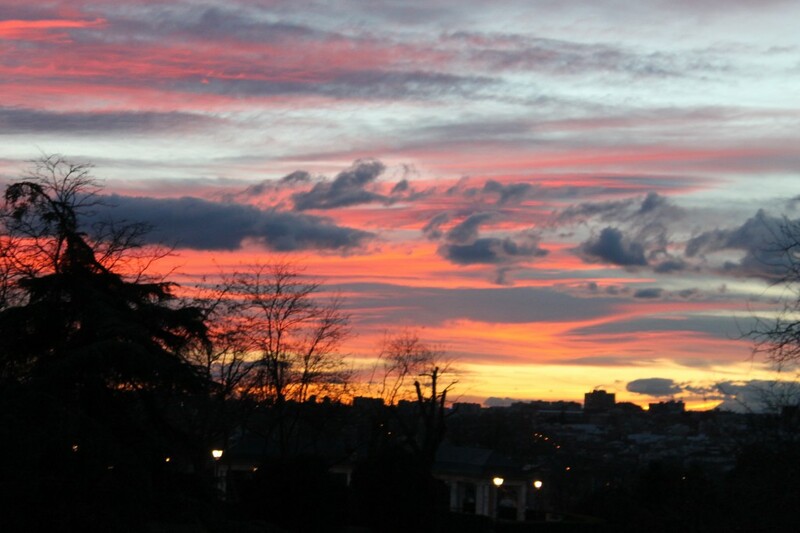 Bring some glasses and wine with you to enjoy with the sunset. 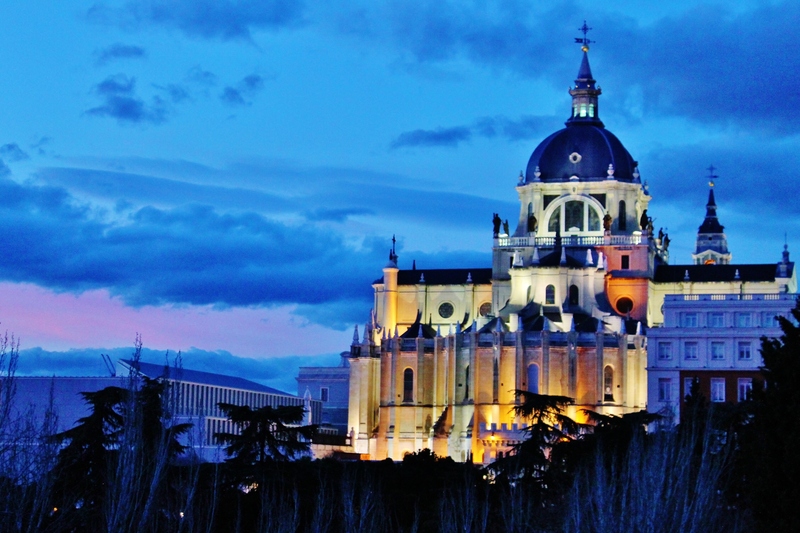 Once the pink and orange show is over, be sure to stick around to see the Catedral de Almudena all lit up at night! 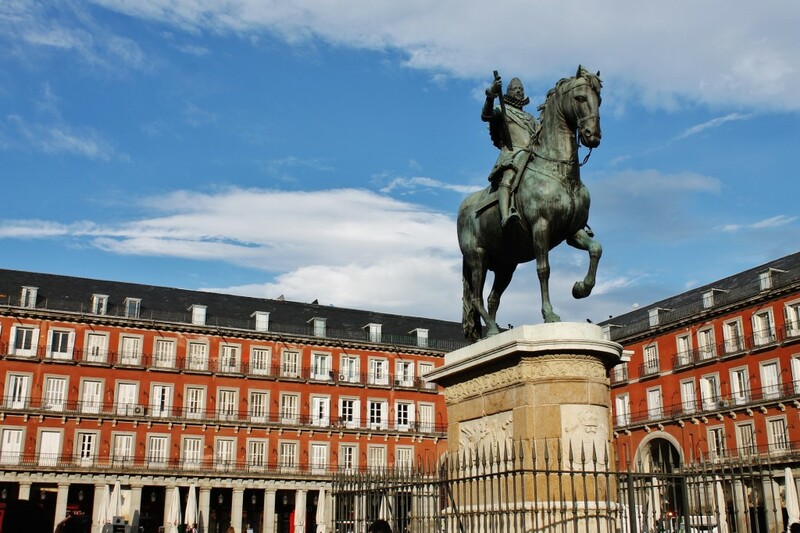 So Plaza Mayor can definitely be a tourist trap but it surely something you don’t want to miss out on, being one of the main staples of Madrid. 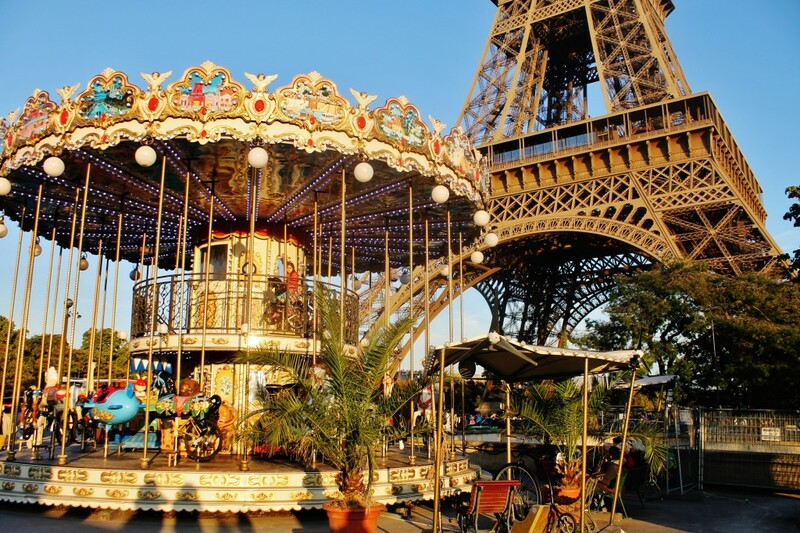 The attraction is an old square rich with history built during the late 1500’s. 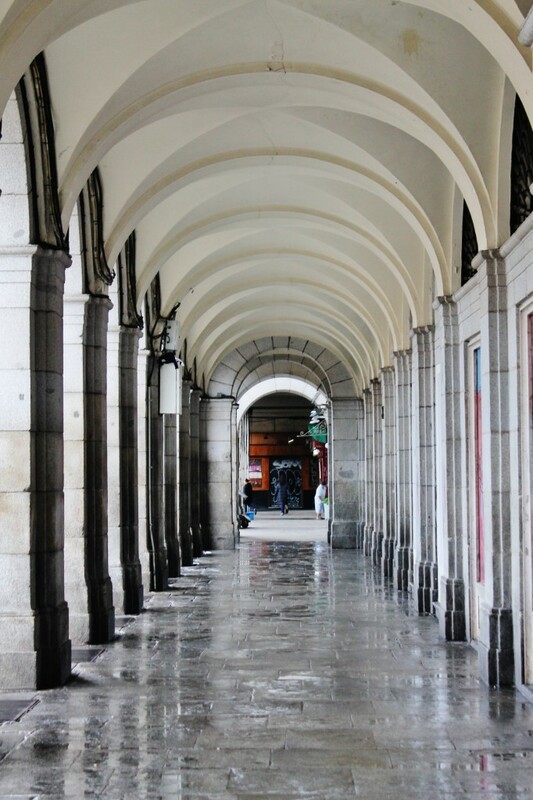 The square has nine entrances that offer beautiful views both in and out of the square. However, I wouldn’t recommend eating at any of the restaurants here because they are meant for tourists and are ridiculously over-priced and crowded. 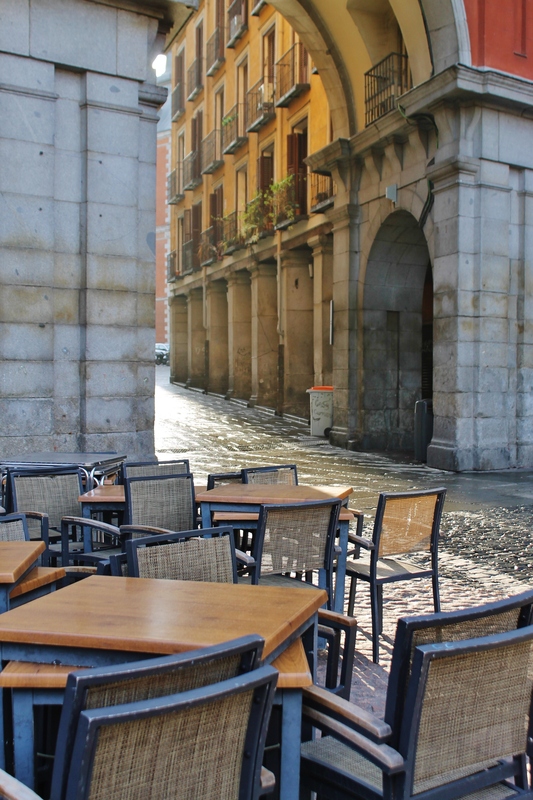 Tip: The streets don’t really start bustling in Spain until later because the Spaniards go to very late and sleep in. If you want to admire the square without all of the tourist groups and annoying aggressive vendors, come early. We walked through the plaza for the first time around 7:30/8:00 a.m. and we had the whole place to ourselves! 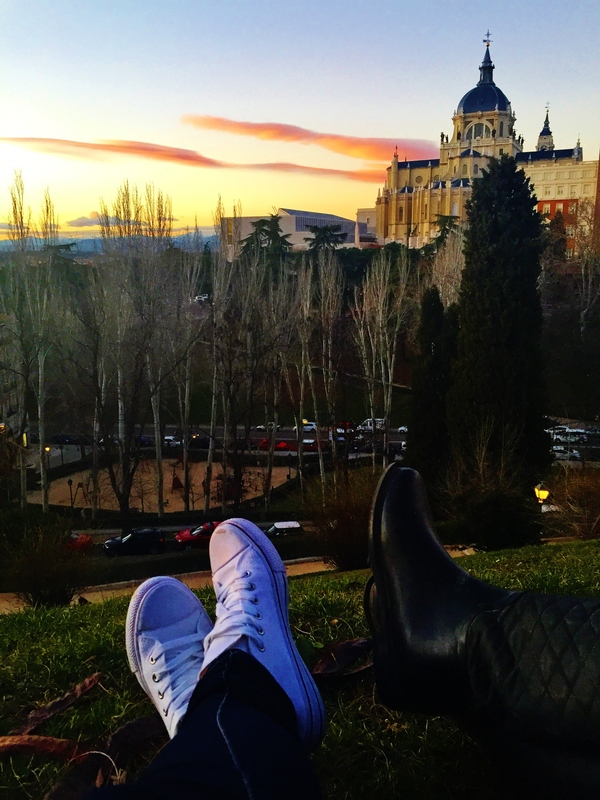 It gave us some time to quietly admire the square and its beauty. 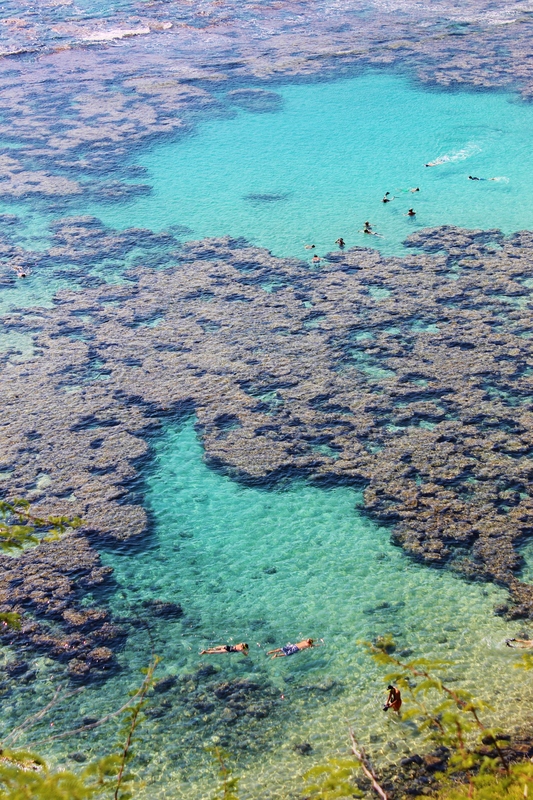 The tide pools are surely something to you don’t want to miss on your trip to Oahu. 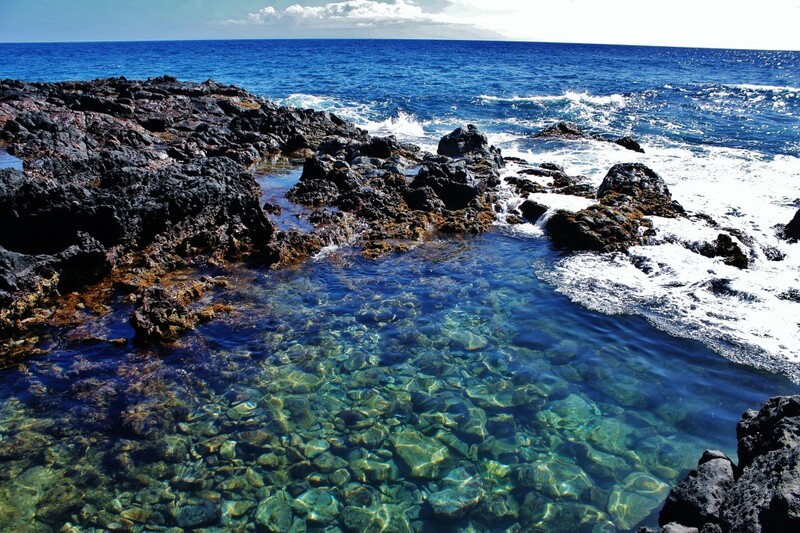 The pools are a hidden gem located a little ways off of the Makapu’u lighthouse hike. On most days, the pools don’t attract too many tourists and can be a beautiful place to enjoy a quiet picnic while watching the waves crash against the shore. There are rocks to jump a short distance into the deepest pool. There are also lots of little creatures and fish to see swimming in each pool. Each pool is about the size of a swimming pool, which is fun when you come on a weekday and get a whole pool to yourself. 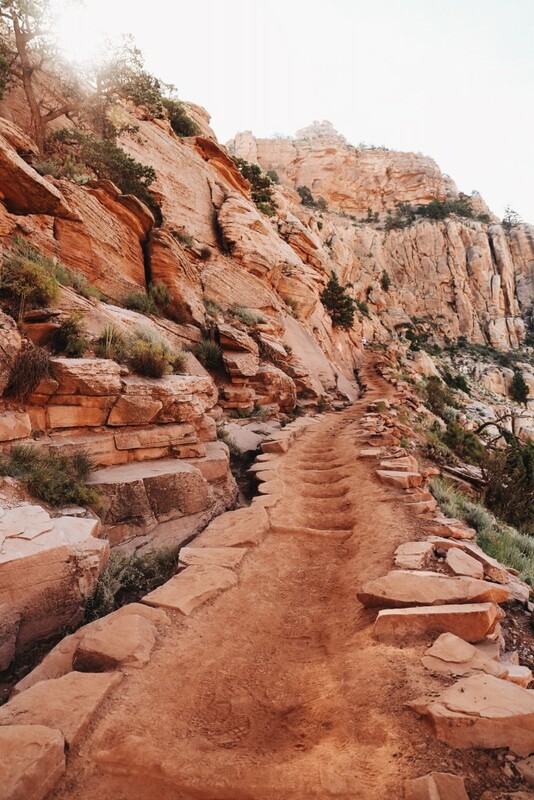 Make sure to pack sunscreen, water, goggles, snacks, and GOOD water/hiking shoes with good traction since you will be going down a very steep hike to get there. 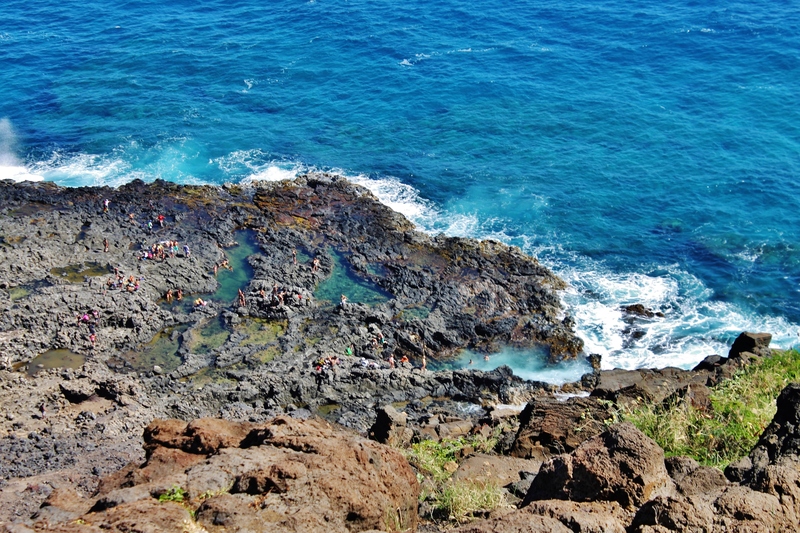 To get to the tide pools, you want to park in the same lot for the Makapu’u Lighthouse trail. When we went it was really crowded (Martin Luther King weekend) so we had to park on the side of the road across the street. If if looks crowded when you approach, just go ahead and park on the side of the road because once you turn into the lot it is nearly impossible to find a spot in and the road is very narrow and crowded which makes turning back around time-consuming. 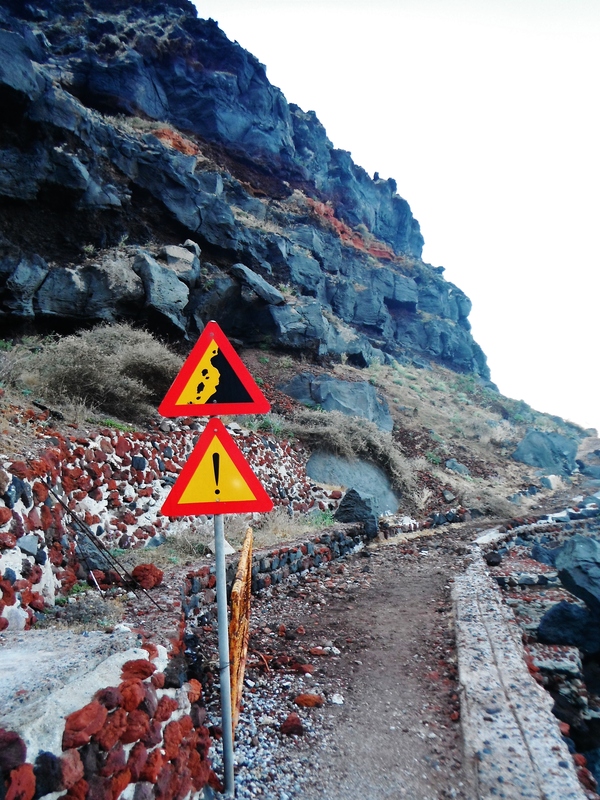 Once on the hike, continue up the paved trial until you come upon the whale information sign. 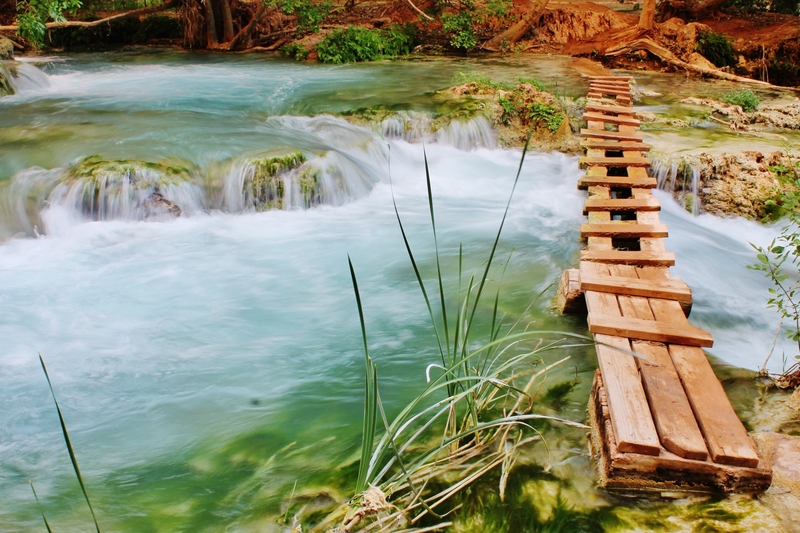 Here, take a right and follow the path down all the way to the water, and you will come upon the pools. Coming down isn’t really difficult because you can pretty much see where you are going, but on your way back up make sure that you are following the white painted arrows. It is easy to go the wrong way since it all kind of looks the same. 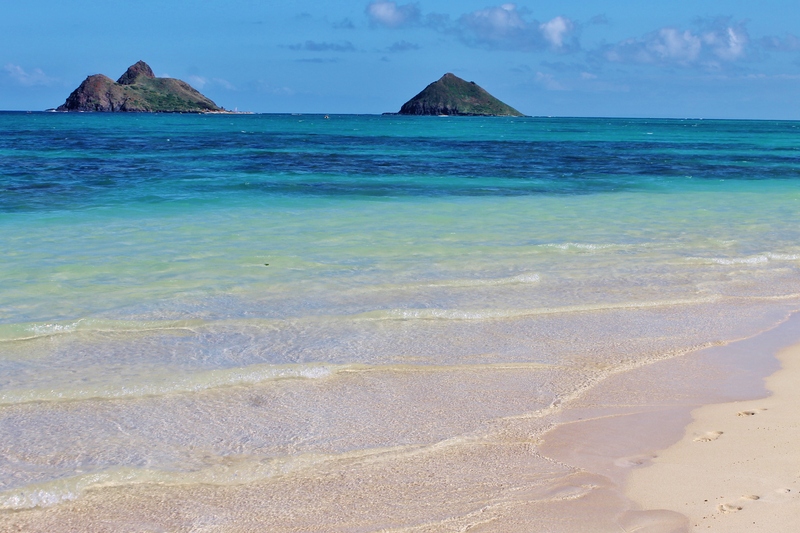 Even though Oahu has an abundance of outdoor activities, sometimes it’s nice to do nothing and relax. Lanakai Beach is the PERFECT place for this because of its beautiful scenery. 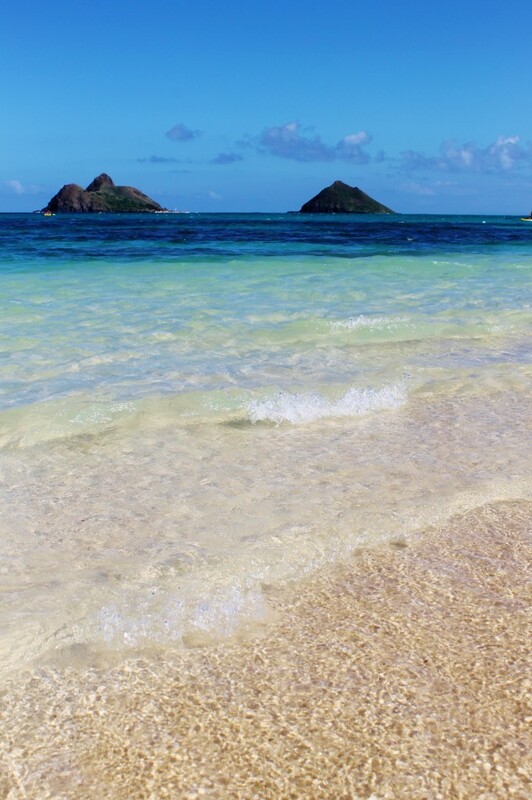 The clear blue waters stretch for only about a half mile and continues to rank among the top beaches in the world. Make sure you get there early because as the day goes on, parking and traffic get crazy. The beach is nestled in among a residential area so be aware of where your parking to avoid violations. 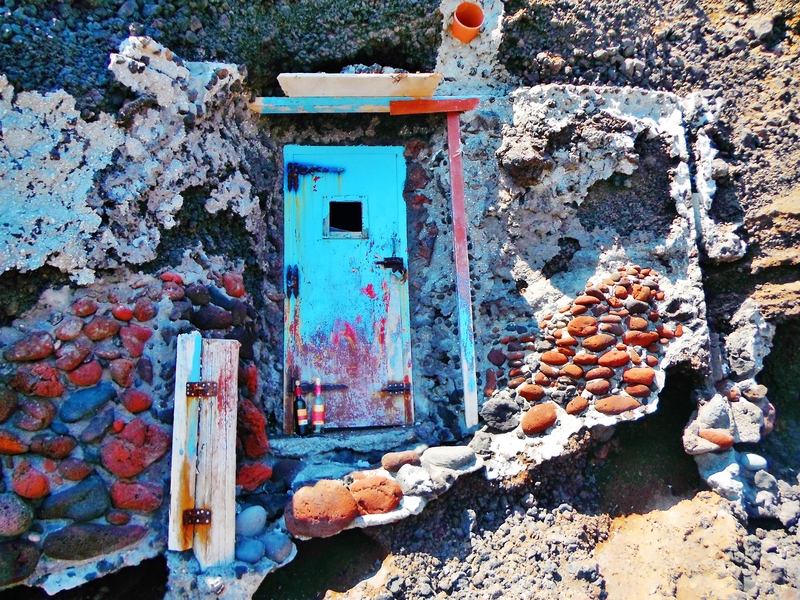 Note: There are no restrooms or lifeguards at Lanakai Beach so take that into consideration. 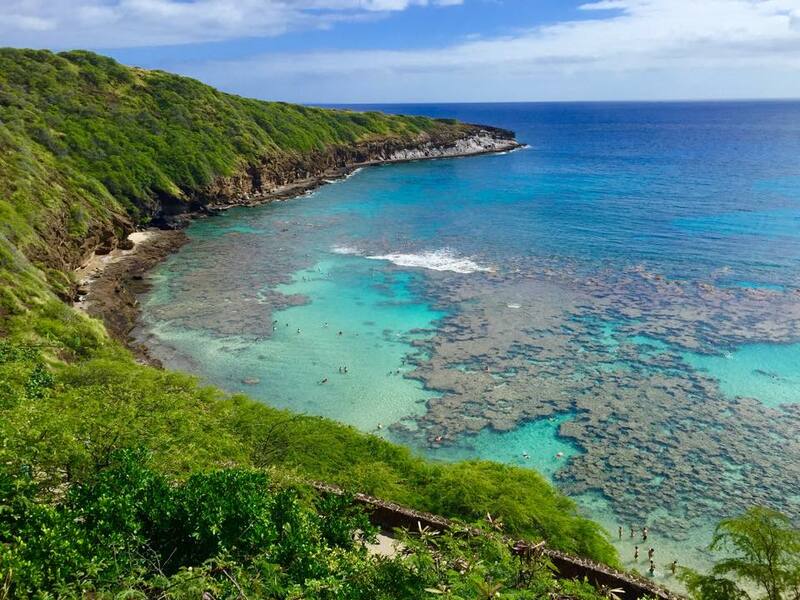 Hanauma Bay is one of my all-time favorite snorkeling spots. Because the reefs have such a high volume of tourists, it is closed on Tuesdays to prevent overuse. Admission is $7.50 and free to locals, military and kids 12 and under. Parking is only $1 but I would recommend getting there early because it tends to fill up fast. You are required to watch a short video before entering the park. 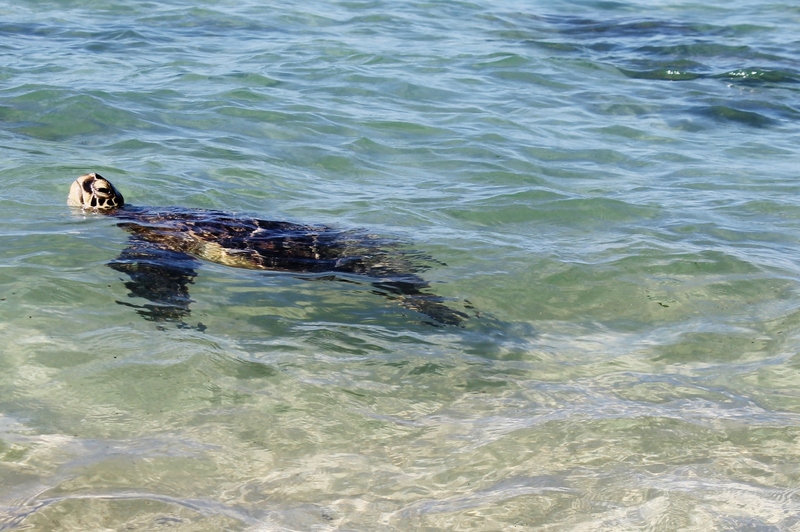 Once you start snorkeling, the wait and crowd is worth it. 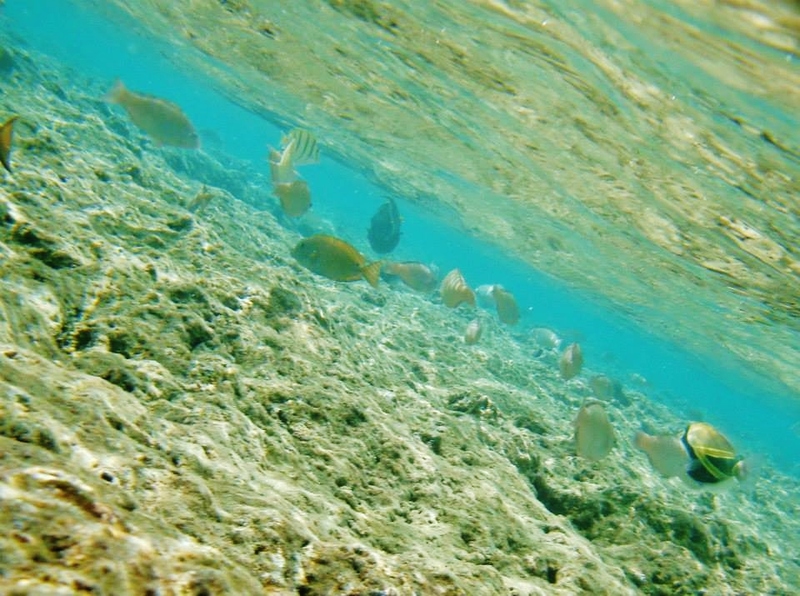 The water is incredibly clear on most days and there are schools of colorful fish everywhere you look. 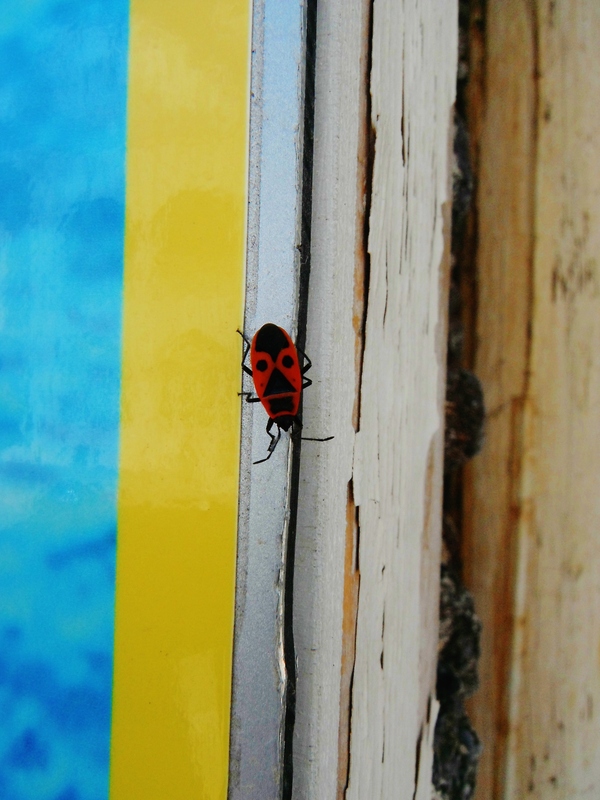 They also have an information booth on the beach where you can identify all of the creatures you see. Within an hour of snorkeling, we had already seen an octopus and an eel! Don’t forget to bring or buy your own snorkel and mask before you come since renting one is $20! 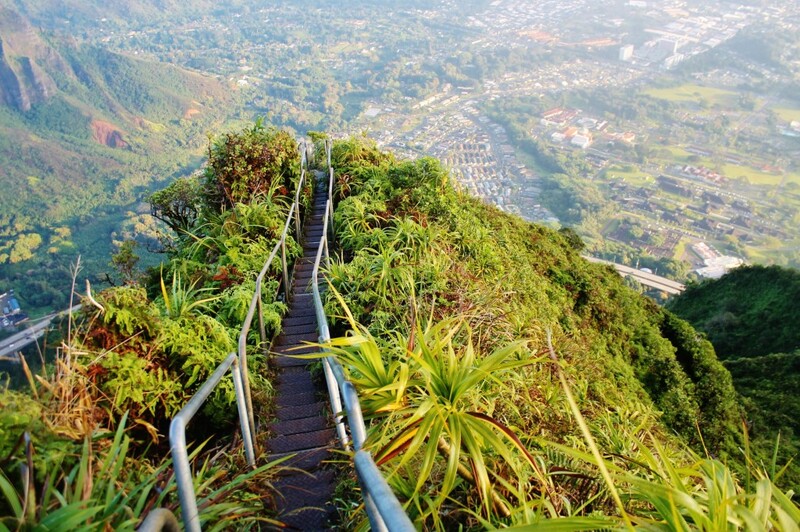 The Haiku Stairs was my favorite thing I did while in Hawaii. 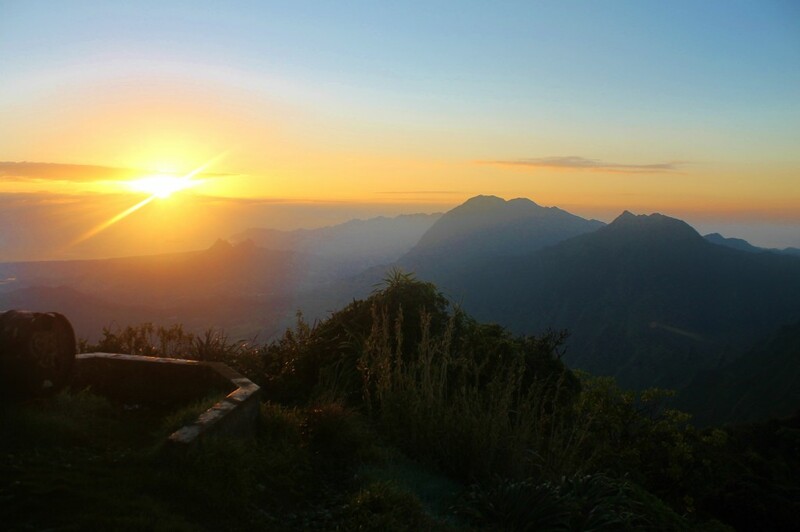 We woke up at 2 a.m. to climb the 3,922 steps and watch the sunrise from the clouds. It was breathtaking. 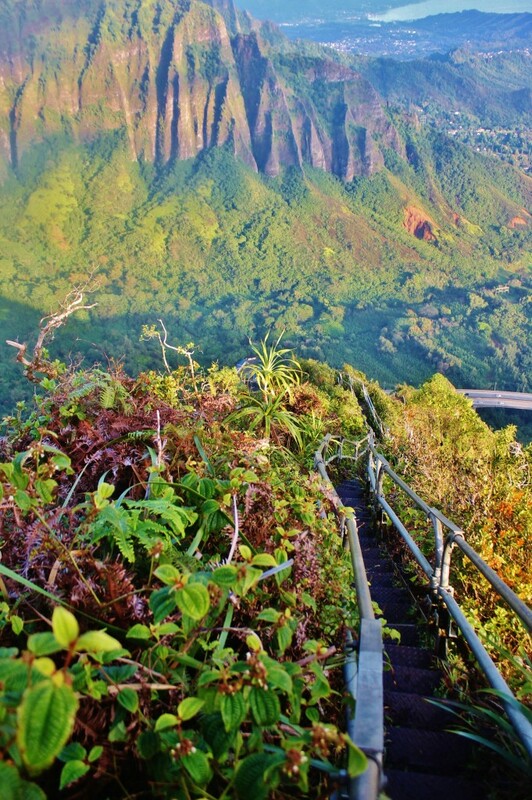 Be warned though, if you are afraid of heights, aren’t in decent physical shape, or don’t appreciate adventure then this hike is NOT for you. Another thing is the hike is technically illegal so there are risks involved. Let me tell you though, the view at the top is SO worth it. 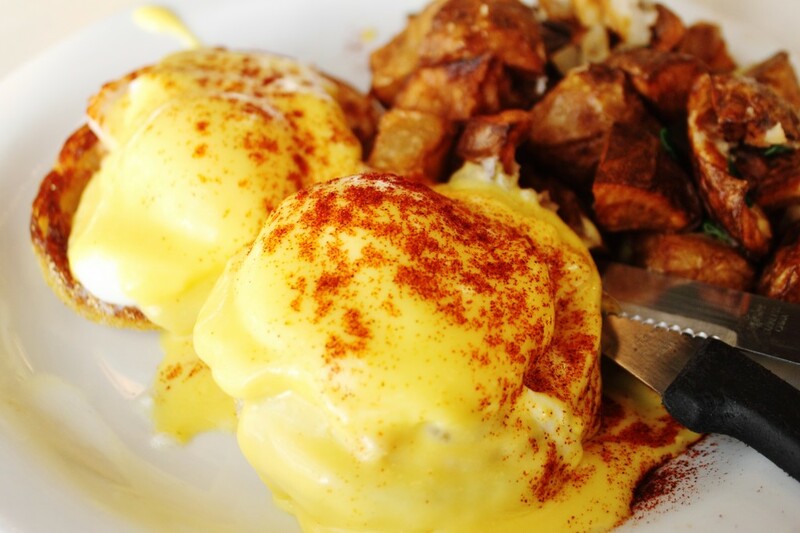 Cinnamons Restaurant has some of the best breakfast food on the island that you don’t want to miss out on. 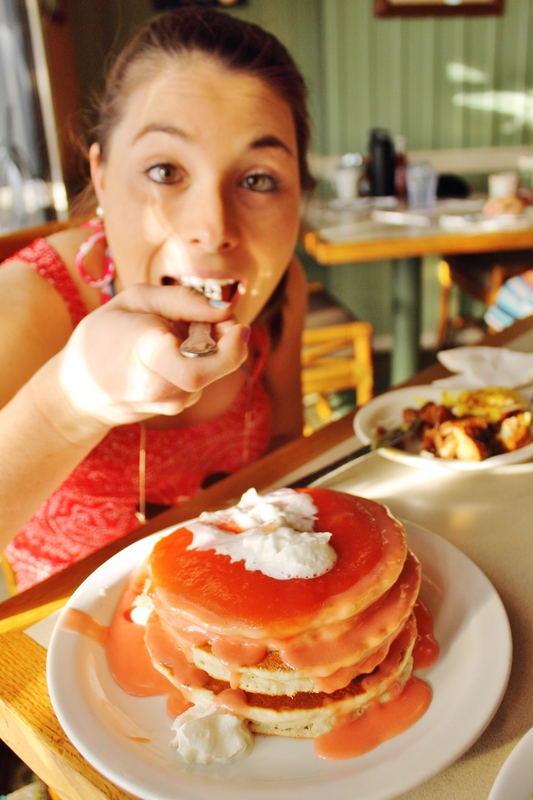 We got the Guava Chiffon pancakes and added some coconut syrup which they have on every table. They tasted AMAZING. Because the pancakes were so sweet we ordered the Eggs Benedict to split and balance everything out which I highly recommend doing. 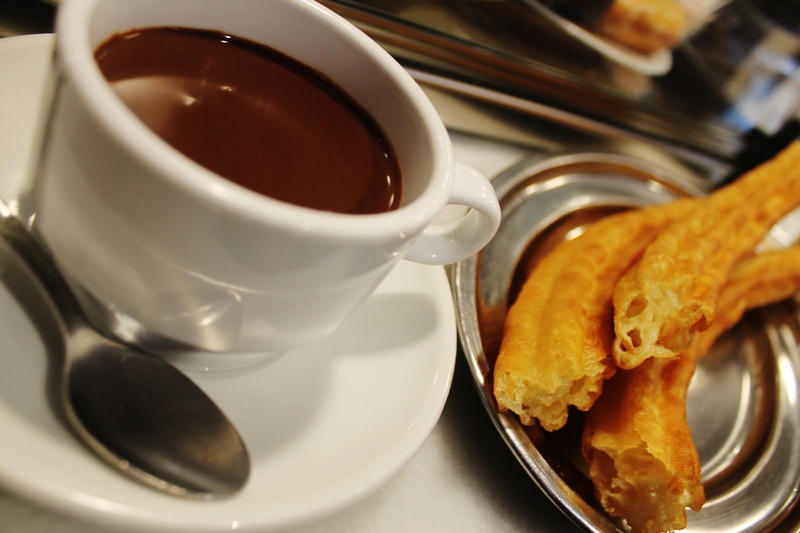 It was the perfect balance of sweet and salty and we had a hard time deciding which one tasted better. 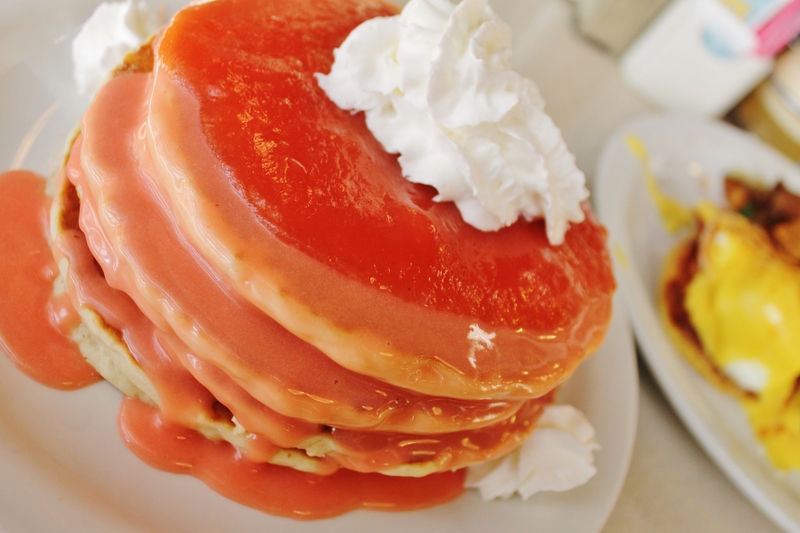 Cinnamons is also known for their Red Velvet pancakes so don’t forget to try those. This place can get very crowded on the weekends and peak breakfast and lunch hours so make sure you come early or are prepared to wait a little. However, once seated the service is good and the food is fantastic! 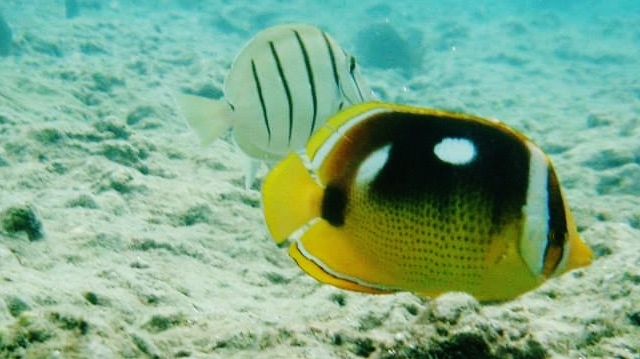 One of the great things about Oahu is that you can be on a beach snorkeling, and in the middle of the rain forest the next. 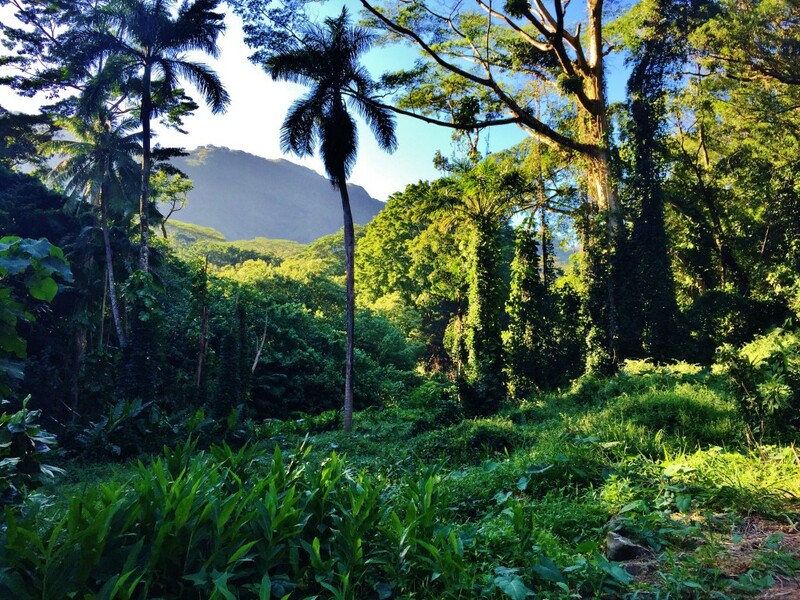 Manoa Falls is about 20 minutes from Waikiki by car and is the perfect afternoon hike. It probably took us close to a half an hour to reach the falls. The scenery on the way to the falls is lovely. One thing that I was surprised by is how high the falls are. The flow isn’t super heavy but it is impressive how far the water falls. There is a little pool at the bottom where you can take a cool dip on a warm day. You can’t go to North Shore without going to Pipeline. 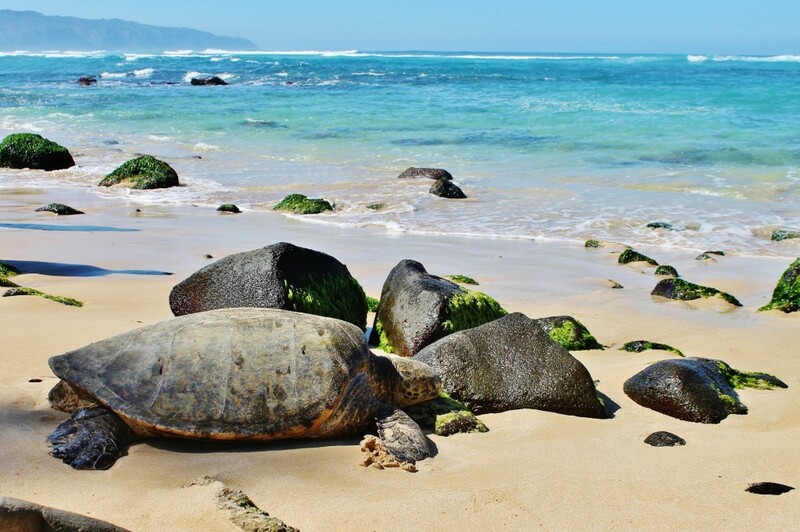 Here, you can catch a tan while watching some of the best surfing around. Locals and tourists alike all gather together to photograph, watch and participate in this entertaining spectacle. We just simply put “Pipeline” into our maps and parked on the side of the road near some houses. We then followed the someone who looked like they knew where they were going and they led us through a public pathway between houses to the beach. Just look for the pathway and the little letters (above) that say “Pipeline” on the fence of the house on the right side of the pathway. 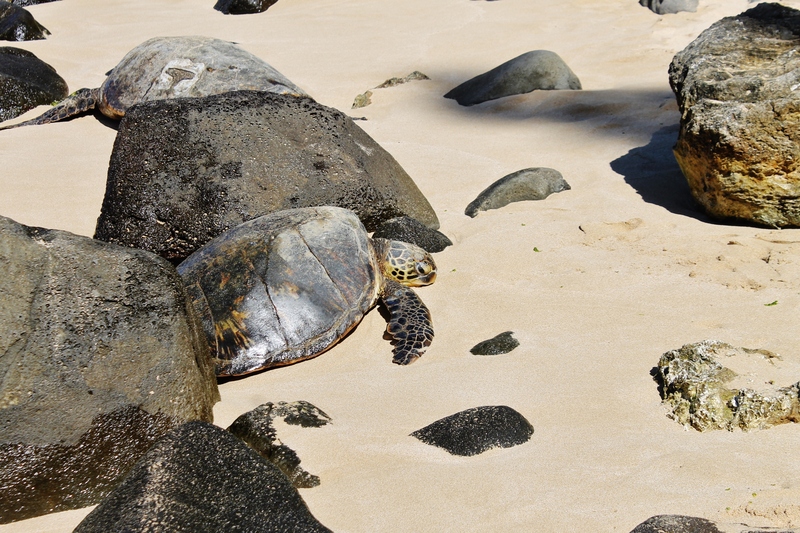 Laniakea Beach is known as the beach where you are pretty much “guaranteed” to see sea turtles. 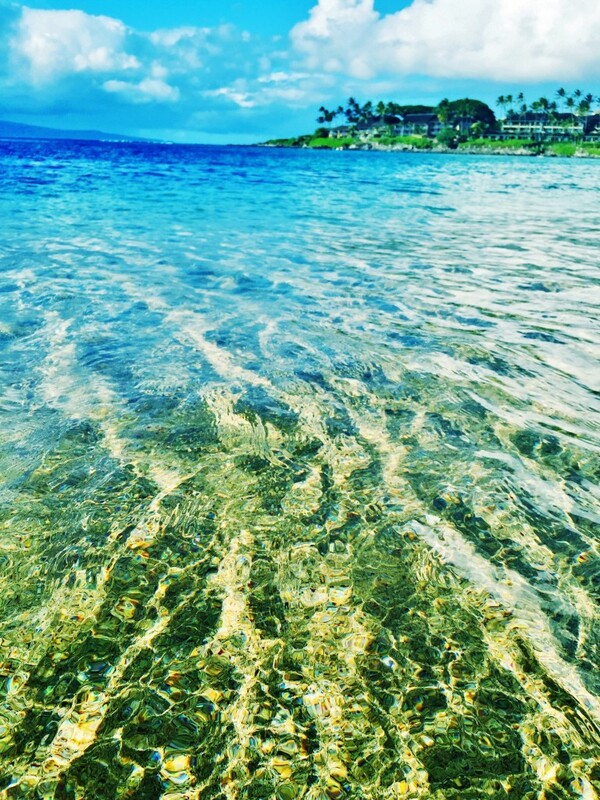 Laniakea Beach is also located on North Shore. 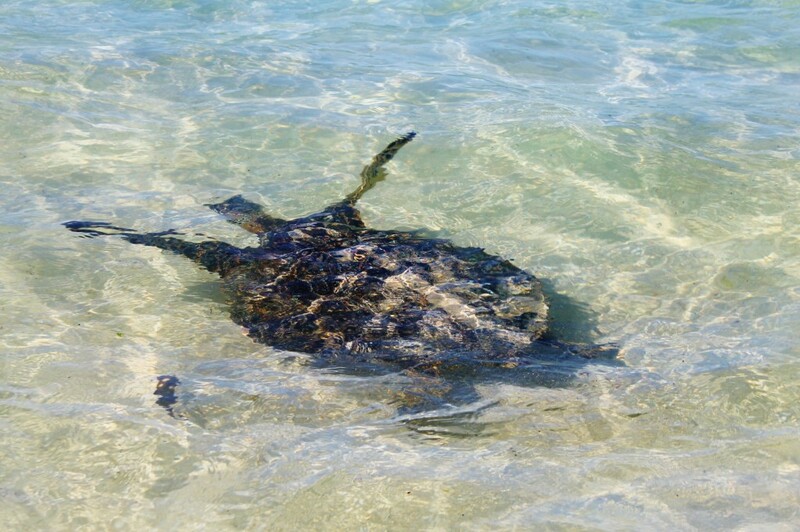 We went to this beach two days in a row and saw turtles both times. However, one day was WAY better than the other. 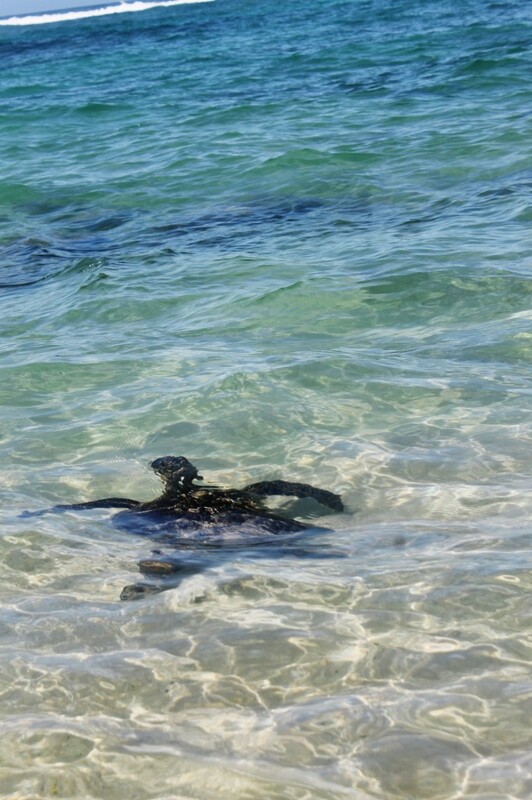 The first day we came, we didn’t see any until a guide with a tour came by and pointed one out swimming in the water a little ways from the shore. The second day we came, there were two turtles just sitting on the beach and we spotted two in the water. It was such a neat experience to be able to see these amazing creatures in their natural habitat. If you are lucky, you will probably see a sea turtle while snorkeling on other parts of the island but if your trip is nearing a close and haven’t seen any yet, definitely stop by Laniakea. 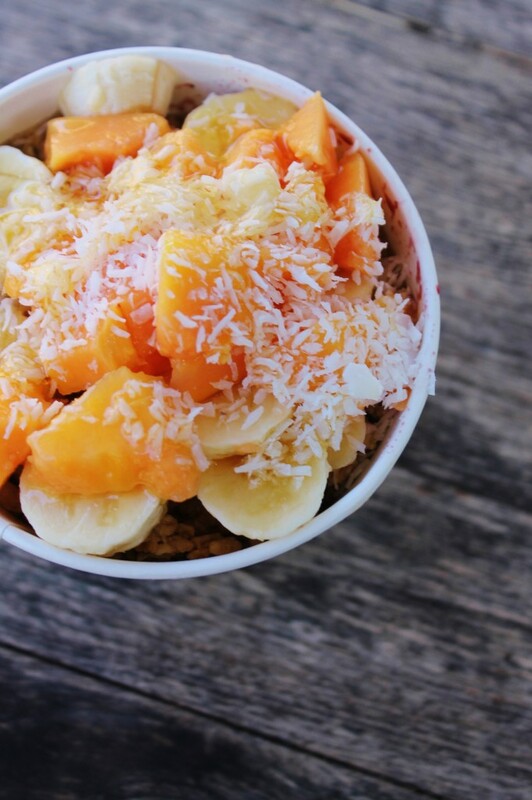 Anyone who knows me, knows that I have an obsession with acai bowls. Hawaii is known for them and the best one I have had to date is called Haleiwa Acai Bowls on North Shore. 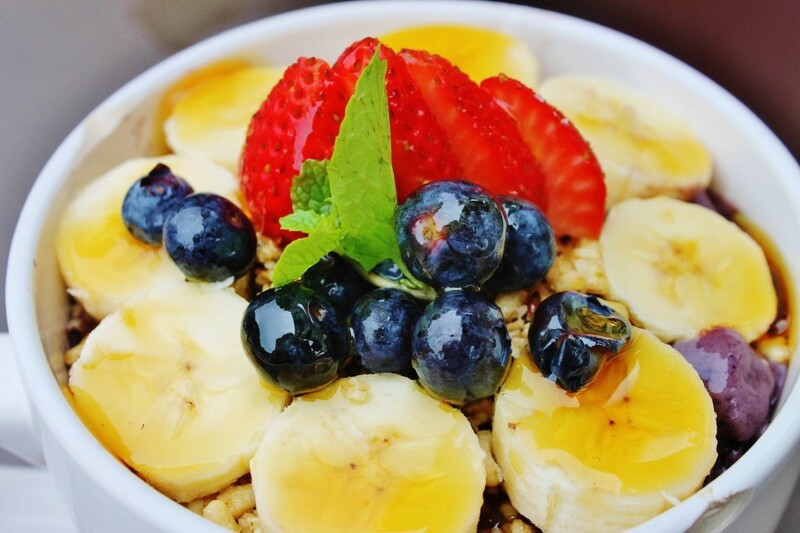 An acai bowl is a berry smoothie-like base typically topped with bananas, honey, coconut and granola. You can add and substitute other toppings. 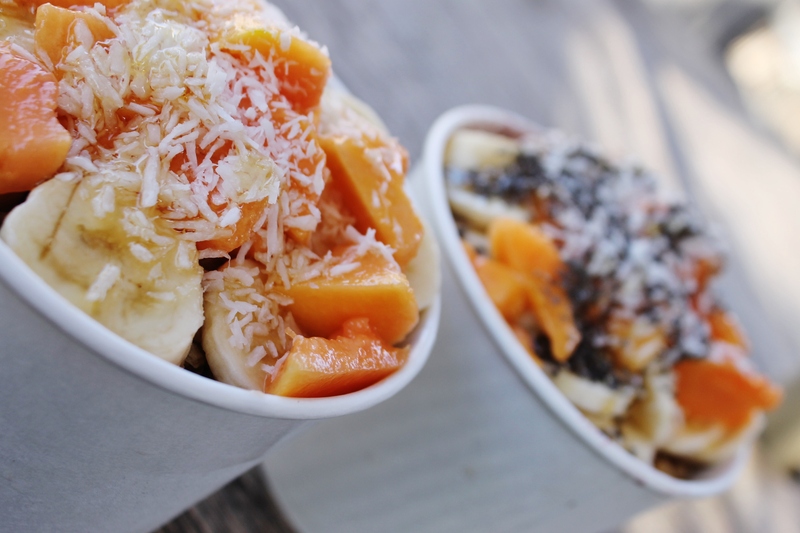 At Haleiwa Acai Bowls, they have a variety of toppings to chose from. I added papaya to mine and my friend got papaya and chia seeds on hers. 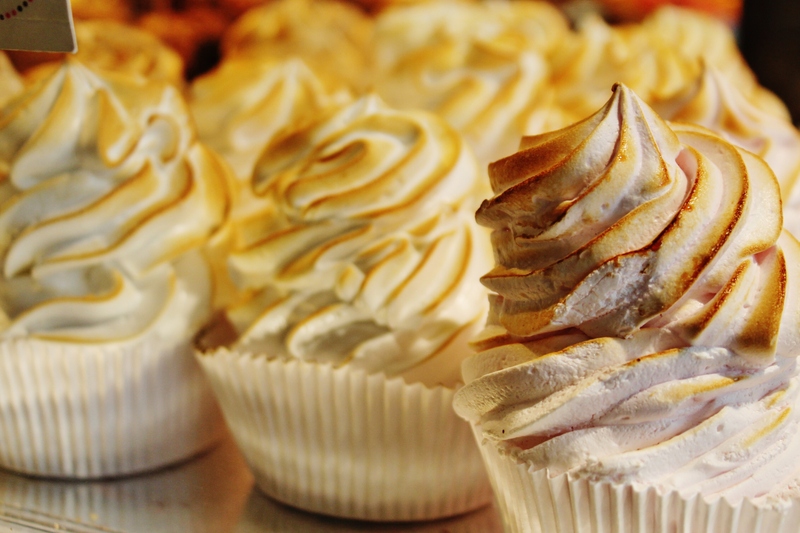 It’s the perfect healthy, filling and refreshing treat to walk down to the beach with on a warm day. 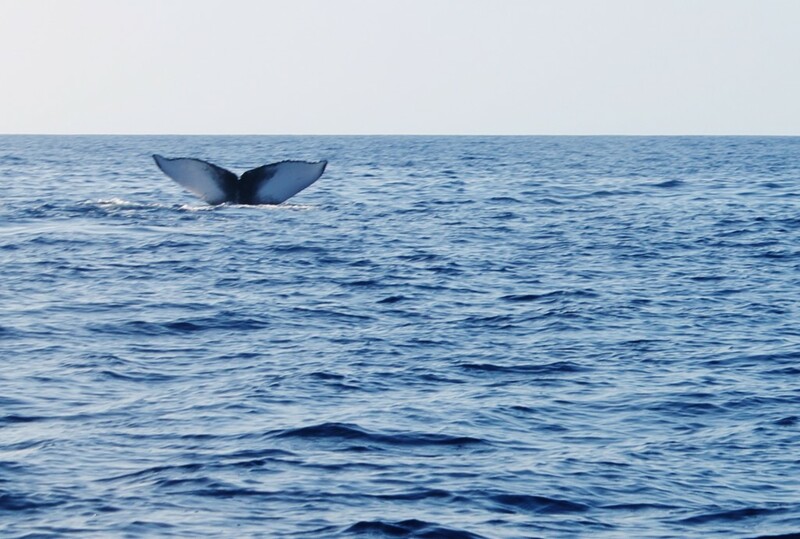 November-May is whale watching season in Hawaii. Peak season is January-March. 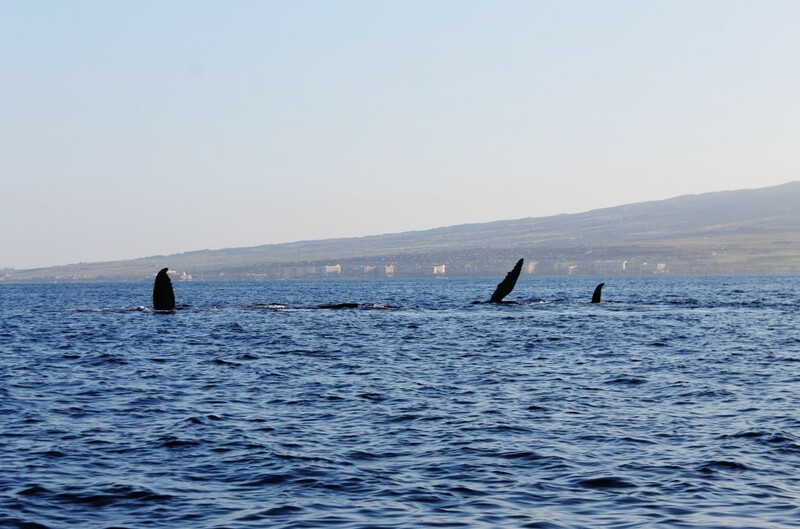 During this time, you are almost guaranteed to see whales. When we were doing the Makapu’u lighthouse hike in January, we saw at least three whales jumping out of the water. The lighthouse hike is great because it provides a clear vantage point to see for miles. Granted, you see the whales at a distance and there are tours that you can go on by boat to get a closer look at them. 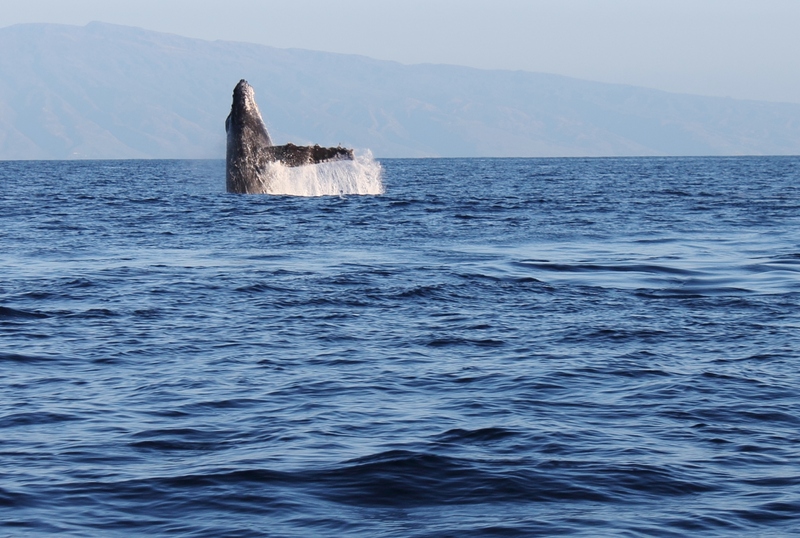 We went on a boat in Maui (they have similar tours in Oahu) and got to get up close and personal with dozens of whales. We even had a mom and calf swim right under our boat! 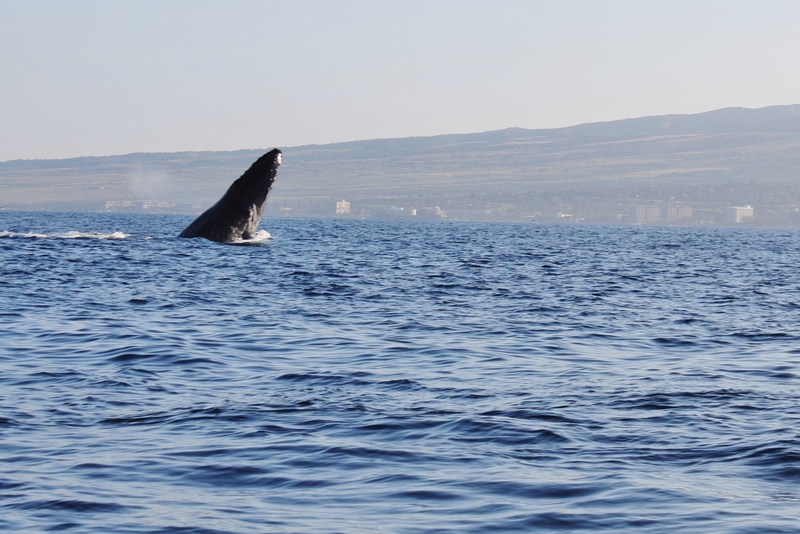 They call it “whale soup” during the early months of the year because all of the Humpbacks migrate to Hawaii from Alaska. Seeing these creatures was an unforgettable experience and if you are visiting during the winter months, be sure to book a tour and whenever you find yourself looking out at the water keep your eyes peeled! 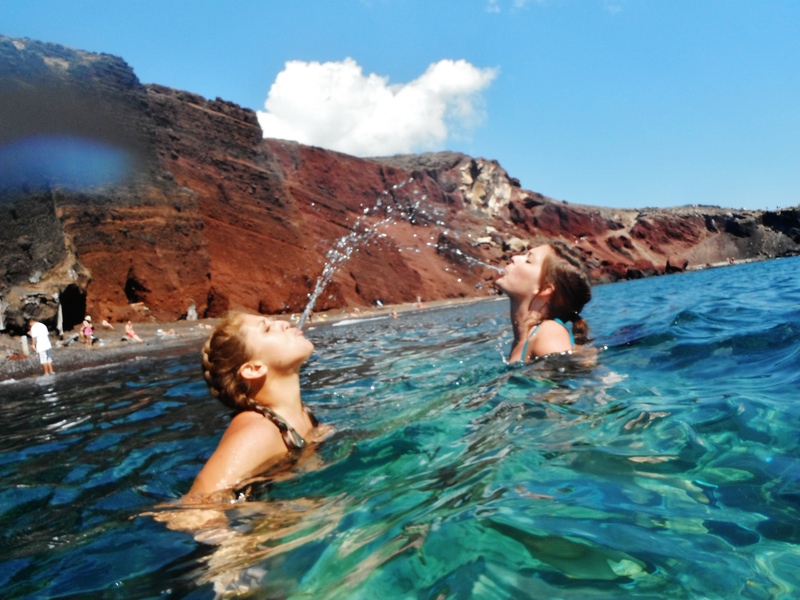 This is definitely my favorite thing that we did while in Maui. It can be a scary drive if you’re not prepared for it. 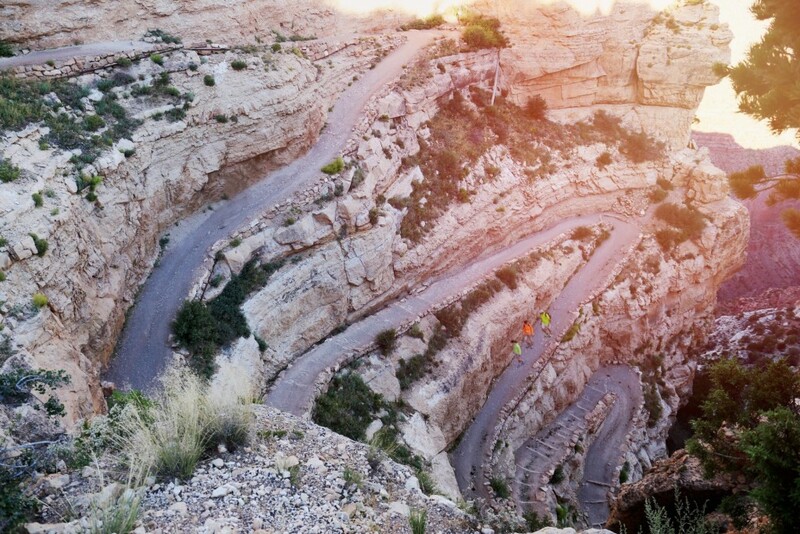 Just know that the roads are EXTREMELY narrow and twist and wind more than they are straight. Along this crazy road, there are many waterfalls, hiking opportunities and beaches. I can also say that it is the most distracting view of any road I have ever been on. 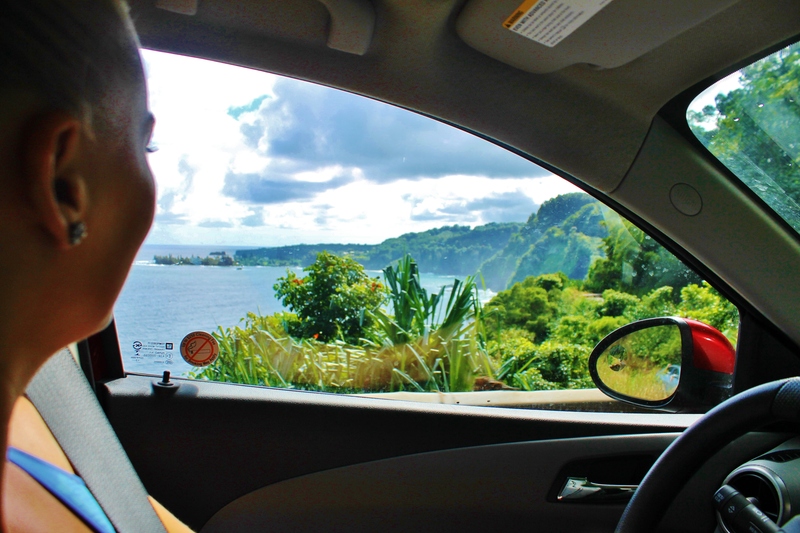 The views of the Maui coastline and mountains all along this road are UNREAL. There is so much to do here that you should research the things you want to do and then pick your favorites and stick to it. If you try to do everything you won’t even make it a quarter of the way. 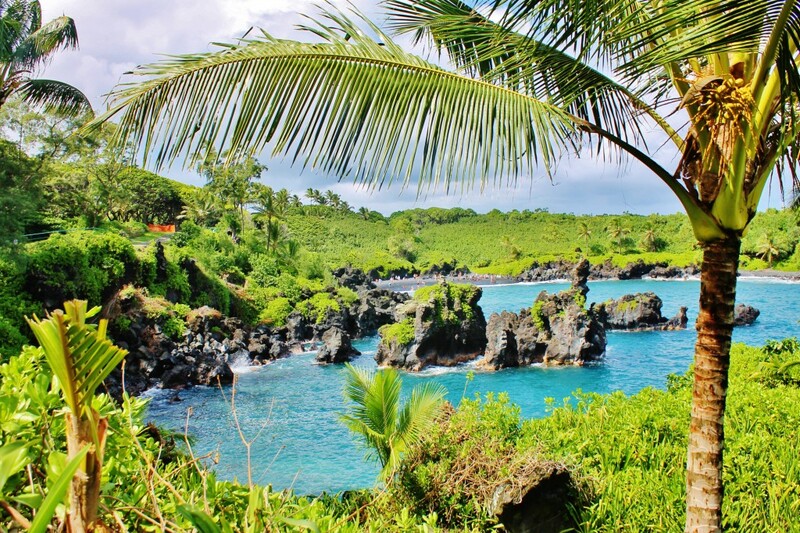 I have some of my favorite things that I think are worth checking out listed below (I will mention if they are on the Road to Hana). 1. Bring snacks or pack lunches. There are a couple of fruit stands and restaurants scattered along the way but they are sparse and the road is long. 2. Bring cash! Most of the restaurants and fruit stands only accept cash and you don’t want to be without some. 4. 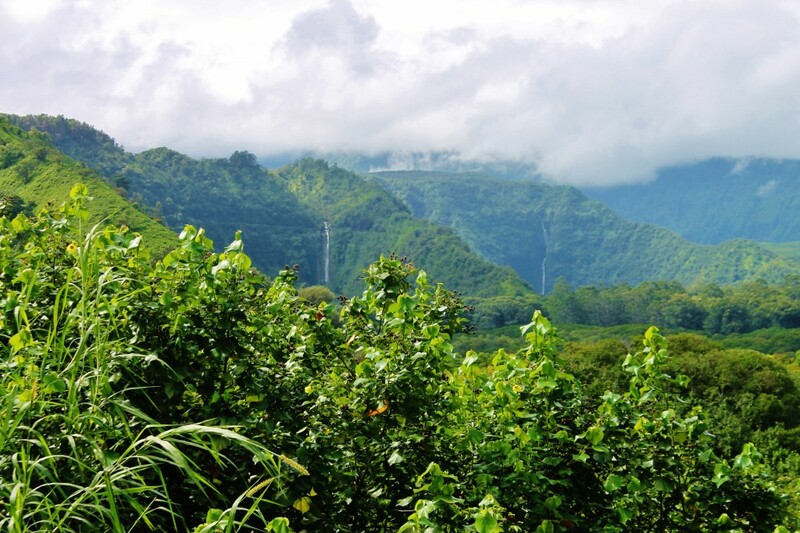 Download the Road to Hana app. The app I used was the GyPSy Guide. 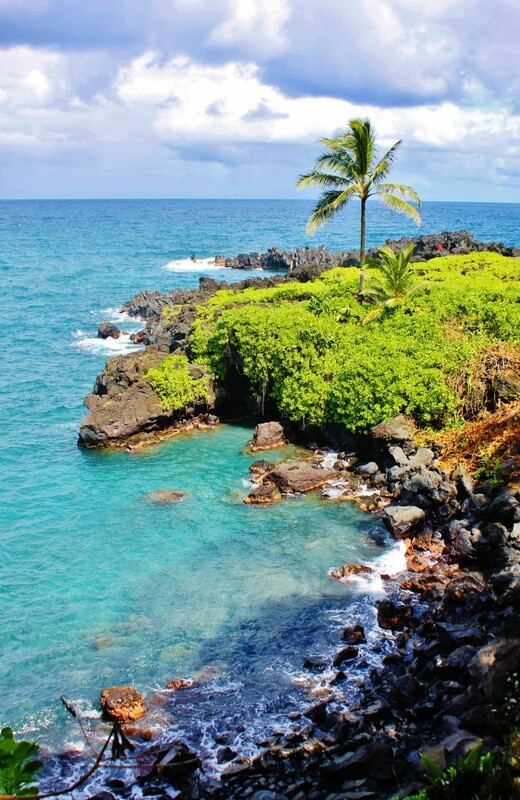 Just search “Road To Hana Maui” on the App Store and it should come up. It goes by GPS and narrates your entire trip. It also you about all of the stops you pass along with some Maui history. The only bad thing was that I did lose service a couple of times along the road and the narration out (I have Verizon). Other than that, it was really helpful. 5. Mile markers. The road goes by mile markers. So if you want to stop at a particular location, all you have to do is write down your mile markers of the stops you want to check out (in order) and it is pretty easy to find everything. 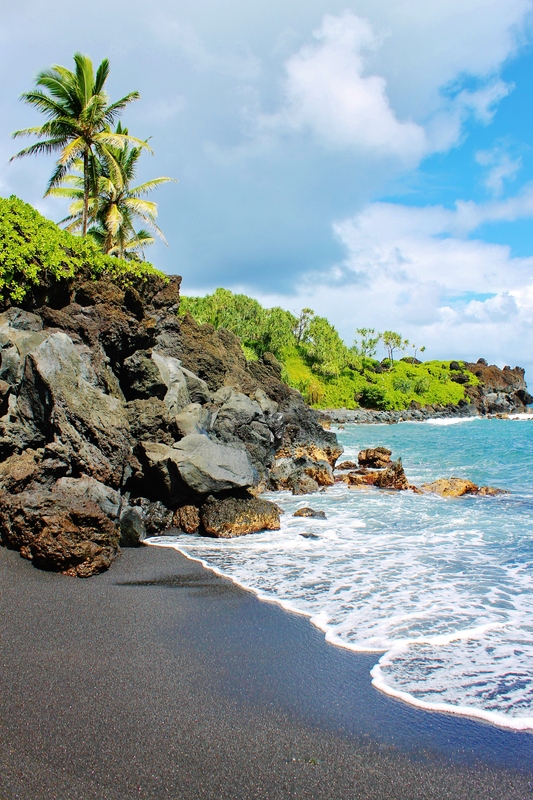 Black Sand Beach is one of the stops on the Road to Hana.The black sand was created from volcanic activity and is quite a site to see. 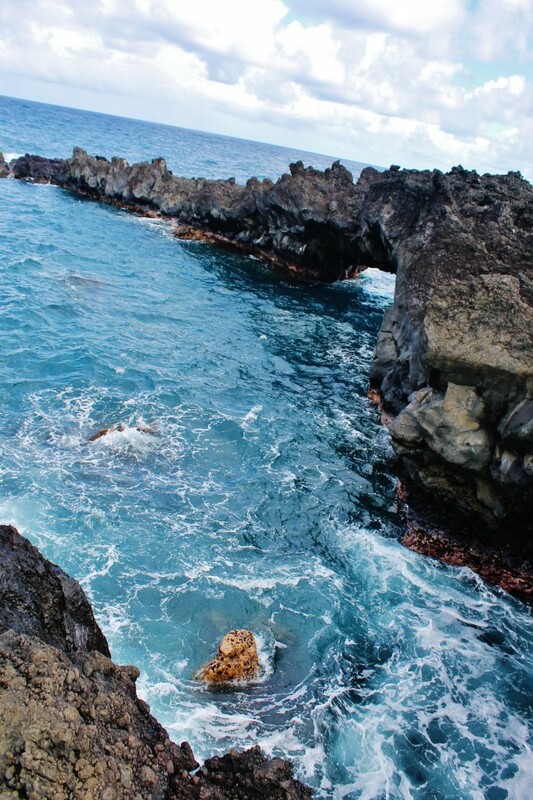 Not only is there a beautiful beach but there is also a sea cave and blowhole area. We felt like we had stepped into a Jurassic Park movie. The beach is located right after mile marker 32 on the left and once you continue down the road and see the yellow gate, turn left. That way will bring you closer to the beach. Fun fact: They have a couple of vending machines here along with public restrooms (which saved my life). It doesn’t really sound outstanding or look outstanding but trust me, its outstanding. Hawaii is known for this special treat and you can’t leave without trying one. I’m sure you’re wondering what an Acai bowl is exactly. Well, the base is the consistency of a yogurt mixed with sorbet and tastes like berries. 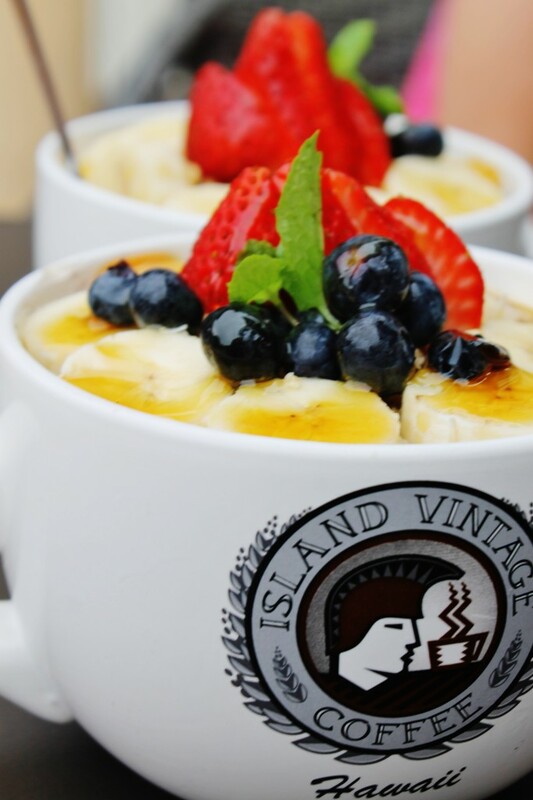 It is usually topped with bananas, honey, strawberries, and blueberries. We paid about $10 for ours and it was worth it. It is pretty filling too. It also is healthy which makes you feel good about going out in your bathing suit later. We got ours from Island Vintage Coffee which is located in Whalers Village (a really cute shopping center with some nice shops) near Kaanapali Beach. 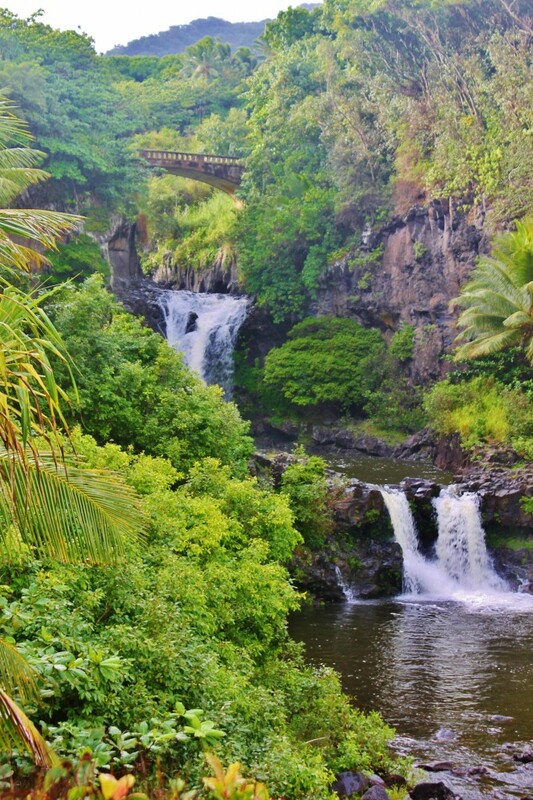 Seven Sacred Pools is located past the town of Hana in Haleakala National Park. The cost to get into the park is $10. You walk along a trail and can go down to the water or to the pools. On the day we went, the swimming area was closed because the water levels were too high and there were threats of flash floods but it was still a really beautiful sight to see and one of my favorite along the Road to Hana. There is also a really pretty view overlooking the pools when you go over the bridge before actually entering the park. This is a great place to come if you are just wanting a relaxing day on the beach with a beautiful view. Napili Bay is known for snorkeling and sea turtles. 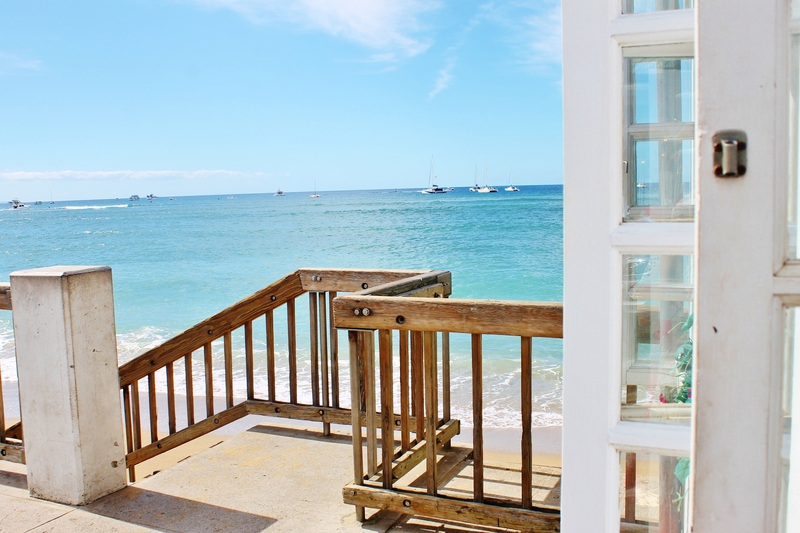 It is a secluded, calm bay that is great for relaxation. 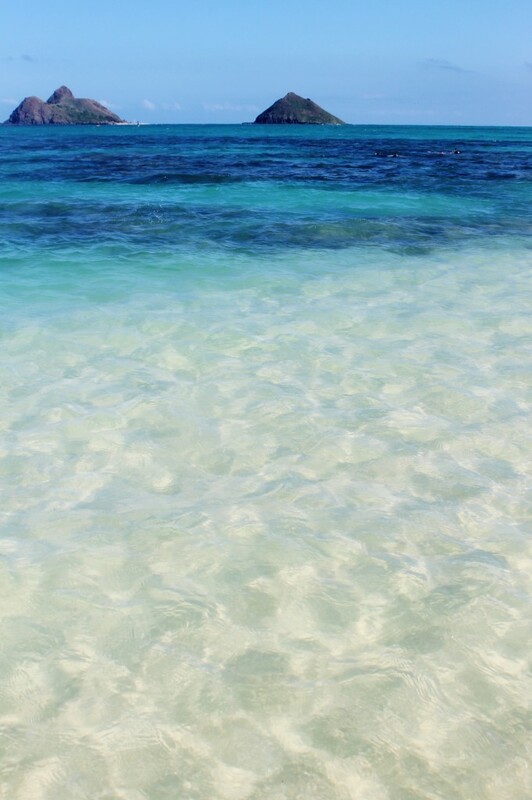 When we went, the water was so beautiful and clear. To get to the bay, you have to park on the side of the road and just walk down past the houses and condos towards the water. 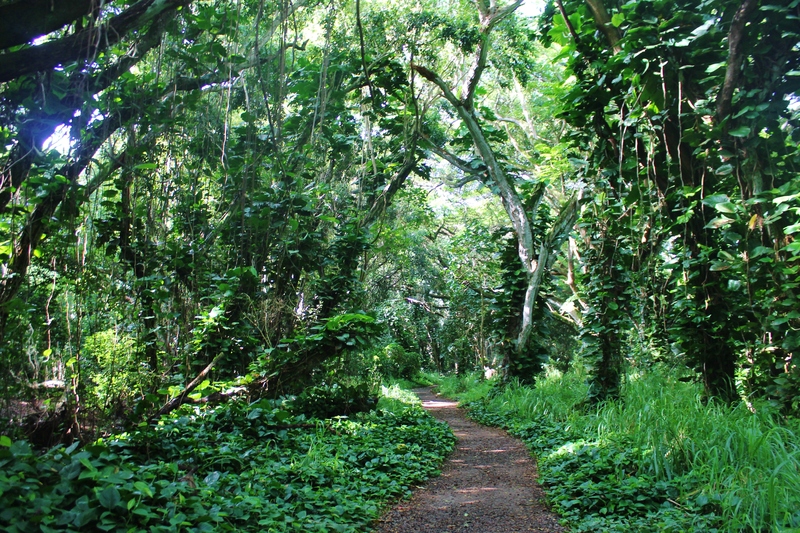 The Pained Forest is located between mile markers 6 and 7 on the Road to Hana. You will see it off to your left-hand side as you approach mile marker 7. 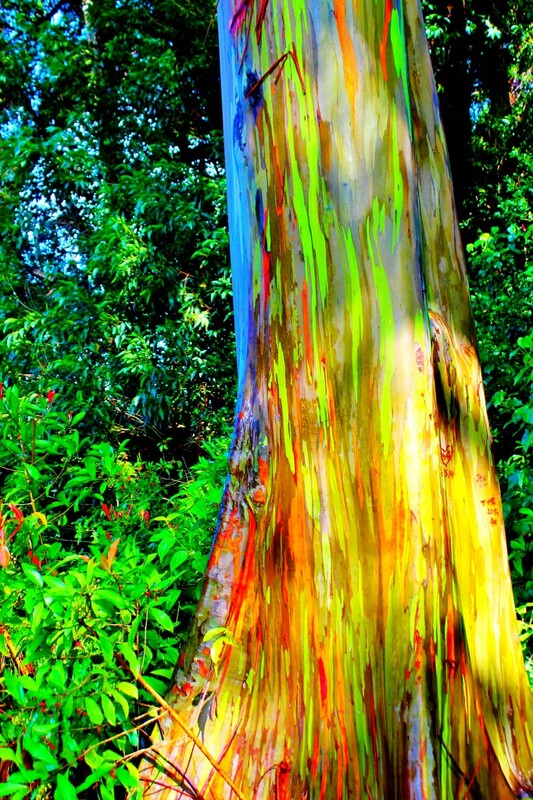 These rainbow trees are natural and are known as Painted Bark Eucalyptus Trees. There isn’t too much room to pull over but we found a spot near a fence a little bit past the forest. It is definitely worth seeking out a spot to pull over to get out for closer look at these magical plants. 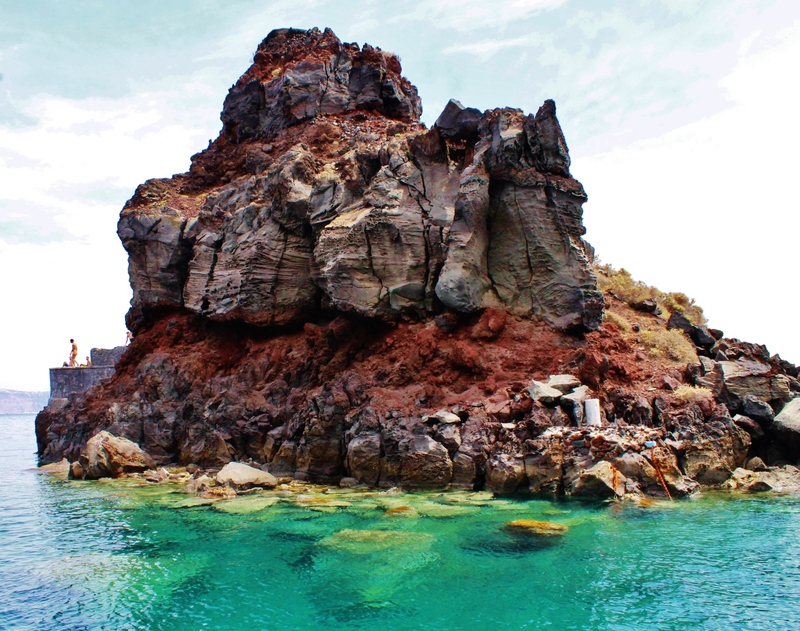 Hamoa Bay is a well-known snorkeling spot and provides some beautiful scenery. 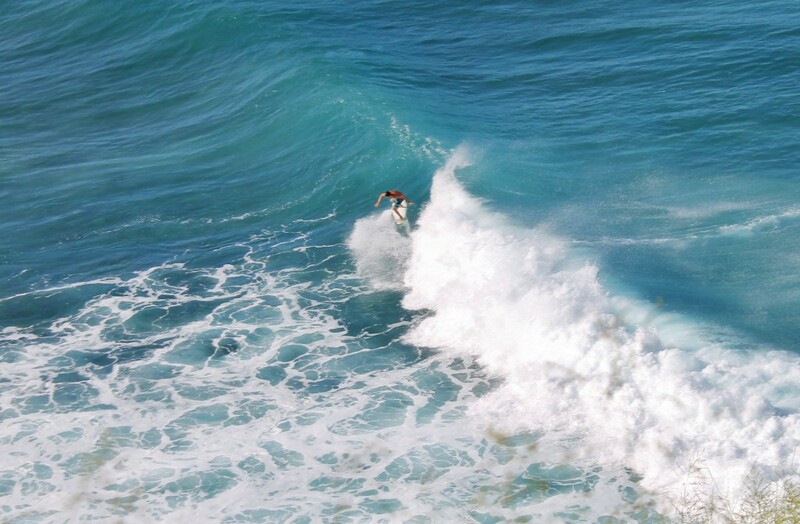 We were able to go on a day with large waves and got to watch some very talented surfers from the cliffs above. Because the water was so rough, we weren’t able to snorkel but I would still recommend stopping by. There is also a rain forest-like path to get down to the water that has an abundance of chickens and really cool trees. The path has a creek running through it and is a neat thing to see in addition to the bay itself. The beautiful path to get down to the bay. Shave ice is a popular treat in Hawaii. 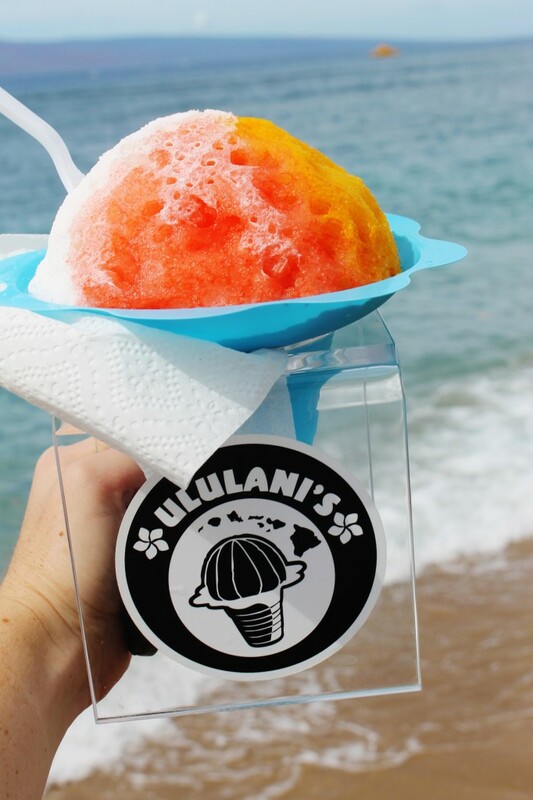 We went to Ululani’s Hawaiian Shave Ice located in Lahaina. Here, there were many other cute shops located along the water. We got our ice here and ate it on a bench overlooking the bay and then did a little shopping after. Be aware of the time of day when you go because parking can get pretty hairy. We went right when they opened at 10:30 and had no problem finding street parking. When you order your shave ice, you can get ice cream in the bottom of the cup (which I highly recommend paying the extra dollar to do). At Ululani’s, the flavor selection is endless. Luckily, they let you pick three. I got mango, coconut and papaya. It was the perfect afternoon treat to enjoy on the water. 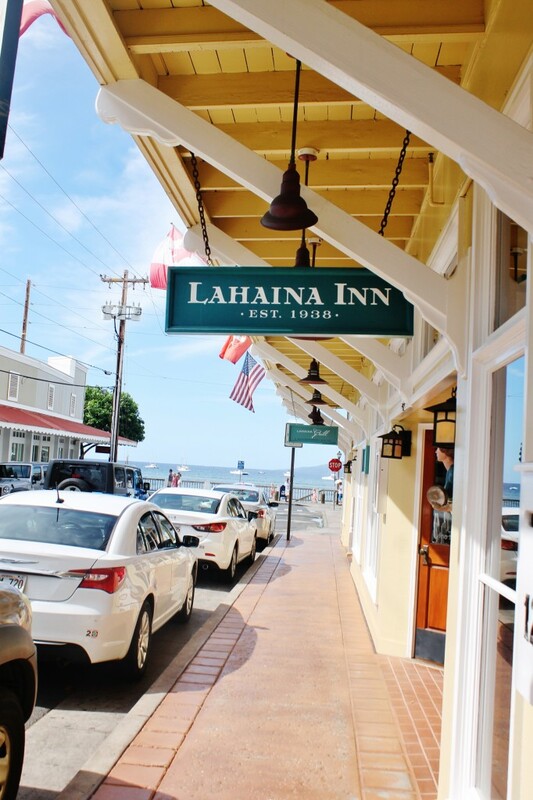 The cute Lahaina shopping center. The lovely view from the shops. 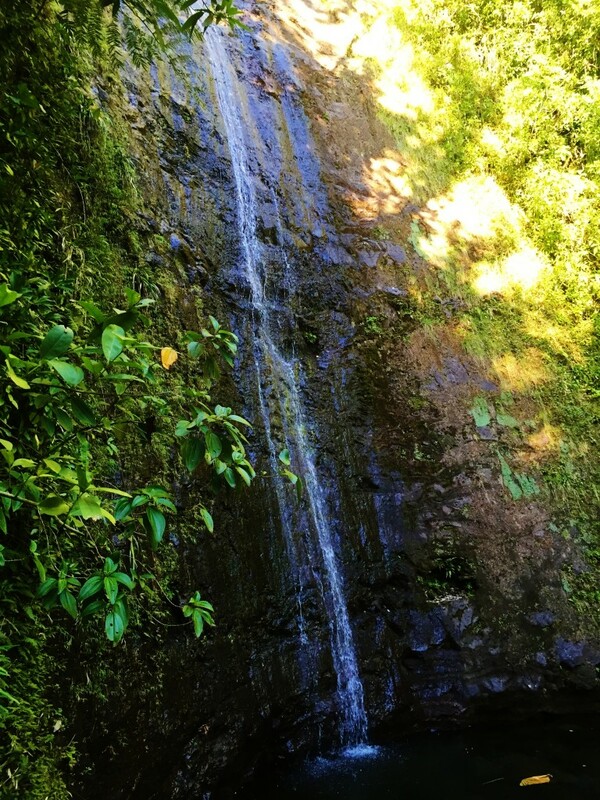 Maui has many many MANY waterfalls. Most of the waterfalls we saw were during our drive along the Hana highway. All you have to do is drive down this road for a couple of hours and you will see plenty. 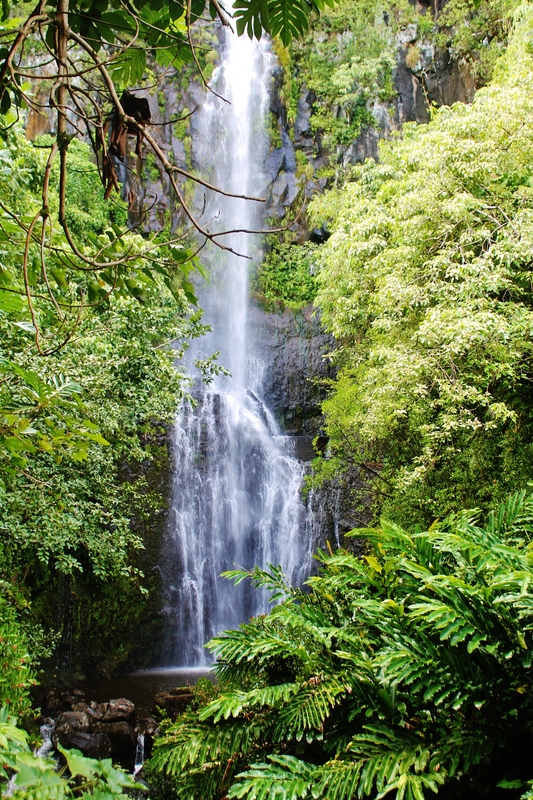 One of my favorites was Wailua Falls(pictured above) past the town of Hana and before Seven Sacred Pools. It is right off the side of the road on the right side. You can’t miss it. There is also a cool lookout about a half mile past mile market 18 where you can go up some stairs and see some larger waterfalls off in the distance. Twin Falls (mile marker 2.1) is also another popular spot where you can even jump from the waterfall! 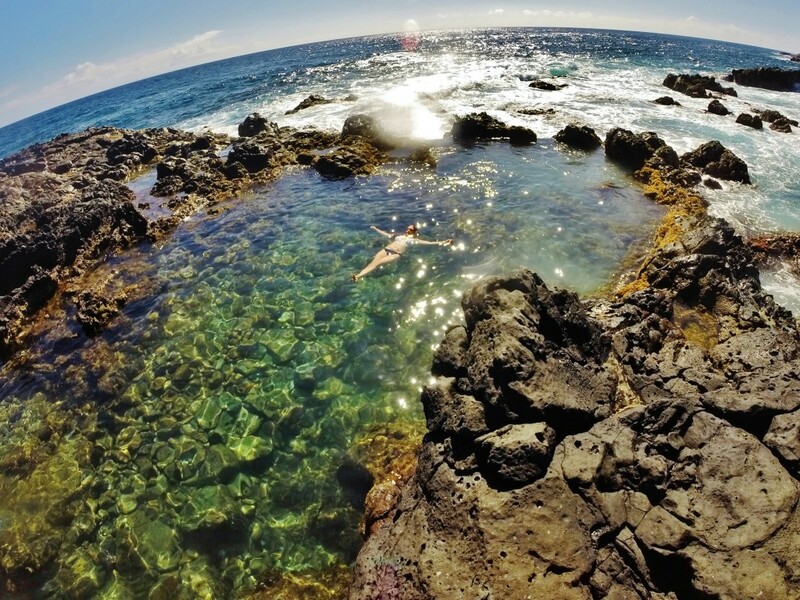 So lets be honest, not only is Maui the perfect place for recreation, it is the perfect place for relaxation. 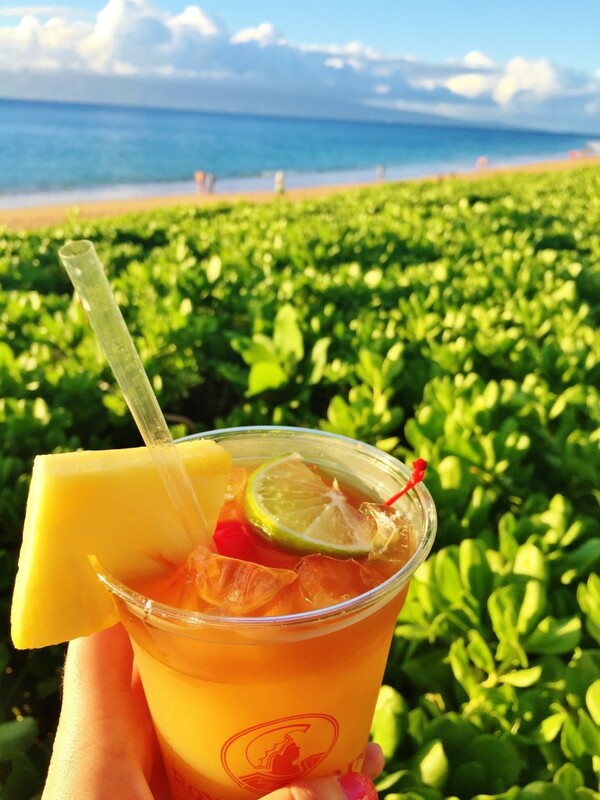 What better way to relax than with a cool Mai Tai in hand laying beach-side watching the clear blue ocean waves crash upon the soft sand? There isn’t one. 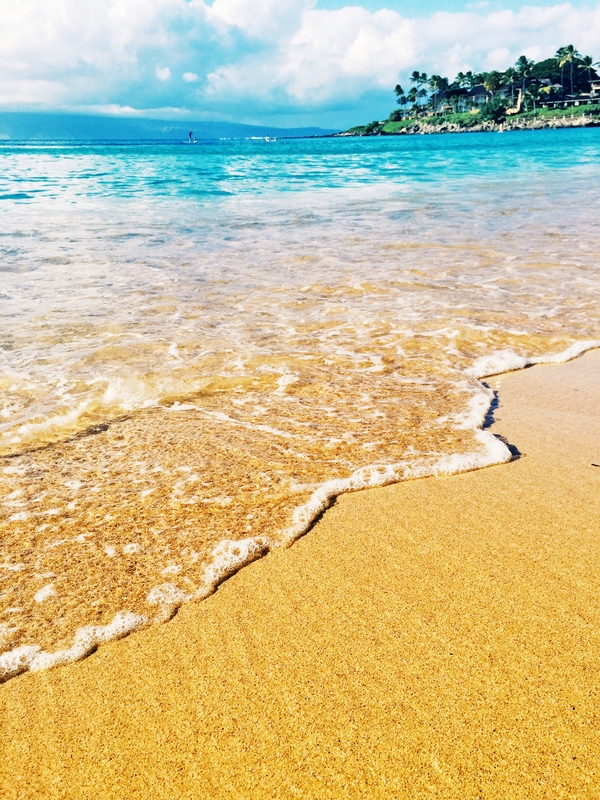 No matter how adventurous your Maui trip is, don’t forget to allow time to kick back for a little and do absolutely nothing. 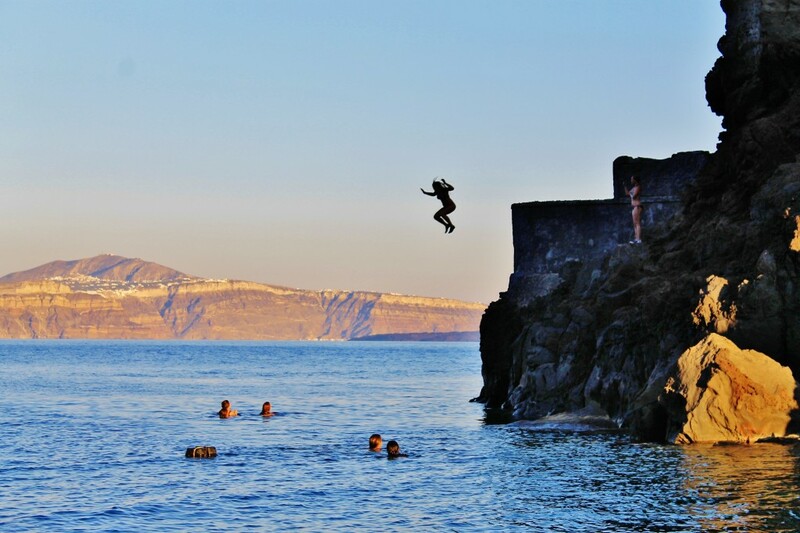 So when I knew that I would be traveling to Santorini, cliff jumping quickly made its way to the top of my to-do list. I had googled and researched good spots, but all I really conjured up was a picture of the rock I was looking for and the city that it was in. No directions. So I decided to make some. So at 4:00 AM, my friend Skylar and I got on a bus to Oia to try to find this cliff. After wandering around for about an hour and getting some help from local fisherman, we made our way to the cliff…and it really wasn’t that complicated at all. Also, if you are a fan of the Sisterhood of the Traveling Pants movies, this post will take you to some of the spots from the movie. 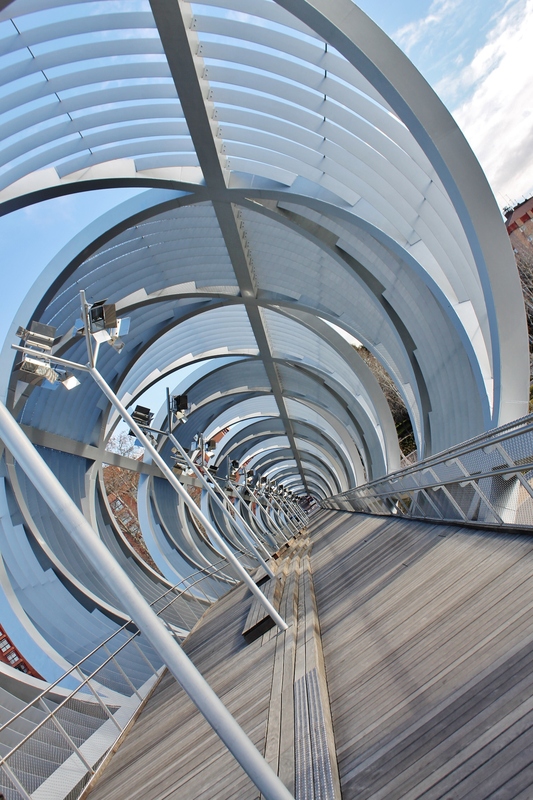 It can be a little confusing to find the stairs through all of the tightly-packed buildings. 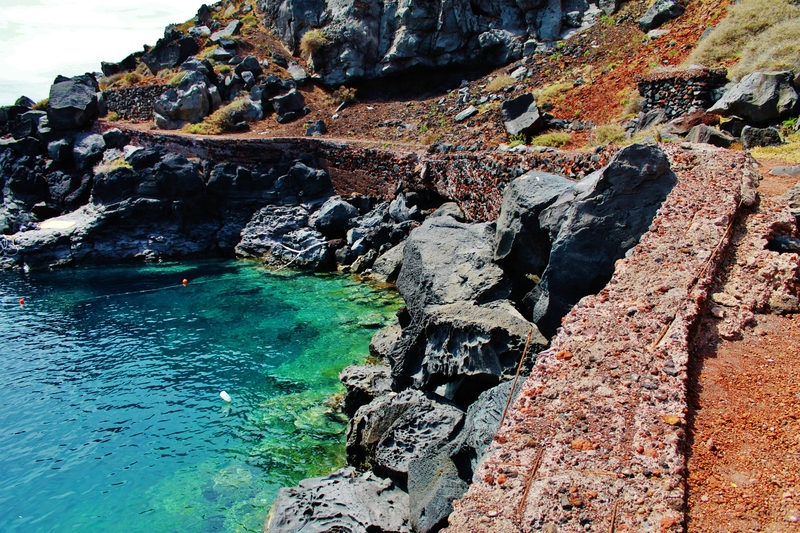 Just follow the signs that say “Amoudi Bay” and stay on the main arteries of the town, you will eventually run into them. If that doesn’t work, you can always ask a local. They are very friendly in Greece! This should be your view. Keep moving towards the restaurant. You will eventually run into this path. This is the path that takes you to the rock. You will have to climb over a couple of rocks and maneuver your way around, but you will eventually come upon the cliff sitting out a little ways in the water to your right (you have to swim to get to it). As you go around the bend (before you come up opon the rock in the water), you will see the rock that the girls in The Sisterhood of the Traveling Pants II jumped from (pictured below). We didn’t jump from this one because the area was roped off and had a couple of boats down at the bottom. Be very careful because there are some gaping holes in the trail and as the sign says, watch out for falling rocks. 4. Swim out to the rock and start jumping! Tip: You do NOT have to scale the side of the cliff to the top to get up to the top (pictured below). I learned this the hard way. After almost falling to my death while scaling the side of this huge cliff, I realized that there was a very convenient and accessible stairway located around on the backside of the cliff facing away from the city. There is a flat, tiled part of the cliff on the top where you jump from. This is also the place (on the bottom near the water) where Lena in The Sisterhood of the Traveling Pants jumps into the water which was pretty neat if you are a fan of the movies. 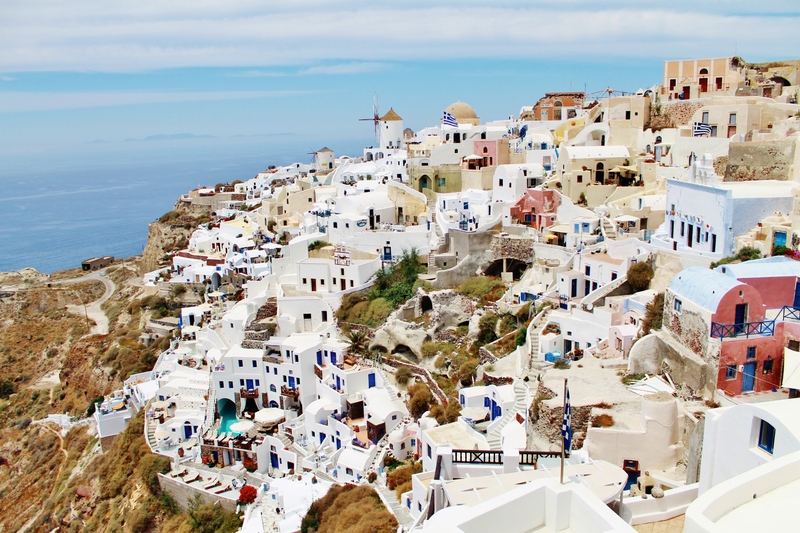 Out of all of the cities on the island of Santorini, Oia is by far the most beautiful. There is so much to do and see in this gorgeous town. 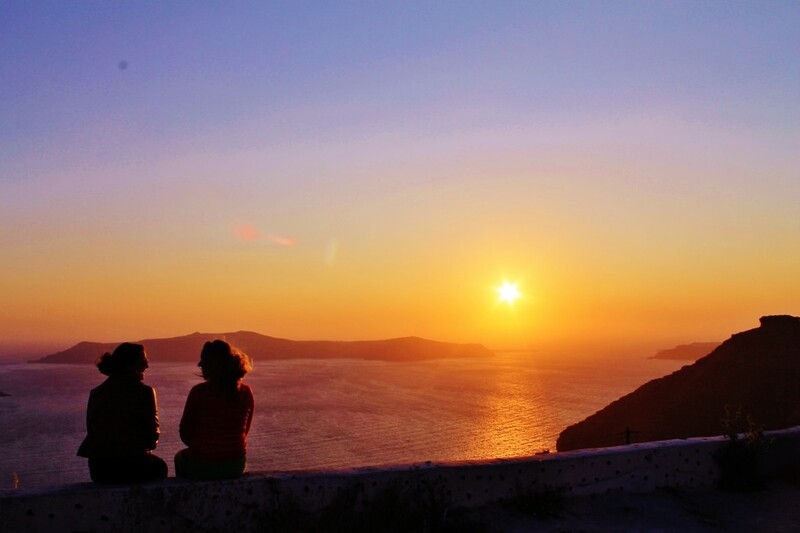 Whether it is eating at a bayside restaurant with freshly-caught seafood, gazing at the turquoise waters of Amoudi Bay or watching a breath-taking sunset, Oia is your place. There are also many locally-owned shops with unique and handmade goods which are always fun to peruse. 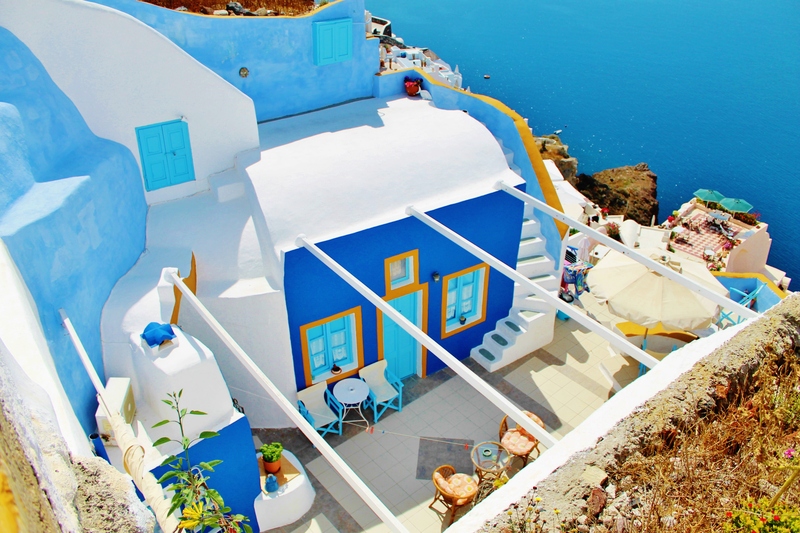 The views of the quaint, white houses over the red cliffs with sapphire water down below is almost magical. 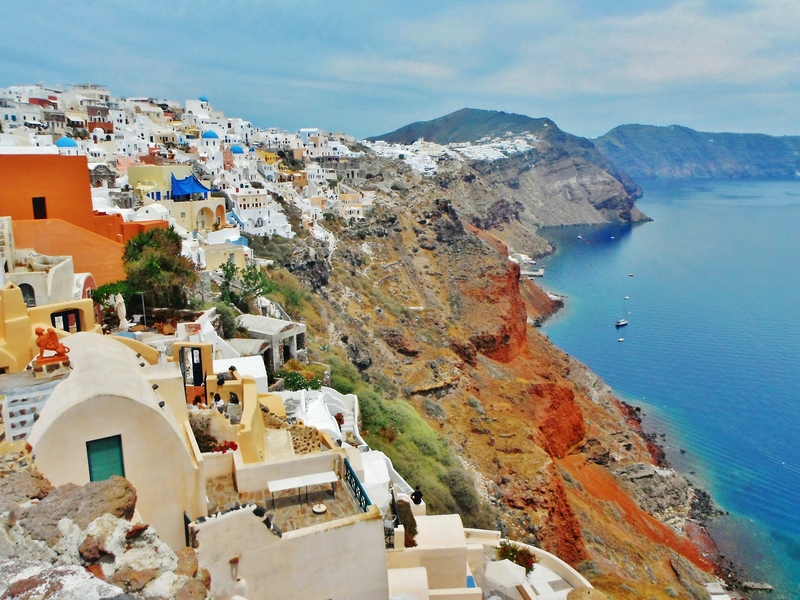 There no town like this one in the entire world and is a MUST-see when coming to Santorini. Red Beach is located in the Akrotiri area. 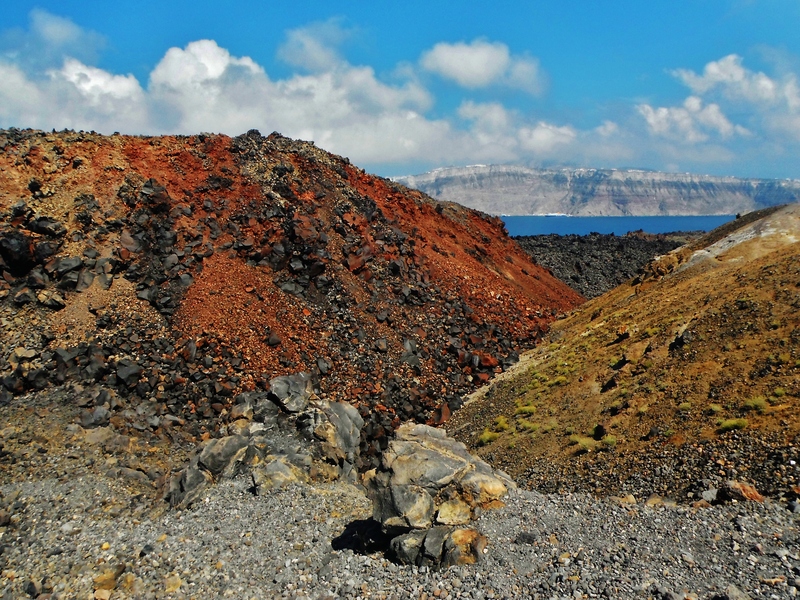 Because Santorini is a volcanic island, the volcano caused many different colors of sand and rocks on different parts of the island. 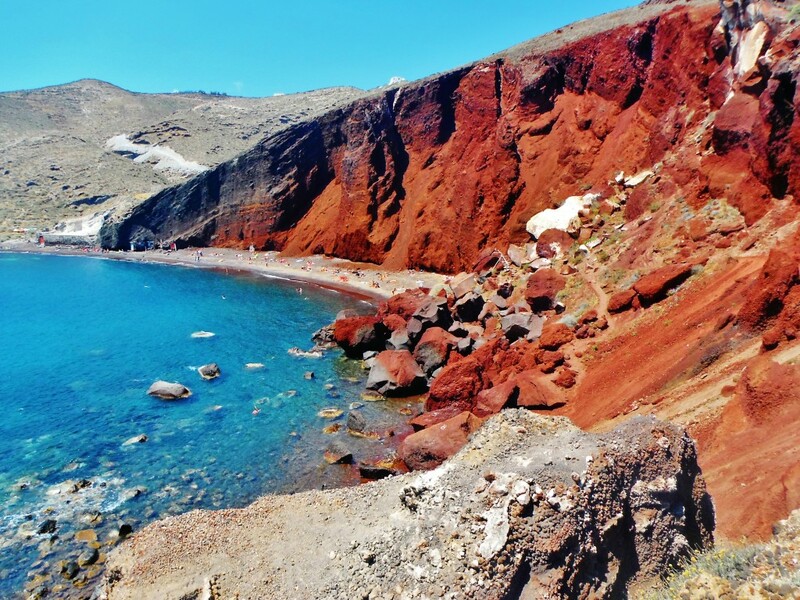 (There is a black, white and red beach on the island). Red Beach is definitely a little bit of a walk from the parking lot, but it is worth it. If you are looking for an easily accessible, sandy beach then this isn’t the beach for you. 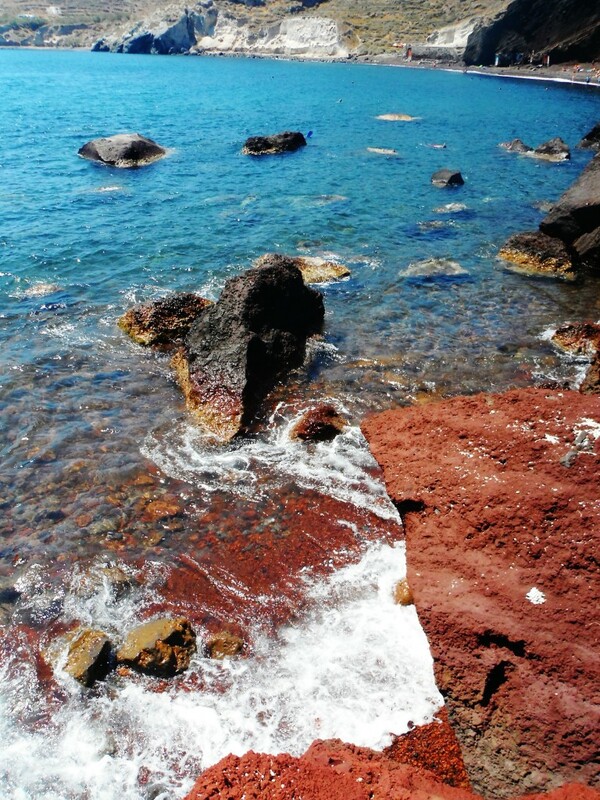 Come to Red Beach with a mindset of exploration and climbing the rocks to get down to the bottom will be fun. Even though it is a little bit of a hike, the scenery waiting for you at the end is extremely rewarding. We couldn’t get over how clear the water was! Also if you have rock shoes, bring them. 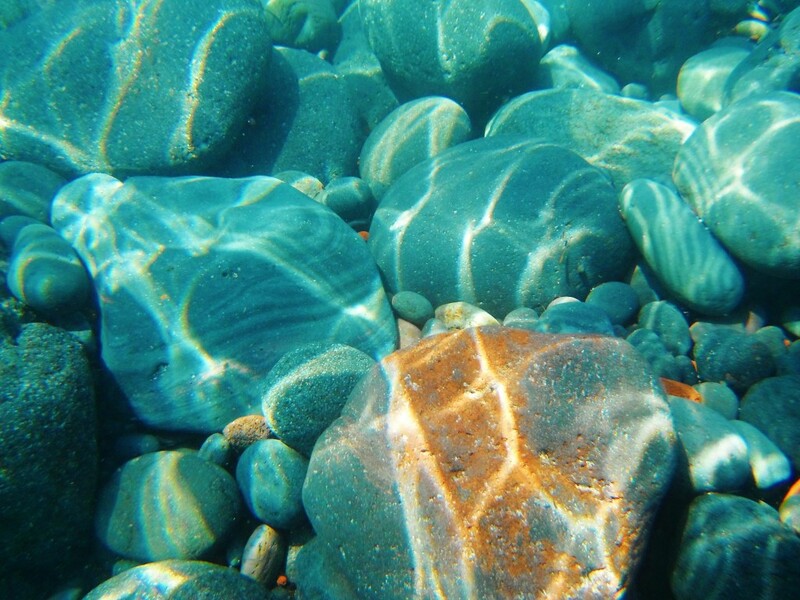 The bottom of the beach is more rocks than it is sand. 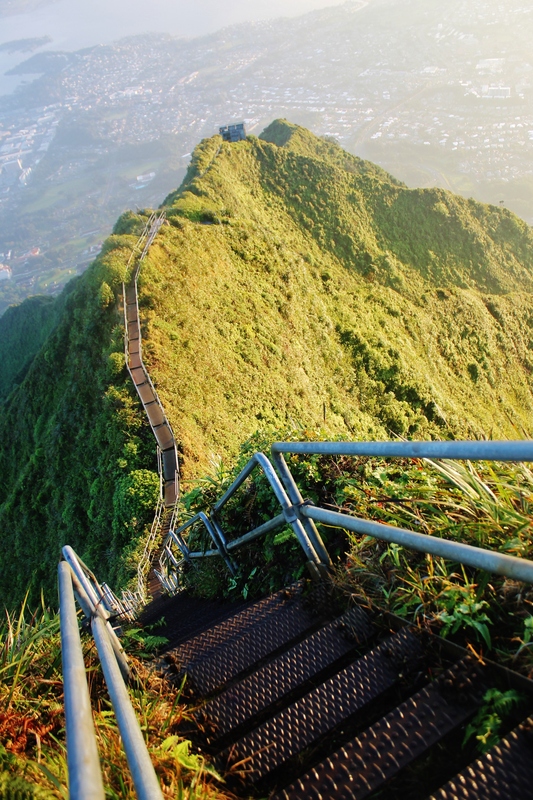 Ahh…the steps. 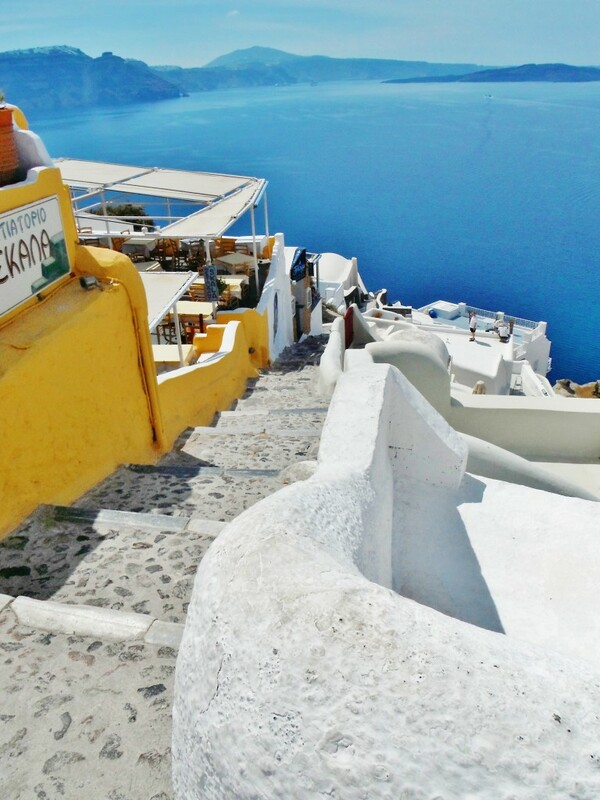 The steps are located in the town of Oia. 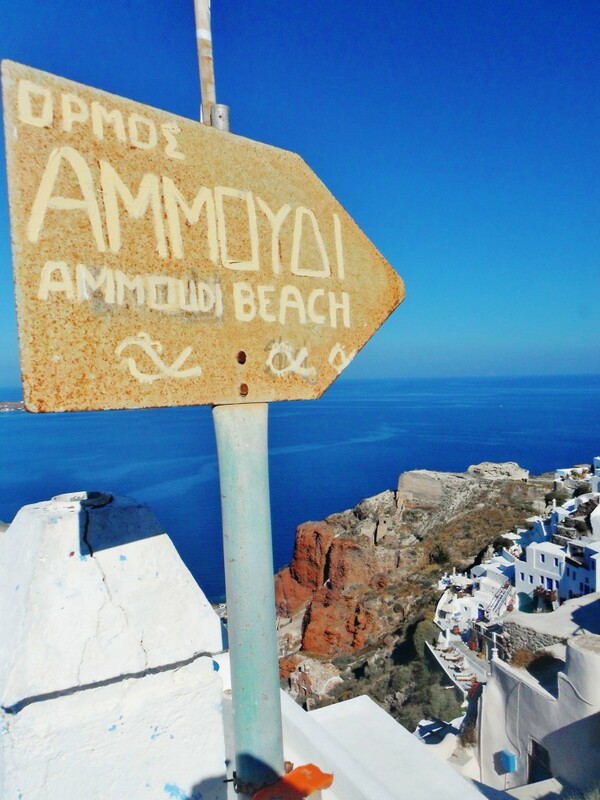 When going through the town just follow the signs for Amoudi Bay and you will eventually run into them. (If you don’t see the signs you can just ask a local, they are typically very nice and friendly). We probably climbed up and down these things ten times upon leaving. Climbing the steps is definitely a little bit of a challenge. 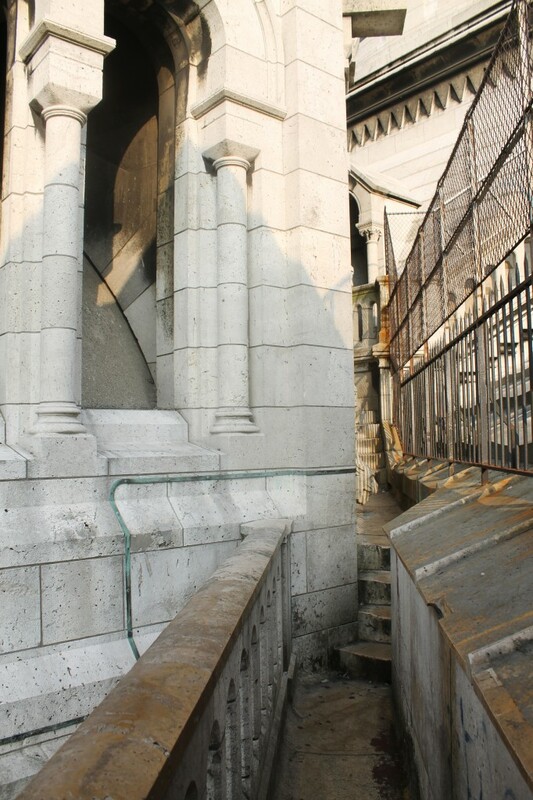 The steps are crooked, large, jagged, plentiful and all different lengths which is what makes it so difficult. 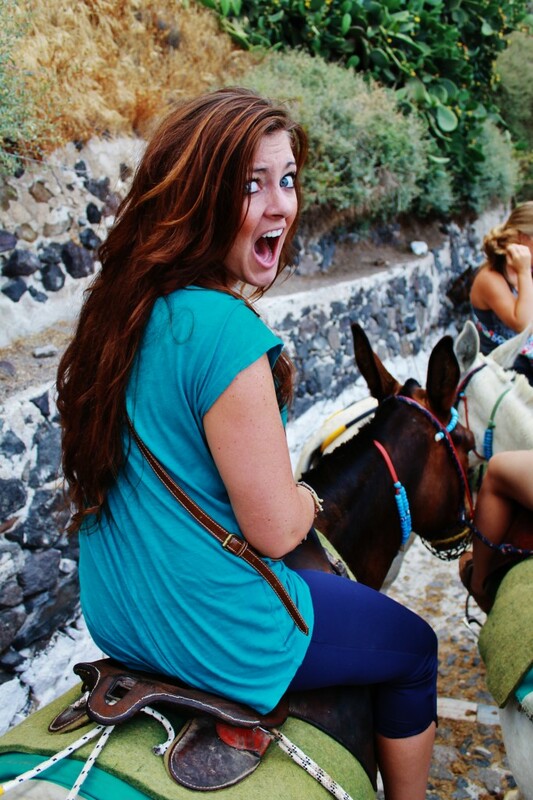 Some people pay to take donkeys up and down which I will talk about later. The reason I recommend taking the steps is because there are many pretty places along the way to admire the view or snap a picture and of course, the good old feeling of self-accomplishment. 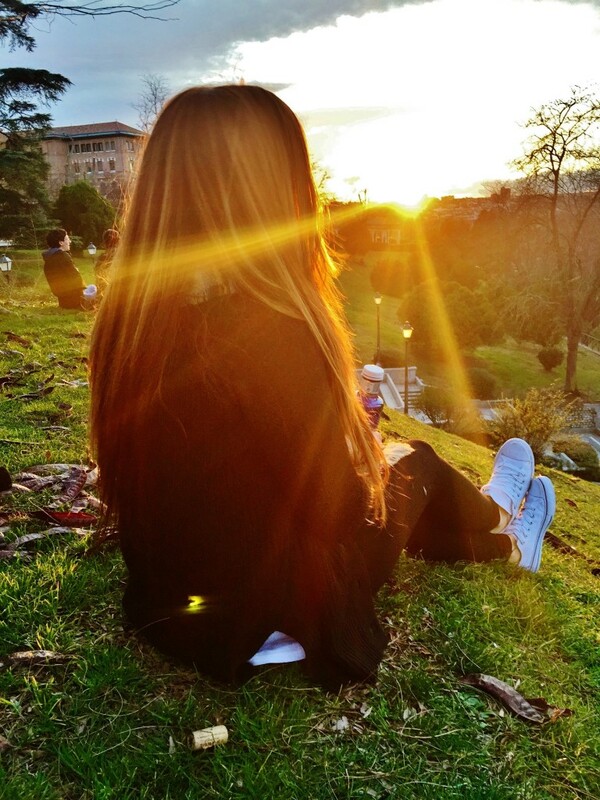 The good thing is you can go at your own pace and it is a beautiful view for whenever you decide to take a break. 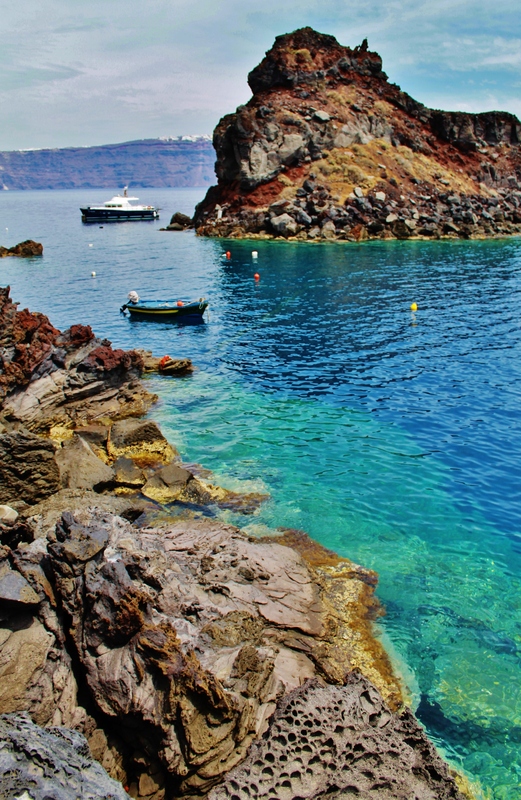 Waiting for you at the bottom is the beautiful Amoudi Bay. The views down by the bay are beautiful. The water alone is worth seeing. It was a beautiful turquoise, emerald color when we went. 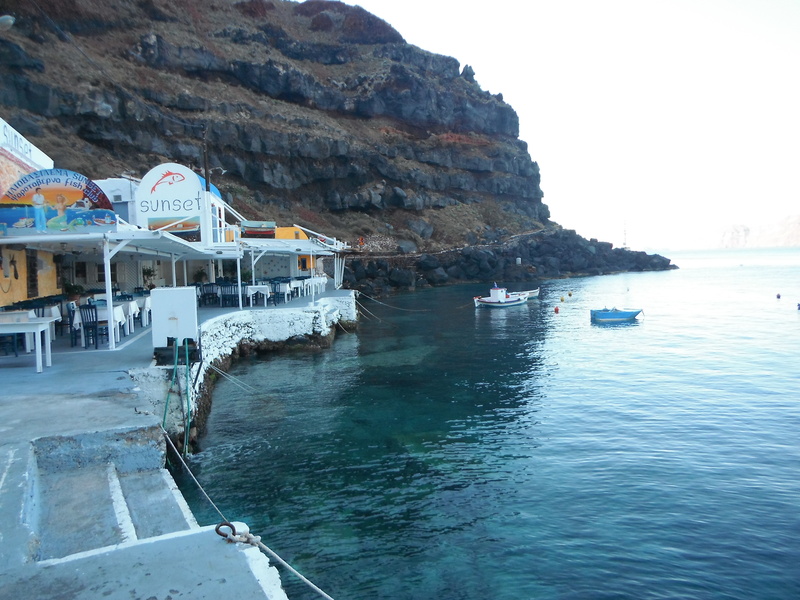 There are also a couple tavernas to relax and enjoy fresh seafood caught by local fisherman. 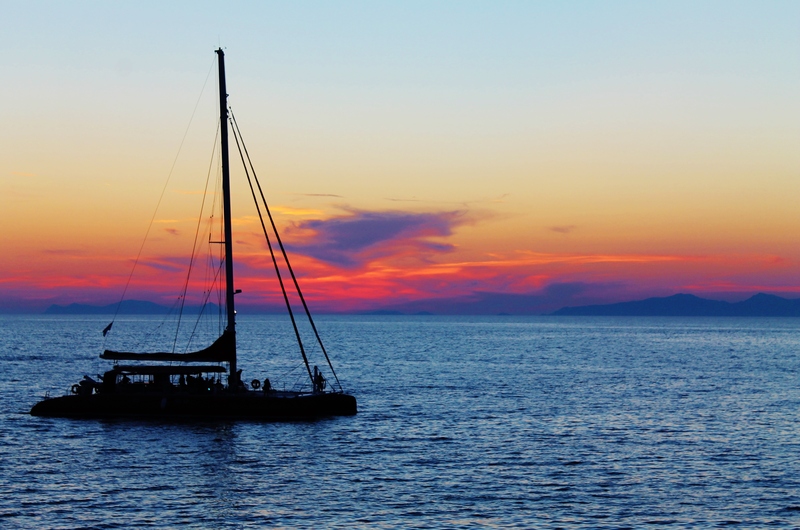 You can also take a catamaran tour out of the bay or go jump of the cliffs. 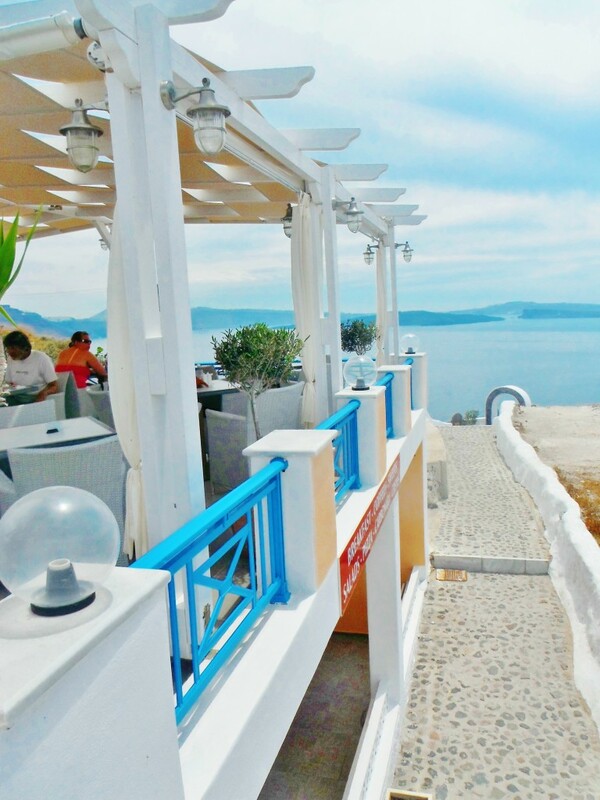 There are many places to eat in Santorini, but you might as well take advantage of your location and eat somewhere with a view! Dining while gazing over the houses and cliffs out onto the water is unreal. Here, we dined at the Nocturna Cafe in Oia. The food was decently priced and tasted great. It was mostly American/Italian cuisine but we were craving that after having been away from the states for so long. The service was fast and the interior decor was very chic. It made us feel like we were at a very expensive resort. They even had a little button that they gave you to buzz the waiter. 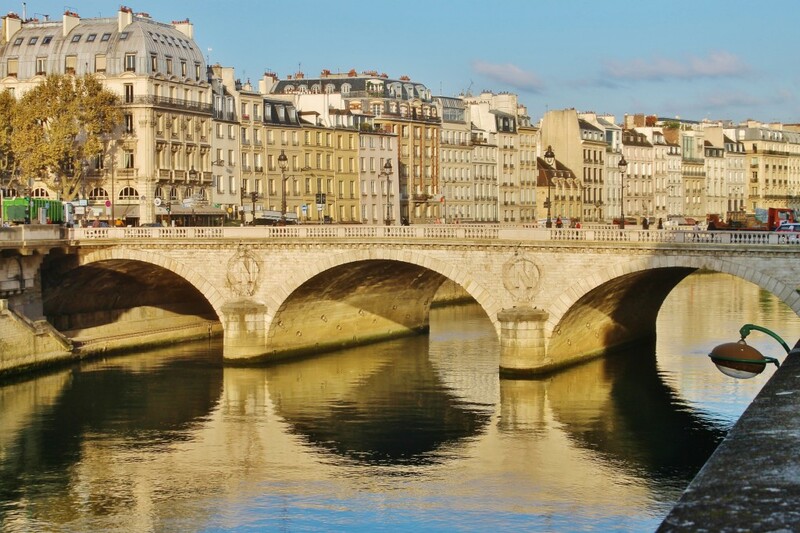 Tip: If this is your first time traveling to Europe, they typically don’t split checks so if you are going with a couple of friends, just make sure you have some extra euros. Okay so this was one of the scariest things that I did the entire trip. Let me preface by saying, if you don’t like a little thrill then don’t do this. 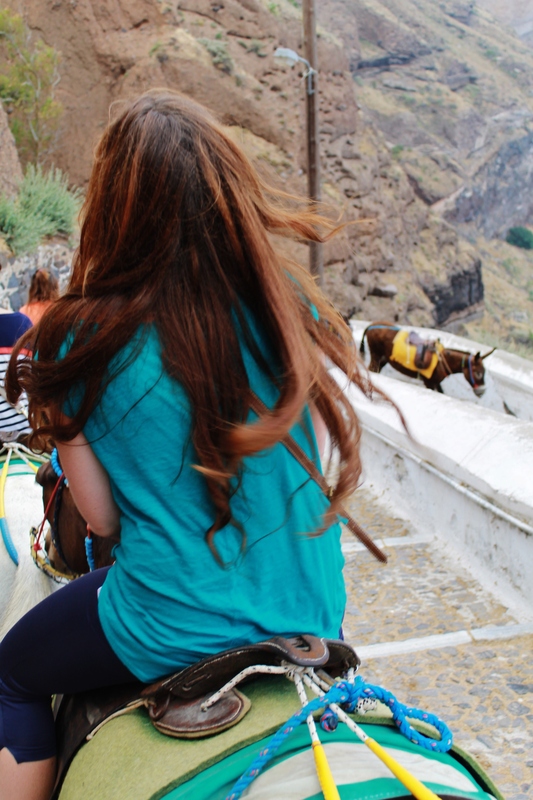 Or just ride the donkey down the steps and climb back up on your own. 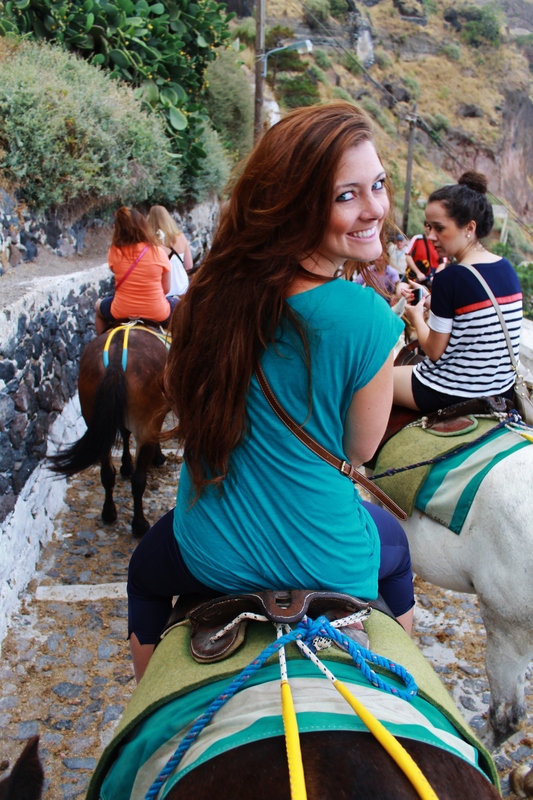 You can ride the donkeys in Oia, but we rode them in Fira. We paid 10 euro for both ways (up and back down). Otherwise, it’s 5 euro each way. Going down was a little awkward feeling but the donkeys were calm and stayed in a straight line. For us, the journey back up was where the excitement was. It is basically a free-for-all for the donkeys and they just kind of race up the steps in no particular order. They are all bumping into each other and you don’t really have any control. 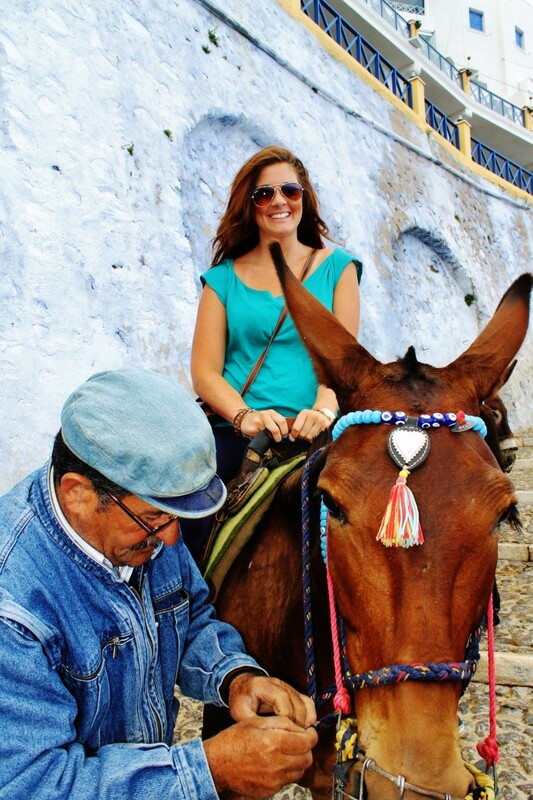 Even though it can get crazy and a little bit scary, you don’t want to miss out on this fun Santorini tradition. It’s definitely a great adventure to add to the books! 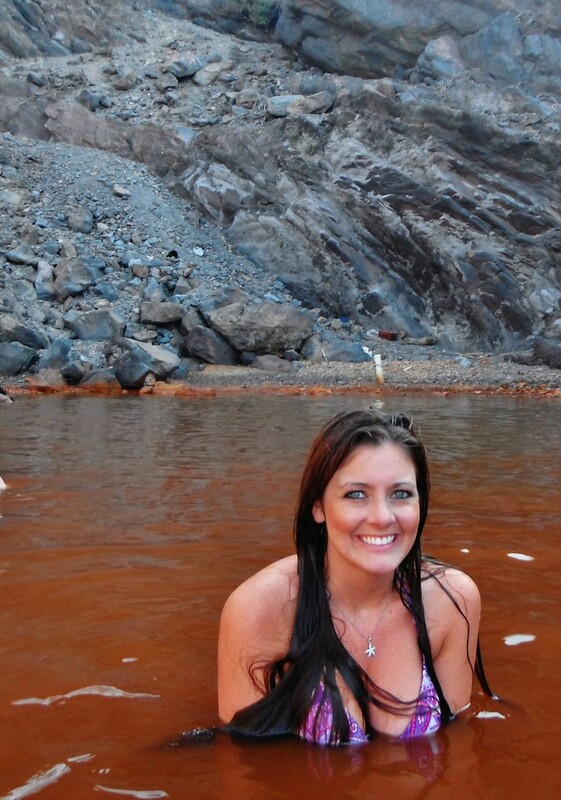 Cruises to the volcano and hot springs typically run somewhere around $100. 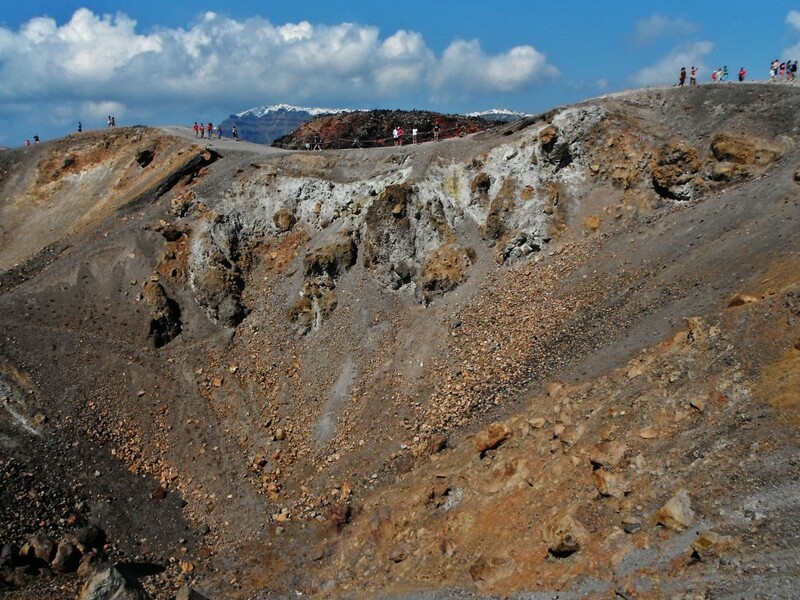 This was really neat because we got to hike up the volcano and see points where it was still releasing hot fumes. 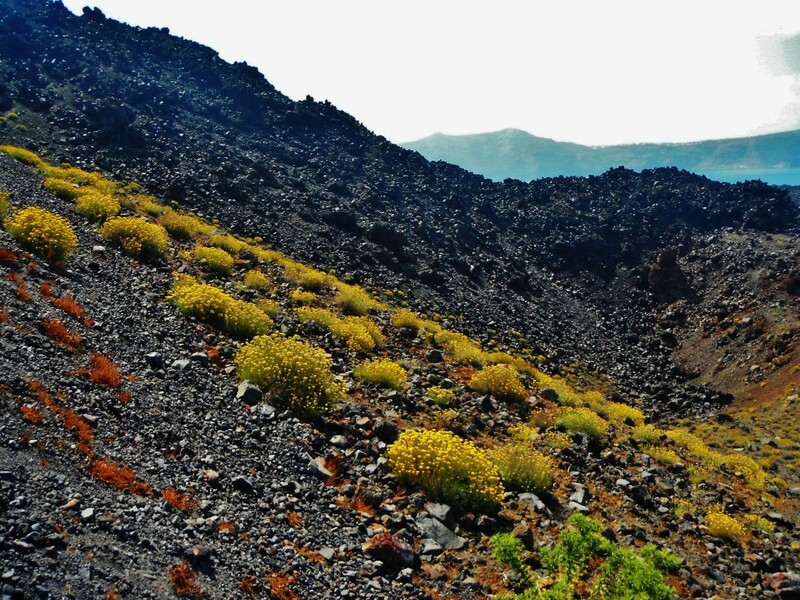 There was also magma and lots of lava rocks produced from the volcanic activity over the last 3,000 years. The hot springs were also pretty neat. The blue water surrounding the springs was very cold, but as you get closer and the water gets brown and cloudy, the water gets warmer. 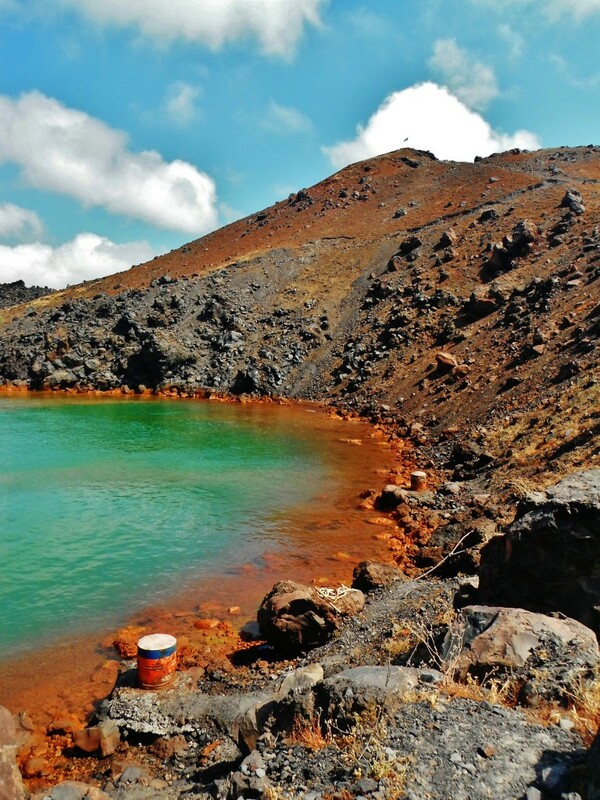 There is a high sulfur content in these volcanic springs which are said to have many healing qualities! 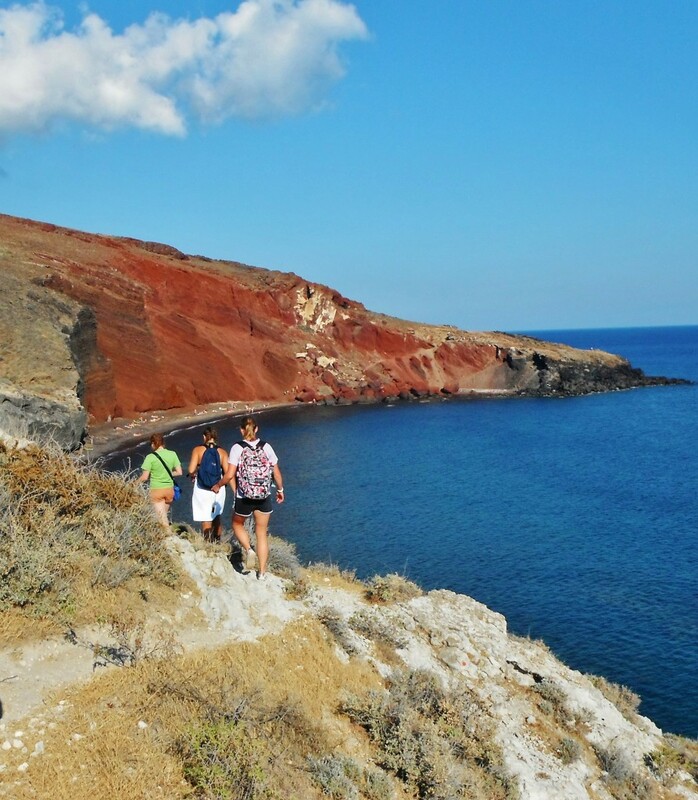 Because Santorini is very mountainous and rocky, it is the perfect place for scenic hikes! We went on a trail that was located just beyond Red Beach. Just keep going past the main beach area and you will eventually see the trail. 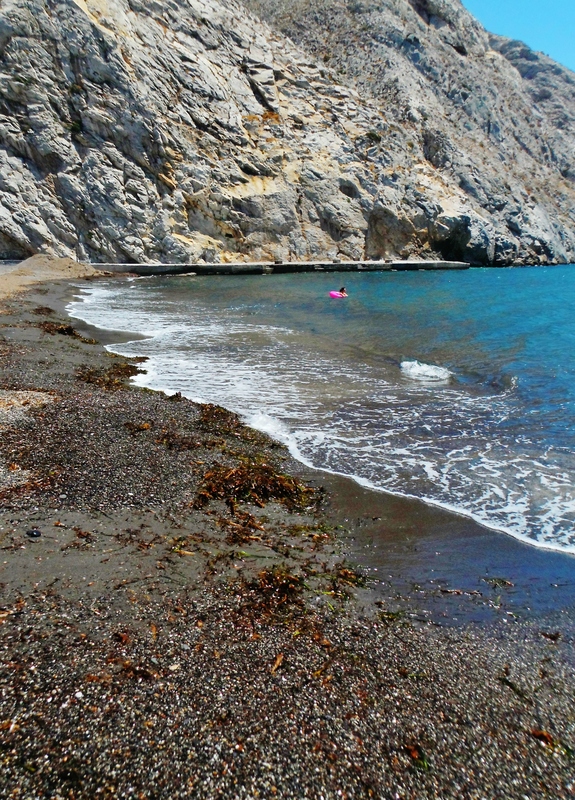 We went on to find another beautiful secluded beach with white cliffs. Near the beach, there was a little locally-owned restaurant/snack stand. I ordered some french fries and the woman serving me said, “It will be about 30 minutes because I have to peel the potatoes.” Needless to say they were the freshest french fries I have ever tasted. 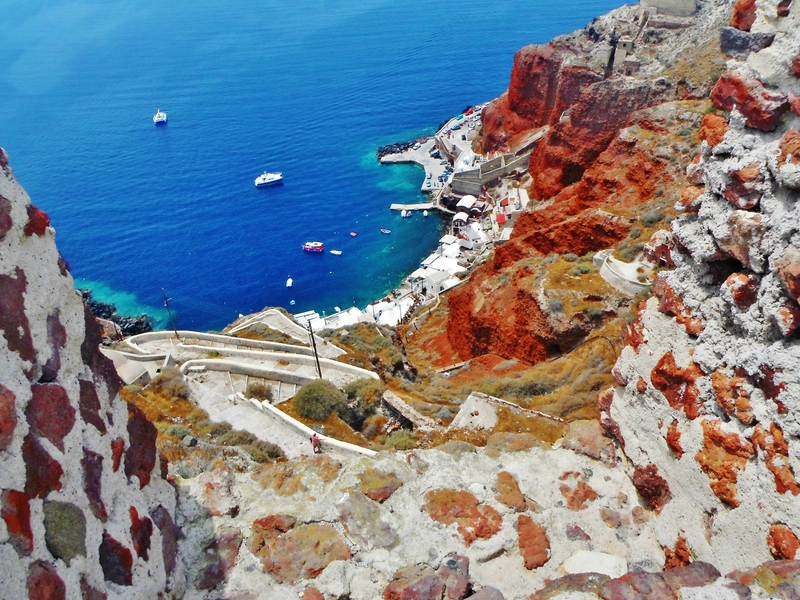 You can’t go to Santorini and not jump from the famous cliff down by Amoudi Bay. For directions and more details, see my post . At first, we were all being wimps and jumping from the smaller rocks closer to the water until the most cautious, timid girl out of our group ironically convinced us to try it from the highest point. It was pretty scary at first because the water is so clear that it looks very shallow. Just make sure that you get a running start and jump out away from the rocks. 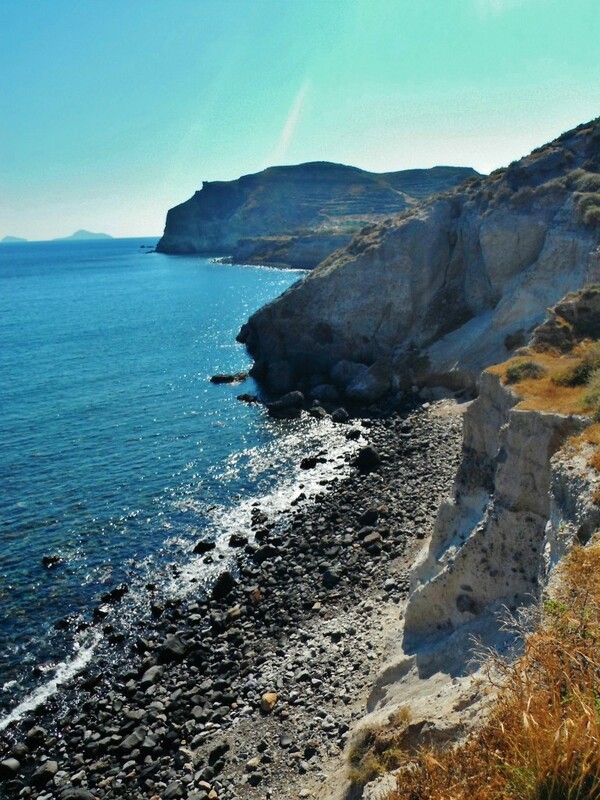 For directions on how to get there check out my post Cliff Jumping in Santorini . Disclaimer: This can obviously be very dangerous so use your best judgement and don’t do it if you think you can’t jump out past the rocks. There are also lower points you can jump from which are much safer and still fun. 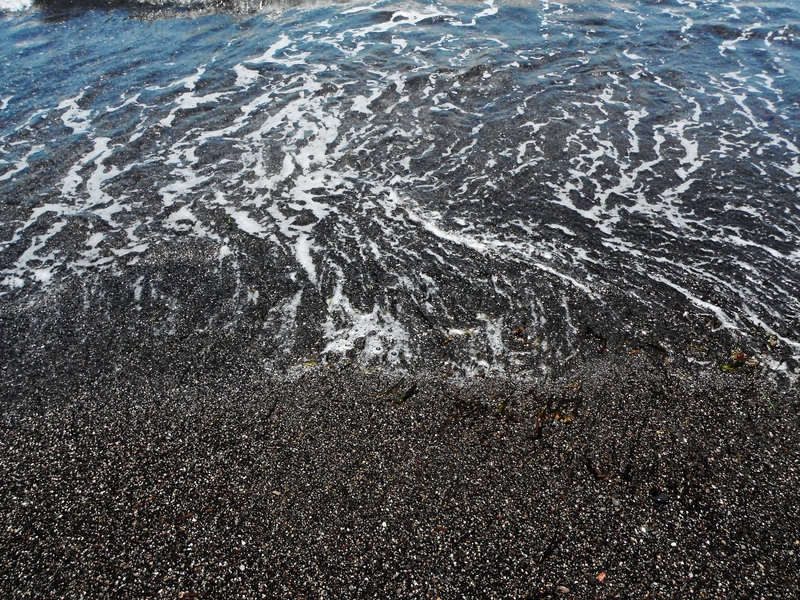 Black Beach is yet another courtesy of the volcano. As you can see, the sand really is BLACK. 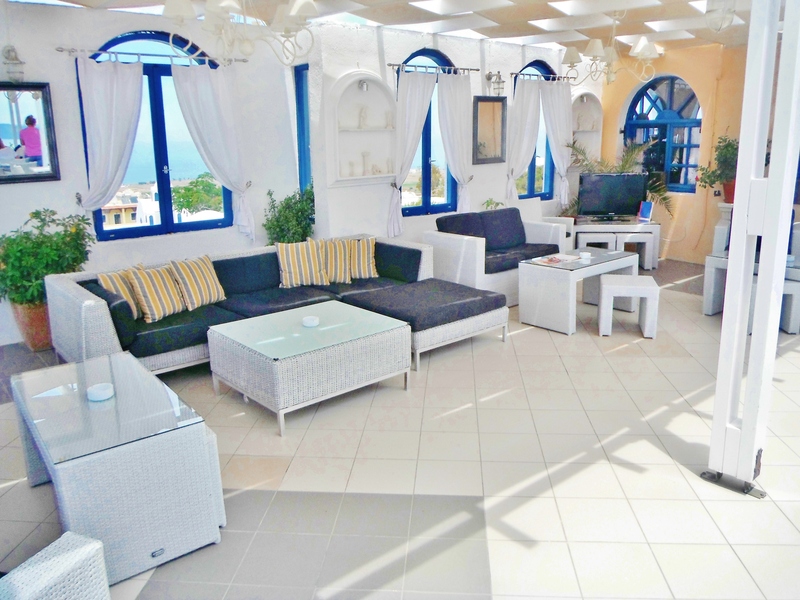 Black beach is a fun hangout because it has many restaurants and is good for relaxing. It isn’t comparable with the beauty of Red Beach but it is definitely something to check off the list. There are lots of lounge chairs set up at certain venues and you can use them as long as you order a drink or a meal from the venue. I would recommend doing this because the sand gets very HOT, especially in the summer time. 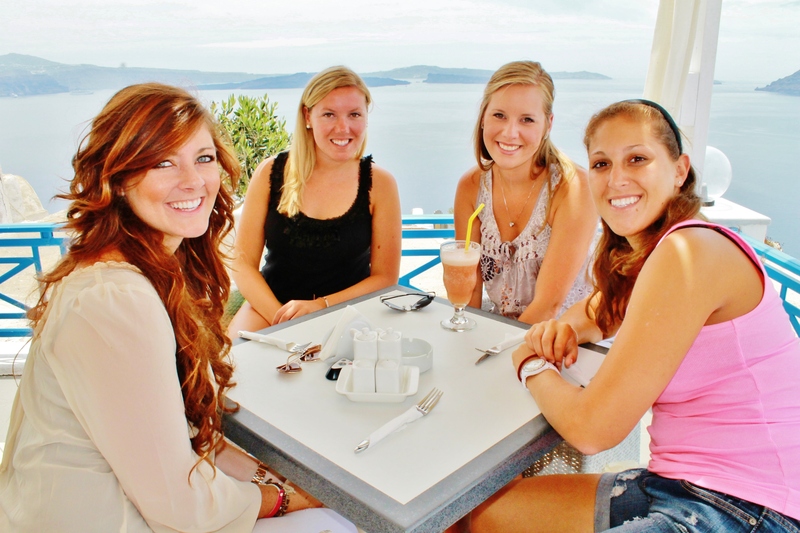 Choosing a restaurant isn’t too hard because almost all of them have really great views and are right on the water. 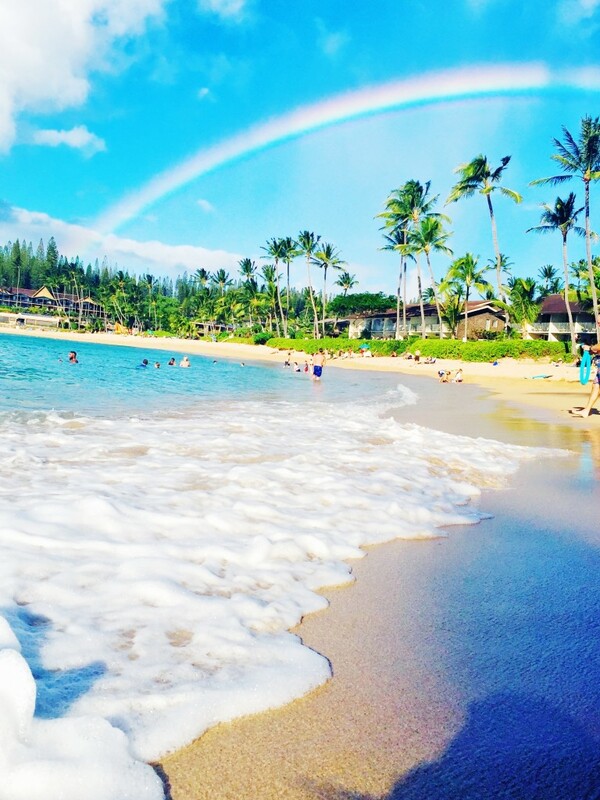 Just know beforehand that you will probably be spending some money if you go to this beach. 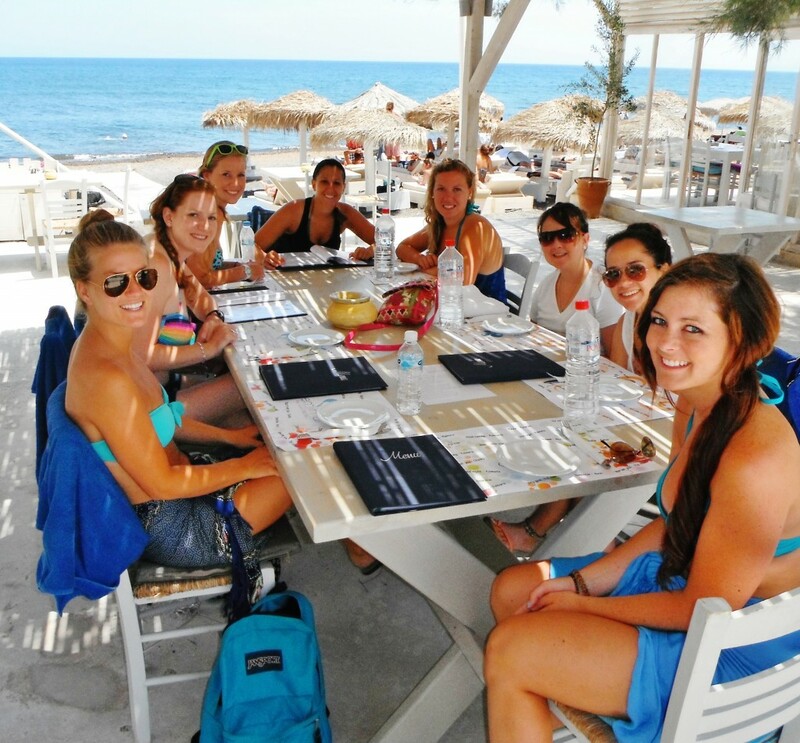 We ate at one of the restaurants lining the beach . I got a greek salad and it was pretty good. Check out that chunk of feta cheese! Before coming to this island, I had heard that Santorini was famous for sunsets. I can definitely see why. 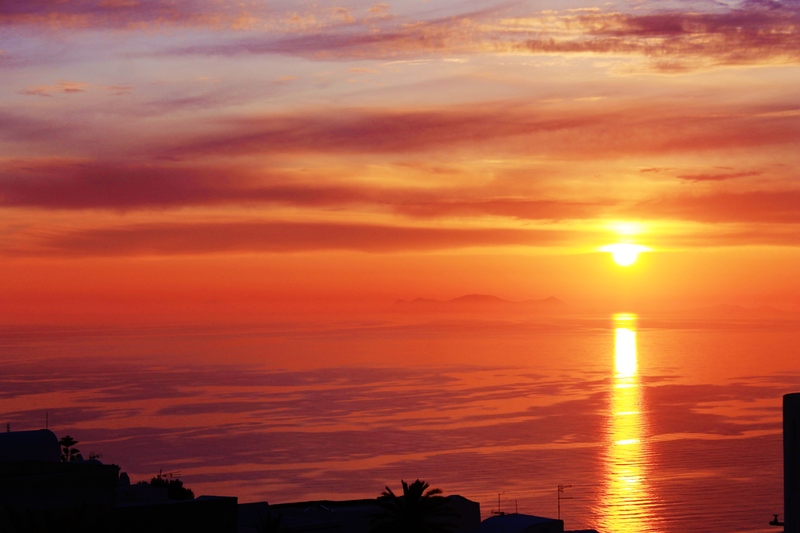 You can get a good view of the sun setting behind the volcano from Fira (pictured above), as well as the town of Oia. 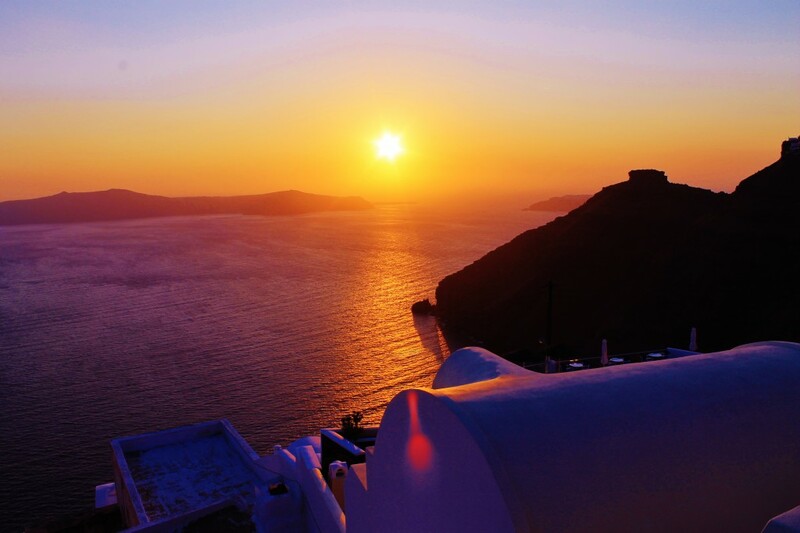 This was the sunset view from a rooftop restaurant where we ate on our last night in Oia. As you can see, it was the perfect grand finale. 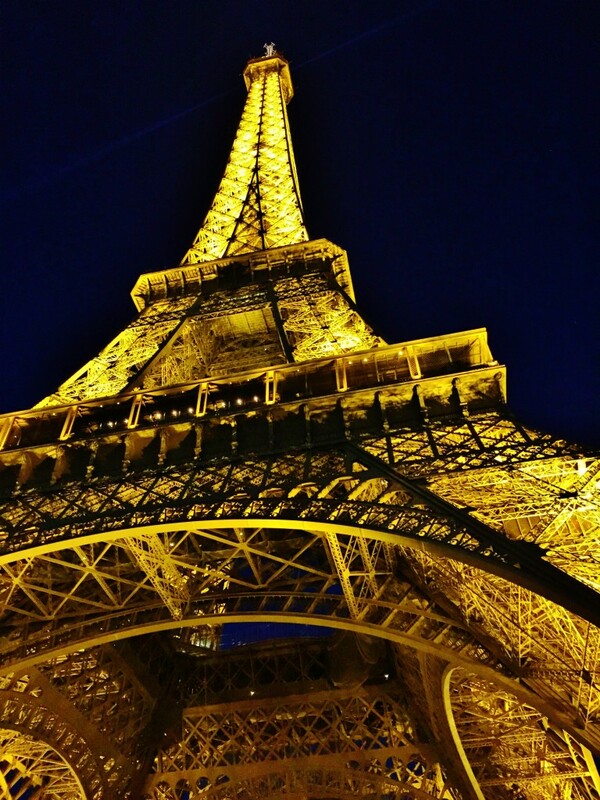 Hotel prices in Paris are sky high. 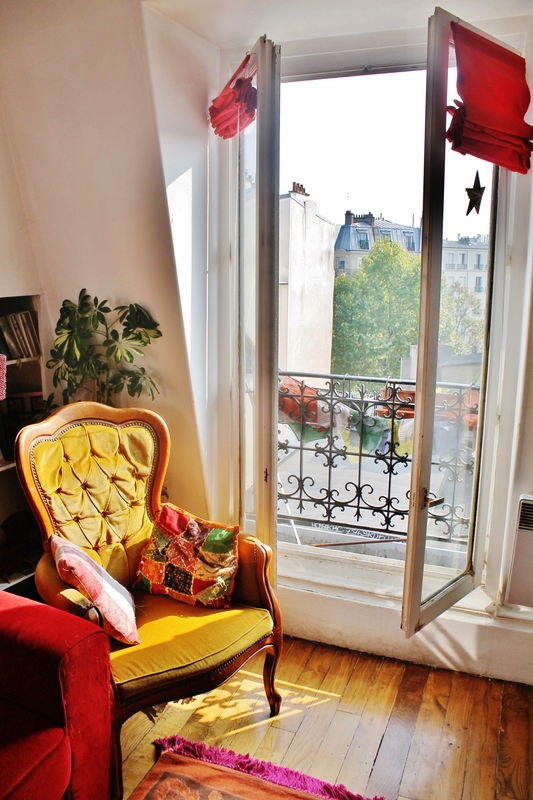 To get the most bang for your buck, renting out an apartment is the way to go. 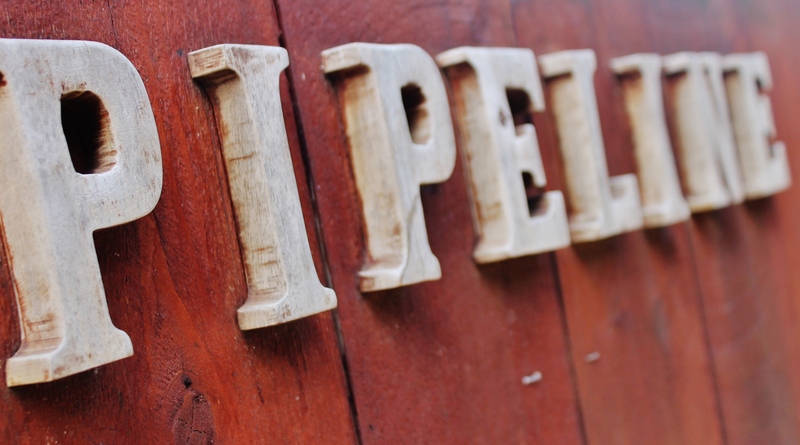 This way, you get to live like a local and see a little bit more than just the touristy areas. My favorite website/app for this is airbnb.com. This is one of the most well known sites out there. The site has hundreds of reliable hosts with reviews of the apartments and a wide variety of price ranges. 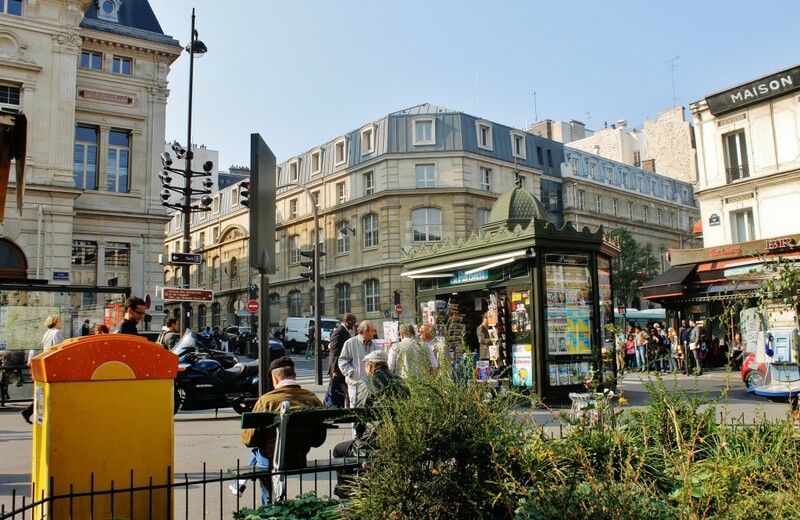 We stayed near the city of Montmartre and were very close to two metro lines. 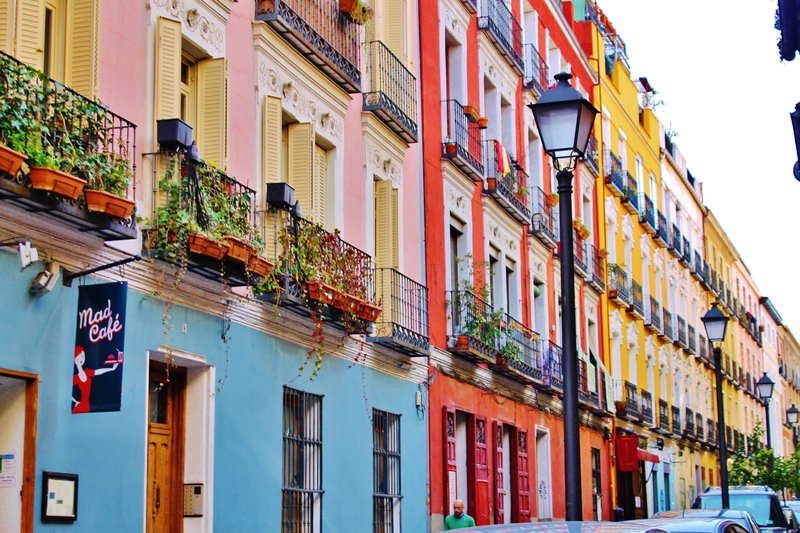 It was great because we could walk a couple blocks and be in the center of a local, bustling neighborhood with cafes, markets, shops, and bakeries. Side note: Most apartments come with fully functional kitchens and cooking utensils which is great for those on a budget. 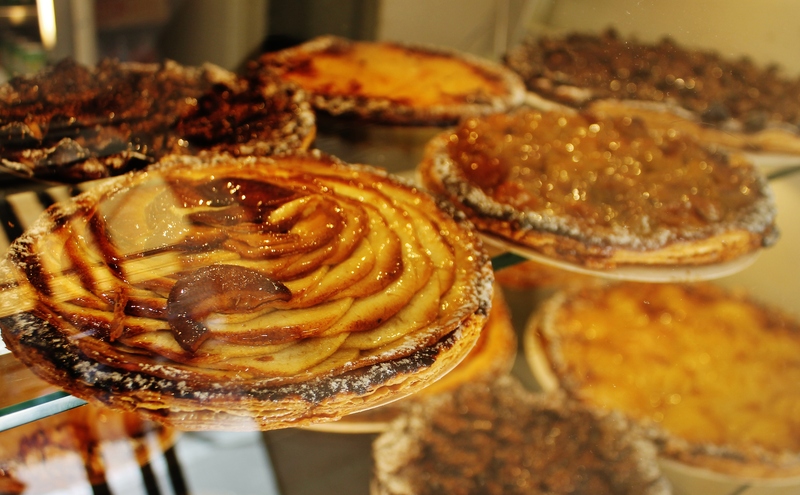 As much as I enjoyed Parisian cafes and restaurants, I loved going to local markets and bakeries and picking out my own fresh food even more. 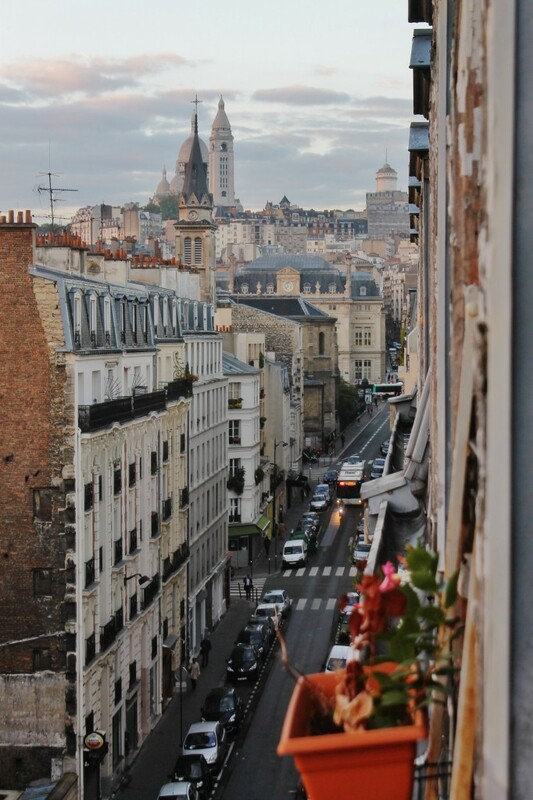 Here is the view out of our apartment window followed by shots of the surrounding neighborhood. 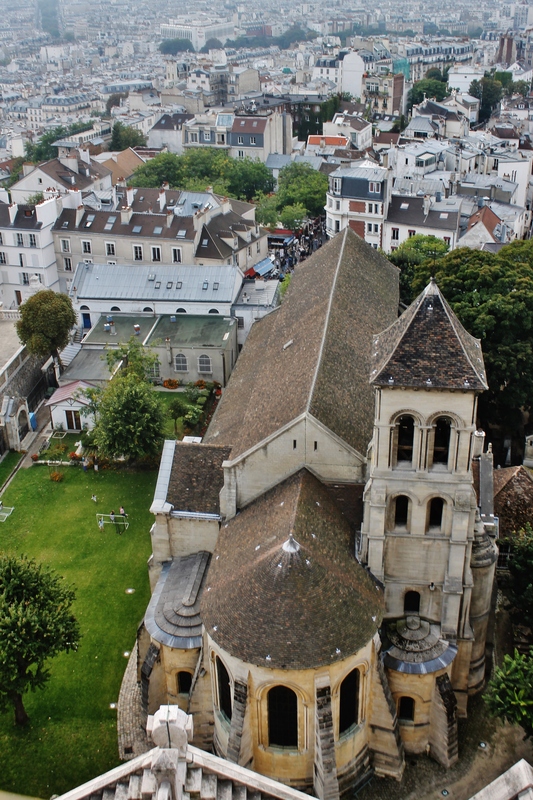 There are many ways to see Paris from above, and they are all breath-taking. 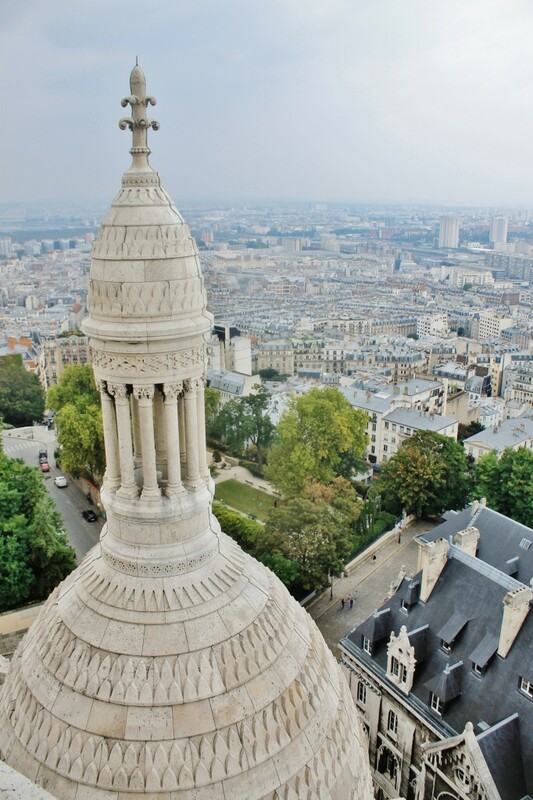 However, my favorite is from the top of the Sacre Coeur. The cost to go up is only about 8-9 euros and it’s totally worth it. There was no line when we went (unlike the Eiffel Tower and Arc de Triomphe). 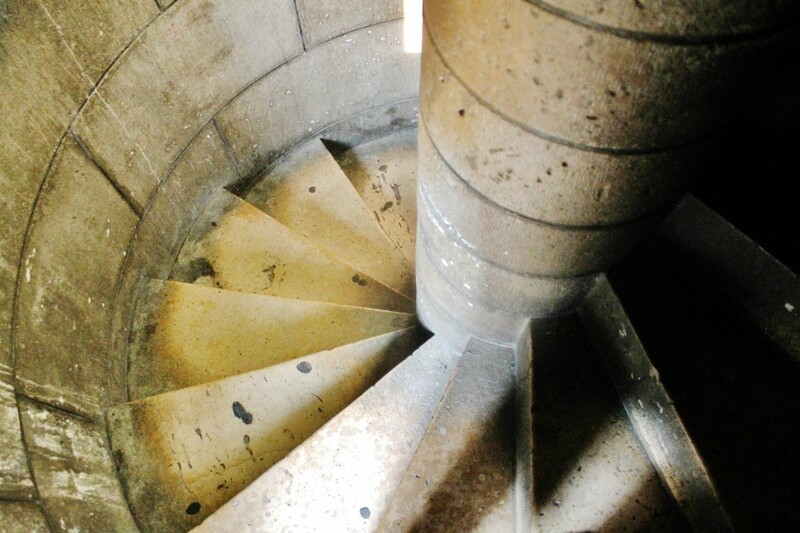 To get to the top, you have to climb up a VERY narrow hallway (no windows) with a winding staircase. It was a little creepy at first since we didn’t know how far up we had to go but the view at the top was definitely worth it! There is also something about being inside this beautiful Gothic cathedral that makes you feel like you are in your own castle. 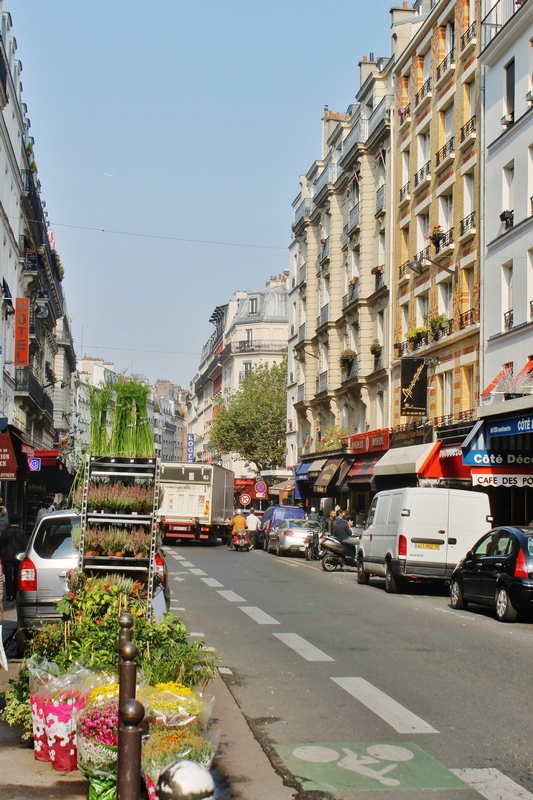 Hundreds of locally-owned cafes and restaurants line the streets of Paris. Eating out at these restaurants can prove to be very pricey if you make a habit of it, but it is definitely something to check off the list. 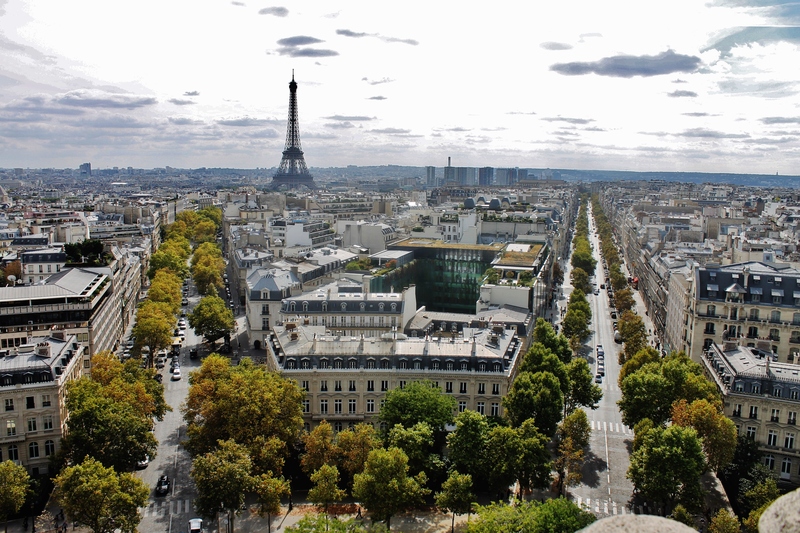 If not for the food, you can always get a glass of wine and take in the scenery of the Parisian streets. 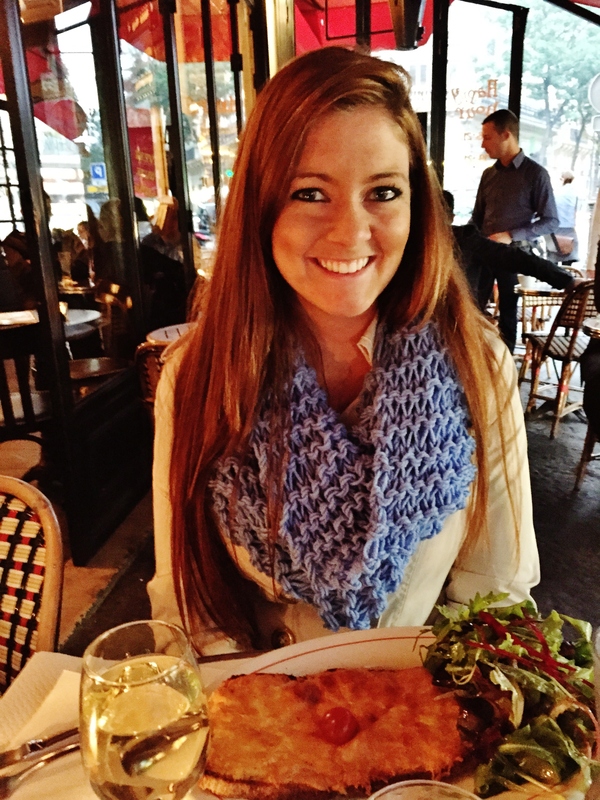 My mom and I dined at Cafe Francoeur near Montmartre. Here, we had croque-monsieur and crouque-madame. 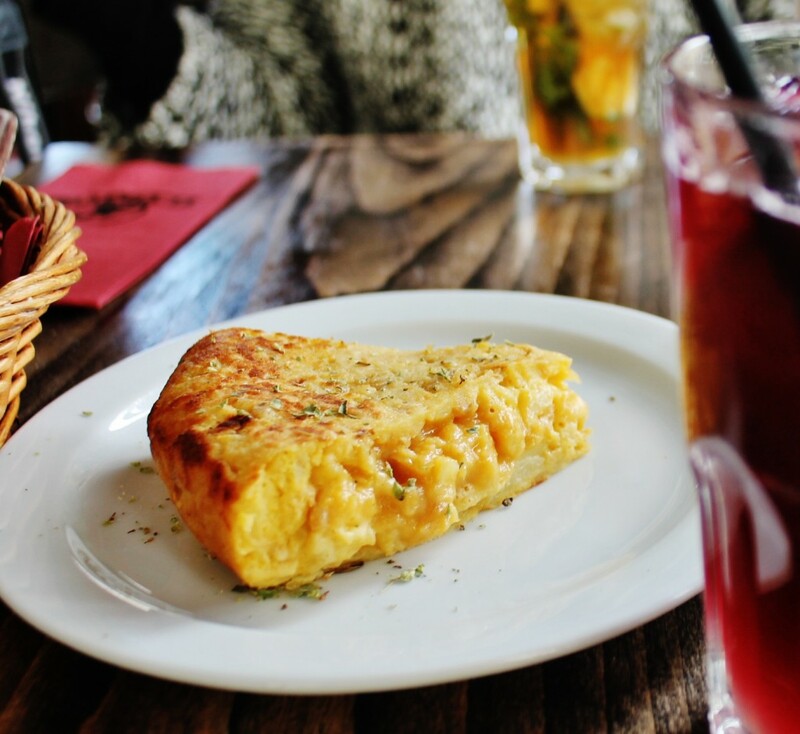 A croque-monsieur is a Parisian specialty that is similar to a grilled ham and cheese but at the same time, not like a grilled ham and cheese at all. All I can say is that it absolutely delicious and you don’t want to make a trip to this city without trying one. 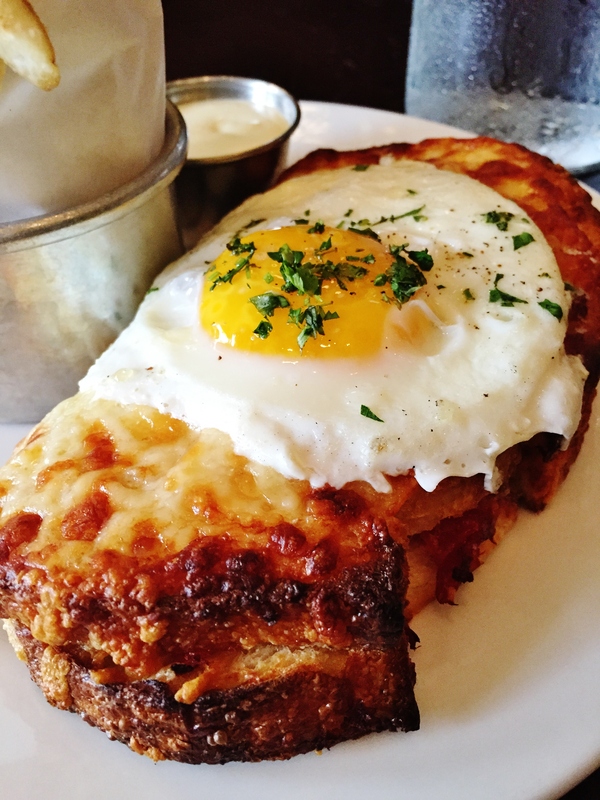 A croque-madame is basically just a croque-monsieur with a fried egg on top. I would recommend the croque-madame over the croque-monsieur but you can’t go wrong either way! The Lock Bridge is something that I have been wanting to visit for years now. 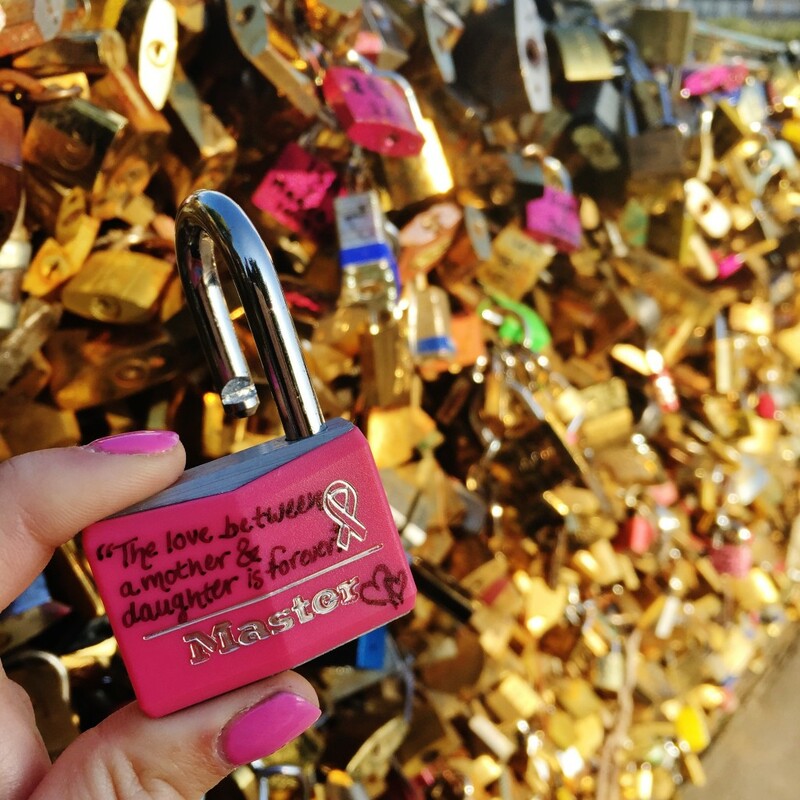 Tradition is, couples attach a lock to the bridge and throw the key into the river. I was a little worried about finding it, but it really couldn’t have been easier! 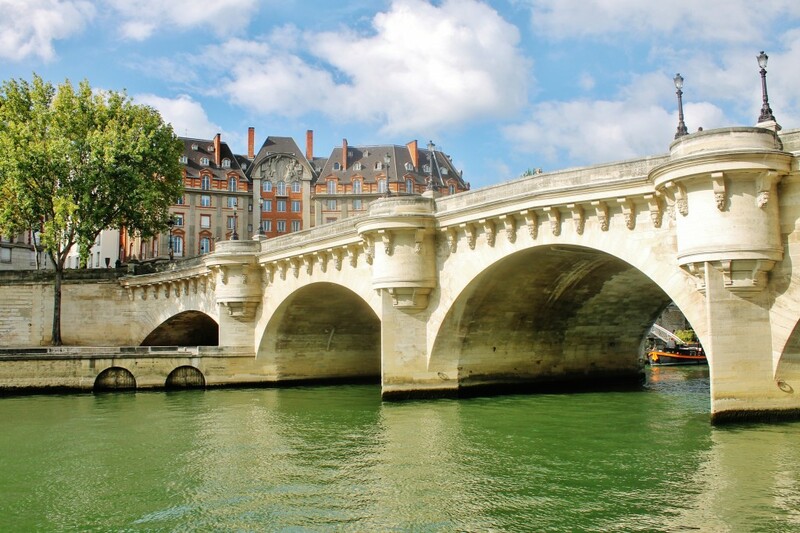 The bridge is located along the backside of Notre Dame. You can’t miss it. 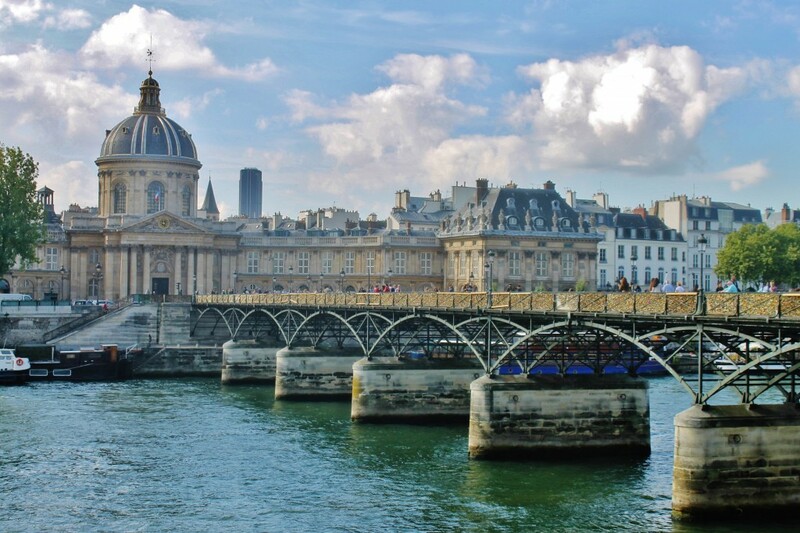 There is also another popular lock bridge located further down the Seine near the Louvre. 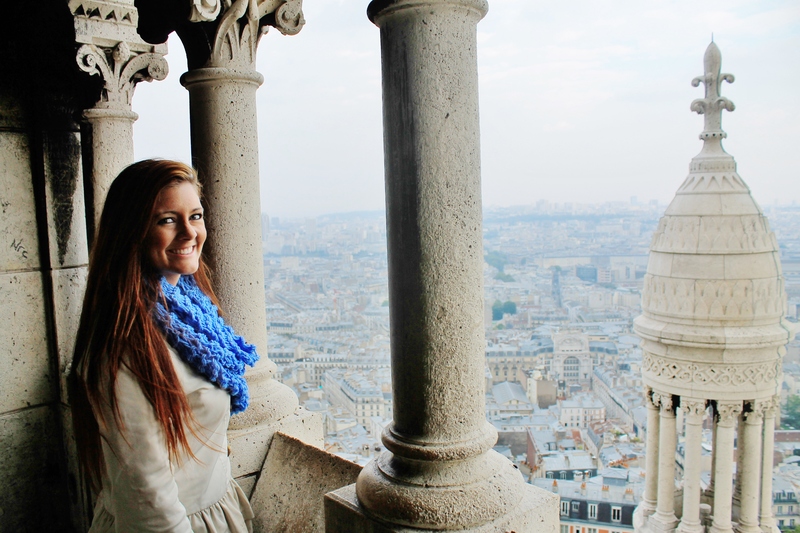 However, this one was my favorite because it was less crowded and you have the beautiful view of the Notre Dame Cathedral in the background. If you know this is something you want to see before coming, I recommend buying a cheap padlock from Target or Walmart and bringing it with you to save a little money. 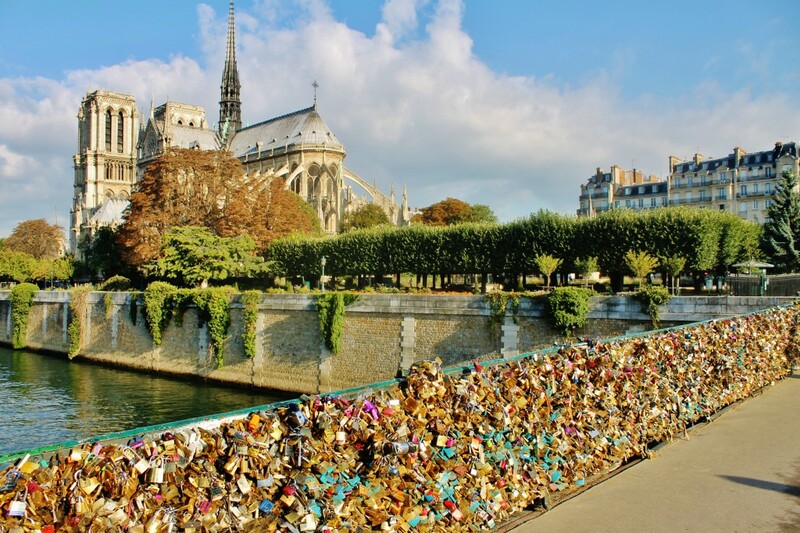 Vendors do sell locks around the city but they definitely do charge more for them. This is one of those things that is on the touristy side, but something you definitely don’t want to miss! 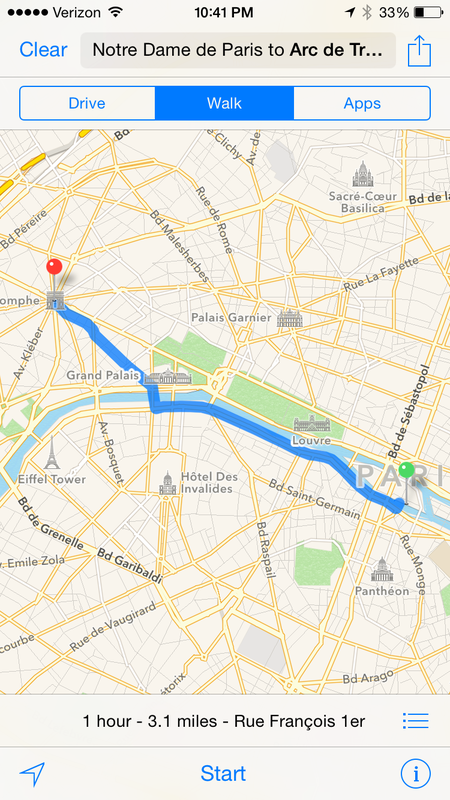 Yes, the metro is a cheap, quick way to get around Paris. 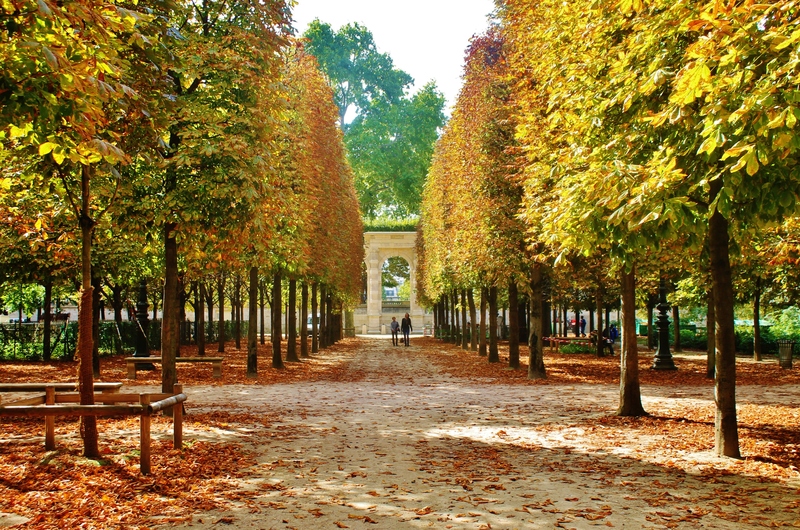 However, most of the cities major attractions (The Louvre, Champs Elysees, Arc de Triomphe) are located in a fairly straight path and the walk is BEAUTIFUL. 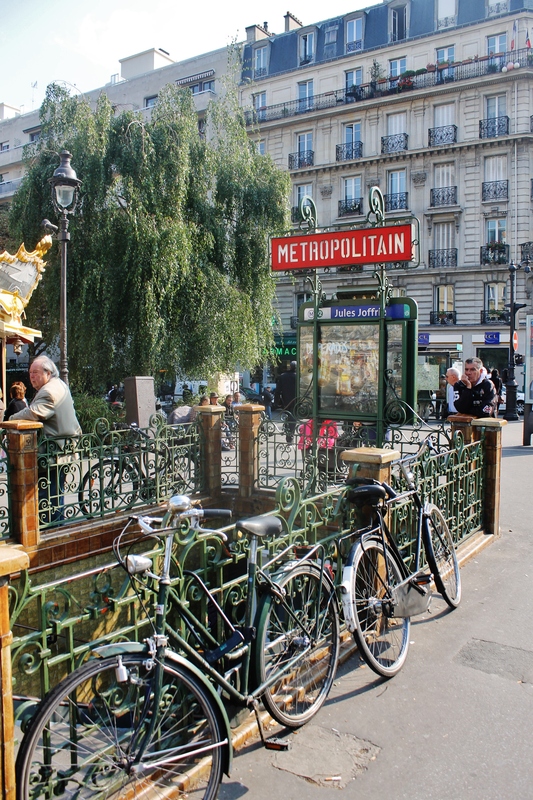 You will be able to take so much more of the city in walking versus taking the metro – and its free! 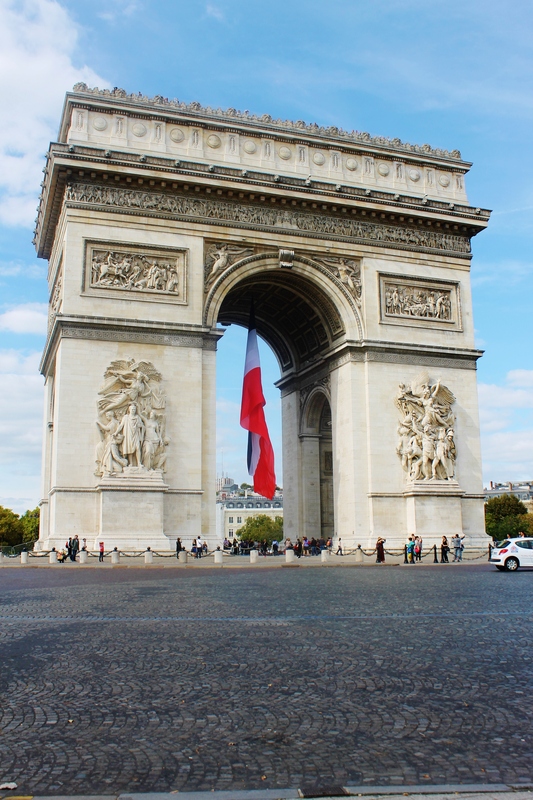 My mom and I walked from Notre Dame to the Arc de Triomphe. 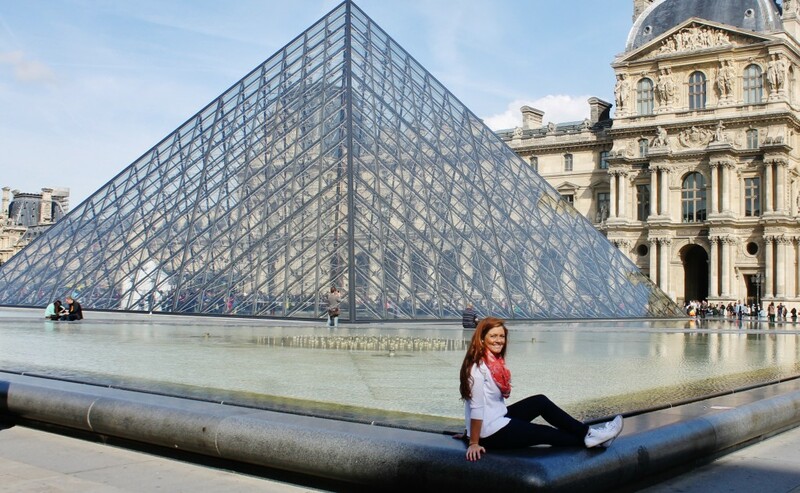 Along the way we witnessed gorgeous architecture, street vendors, musicians and gorgeous gardens. It is also really neat to see all of the different bridges. Each has its own architecture and scenery. 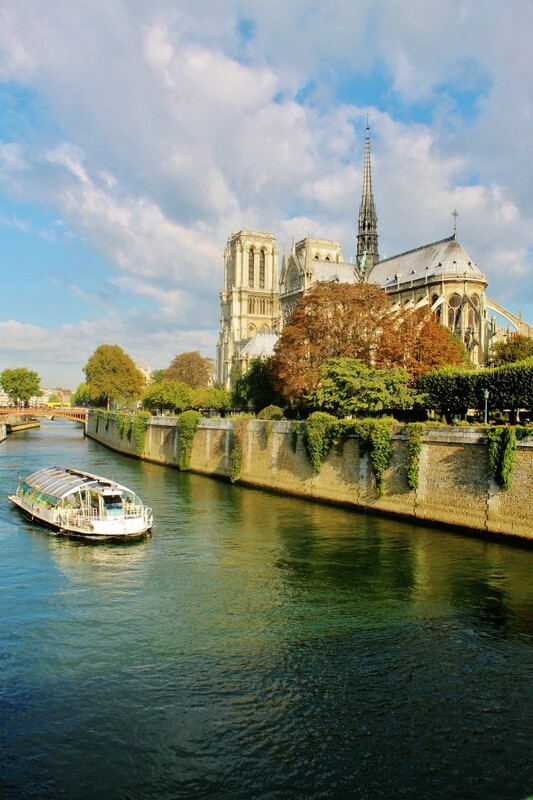 If walking isn’t your favorite thing, there are also fairly cheap river boats that stop at all of the major attractions along the river. This is a GPS route of the exact walk that we took. I wanted to take a picture of almost every door I came across during the walk. 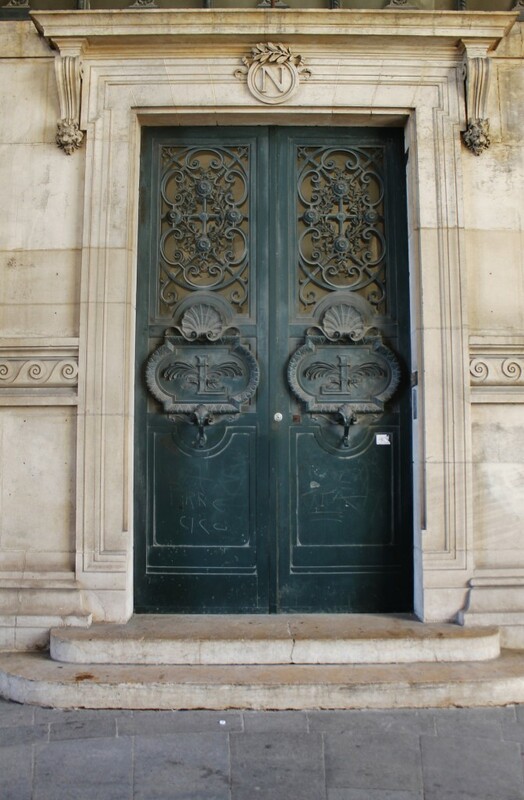 SO many beautiful doors in all different colors. This was one of my favorites. 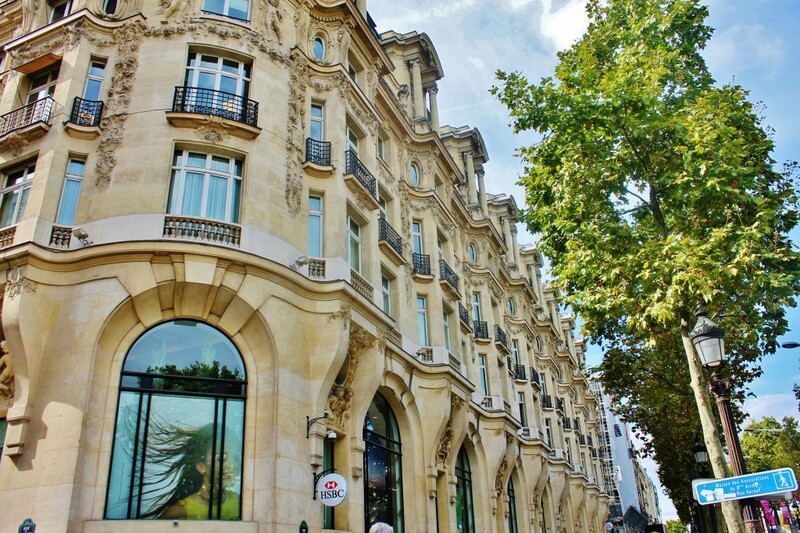 After the Jardin Des Tuileries comes the Champs-Elysses, which is a street full of nice high-end shops. 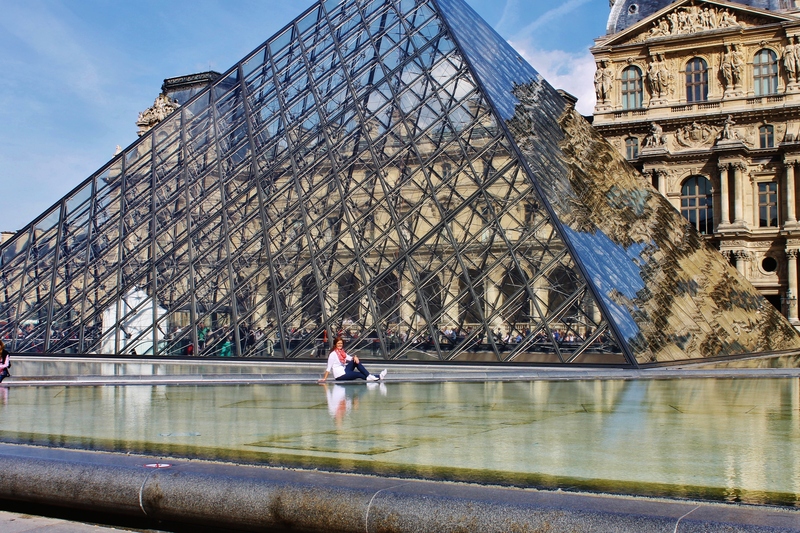 Here you will come across beautiful architecture as well as many upscale restaurants and shops to drop those Euros. Even if you aren’t planning on making any purchases, this street has an atmosphere that is definitely worth experiencing. 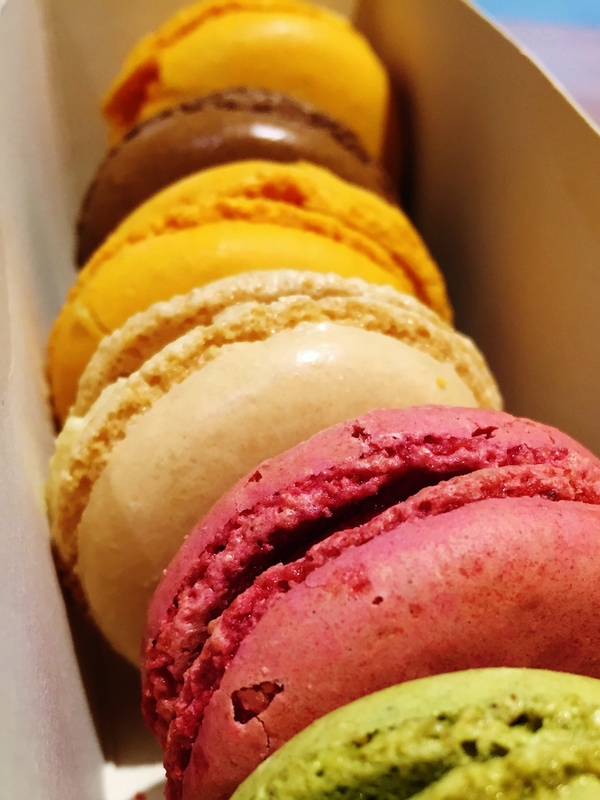 Whether it is a sweet pastry, melt-in-your-mouth macaroon, delicious ice cream or a warm, gooey crepe, Paris knows how to do sweets. 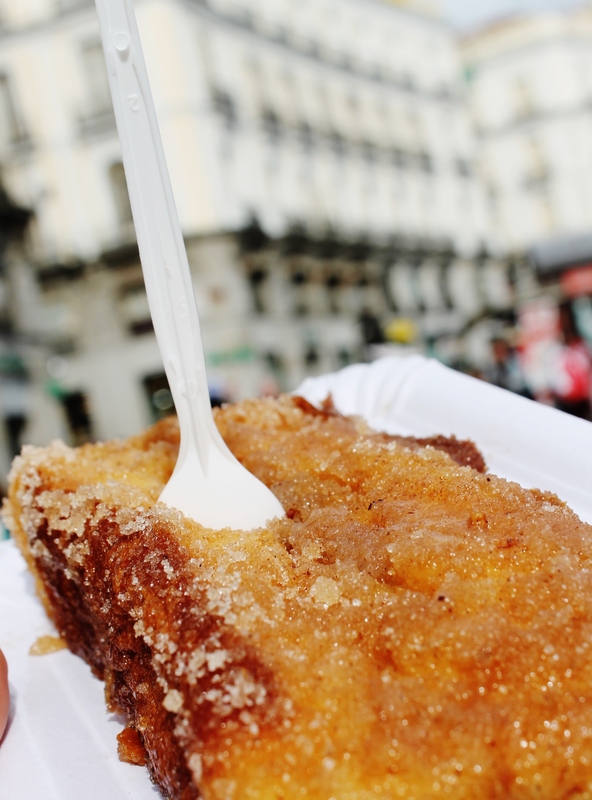 I have a RAGING sweet tooth so this city was absolute heaven for me. One of my favorite treats was definitely the crepe. I got Nutella with cookie crumbs and it was perfect. For those who don’t have a sweet tooth like mine, they have lots of other delicious crepe options with meats and cheeses. 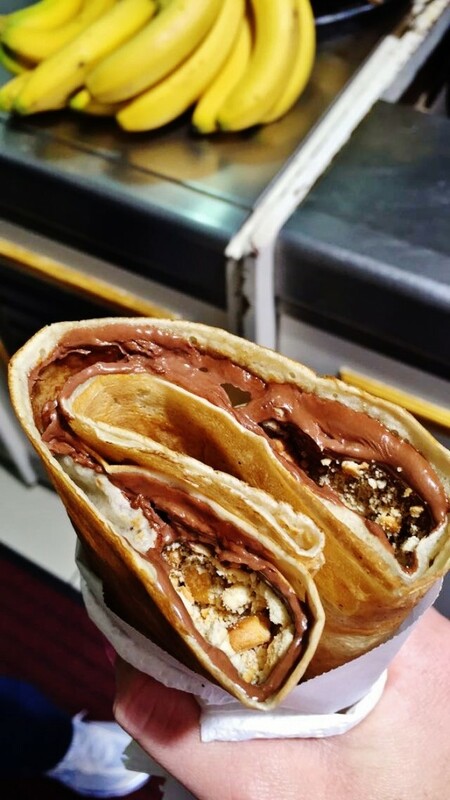 They have many crepe stands and shops sprinkled throughout the streets. 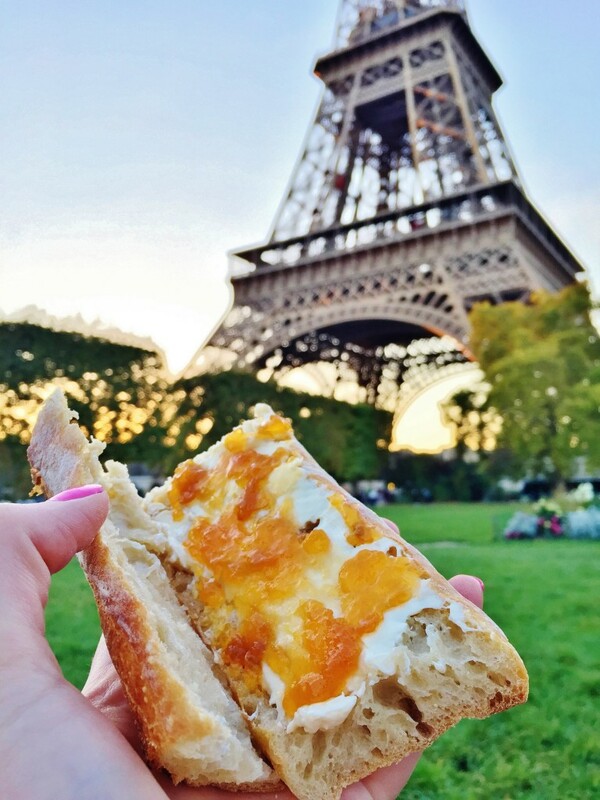 We got ours near Notre Dame and devoured it at a cute little park nearby. 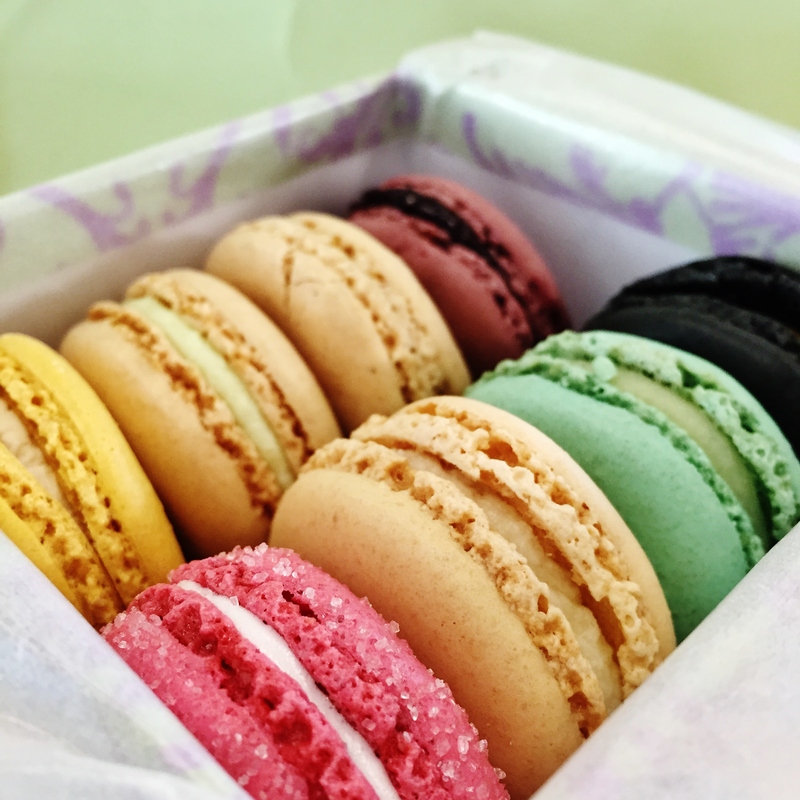 Another must-try are the macaroons! 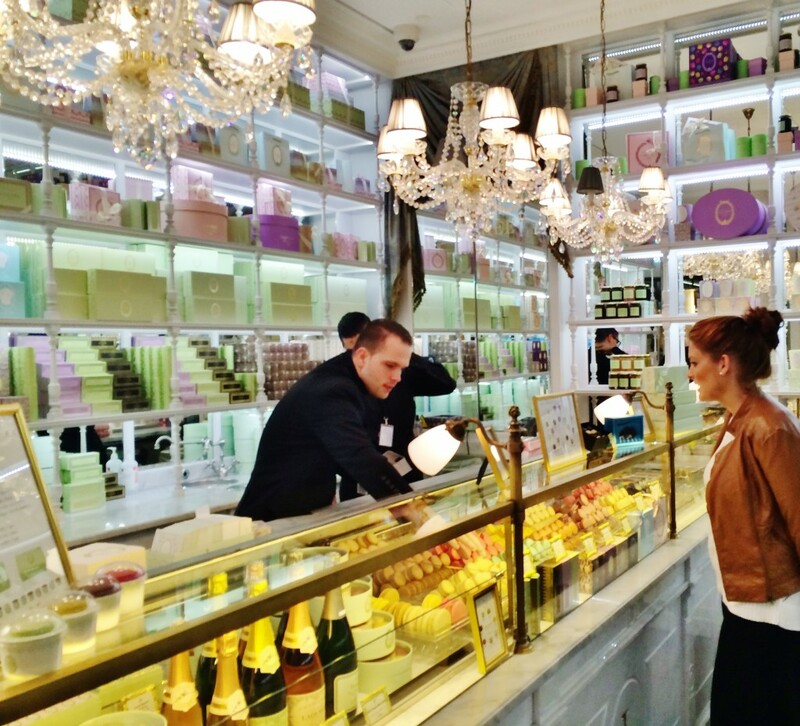 I did pay a visit to the well-known Ladurée. 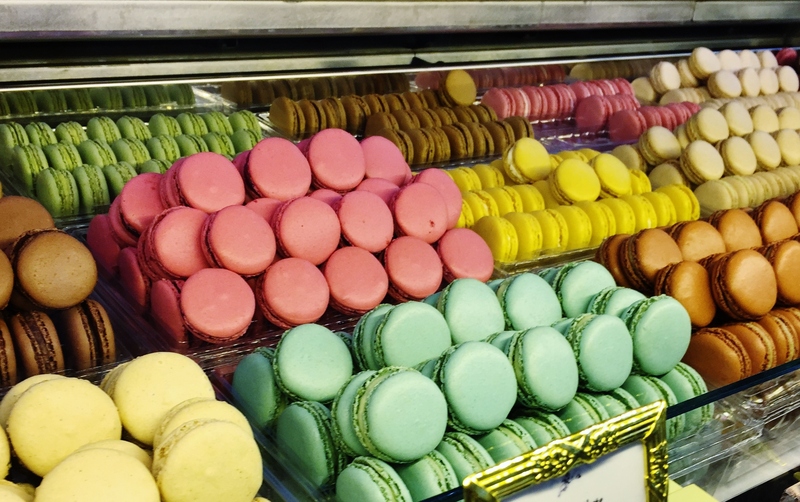 They have been at the macaroon game for a while (founded in 1862) and I can see why it attracts tourists. If you value the macaroon experience and don’t mind forking out a little extra cash, this is the place for you. I paid about 18 euro for a box of eight. The stores are beautiful on the inside and they give you some different choices of cute souvenir boxes. 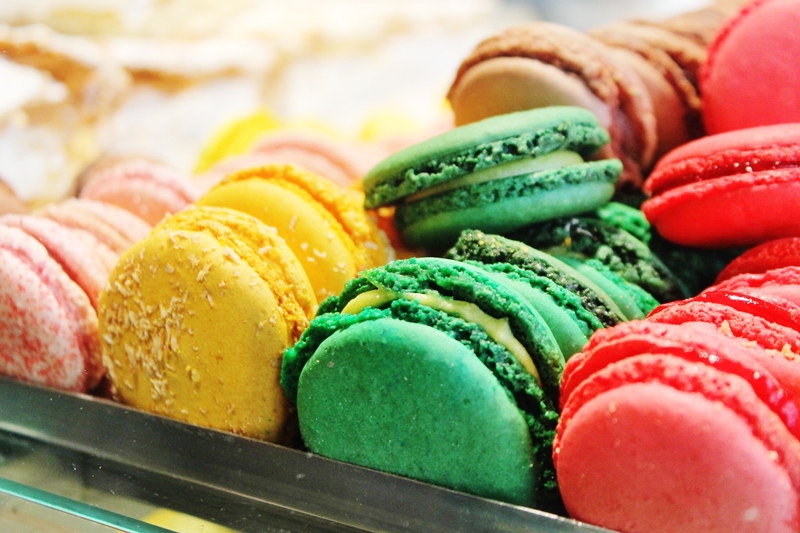 I will say though that these macaroons were a little dry compared to the others that I tasted. However, they did have a wide variety of unique flavors that weren’t offered in other shops. 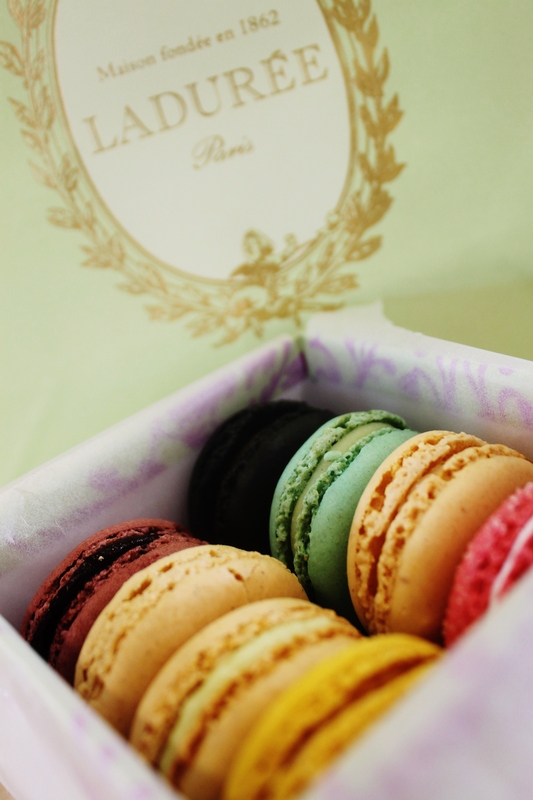 Surprisingly, one of my favorite macaroons was the apricot flavor from McDonalds. I was hungry and grabbed some before getting on the plane to go home and was really surprised at how they melted in my mouth. So if you don’t feel like paying 18 euro for a box of macaroons, or just bored at the CDG airport, definitley pick some of these babies up. 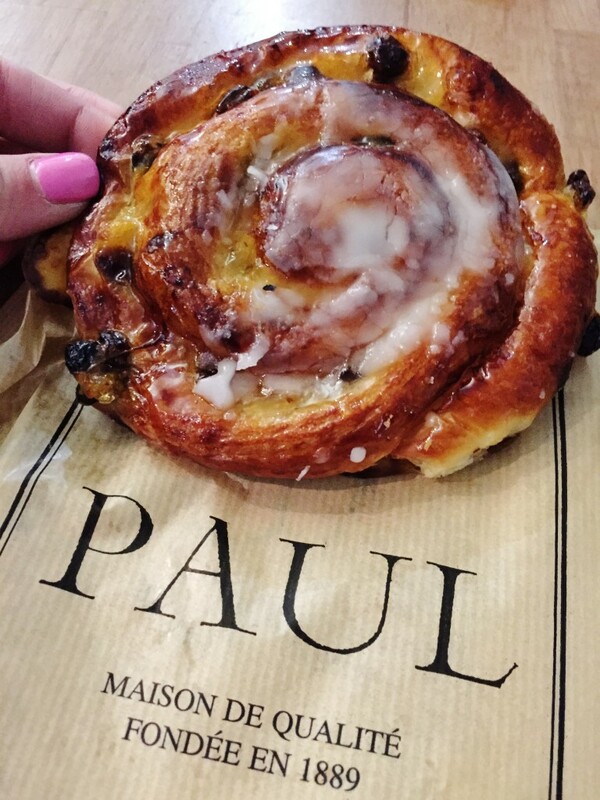 Paris is also known for its Pain aux Raisin which is usually a round, sweet pastry filled with raisins. Definitely not complaining that this was my breakfast. 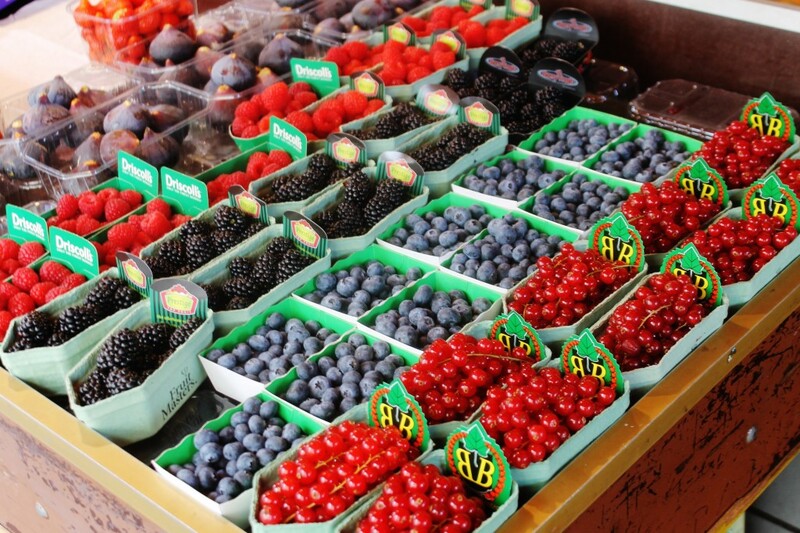 In Europe in general, food is SO much fresher. There are many markets and shops lining the streets. It is so amazing that even in the HUGE city, there are so many place to buy locally grown and homemade goods. 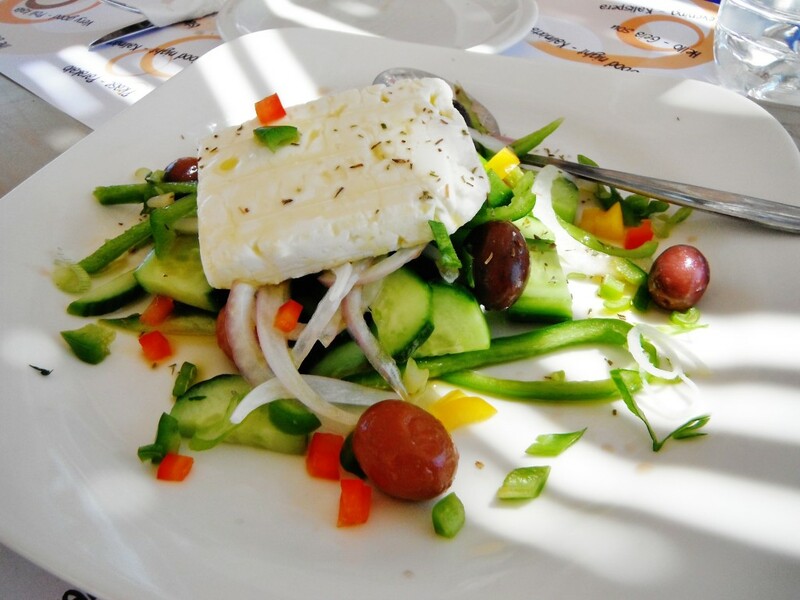 Everything is fresh whether its seafood, fruits, vegetables, breads or cheeses. Here, there is no Walmart to buy your breakfast cereals and frozen chicken nuggets. As I said earlier, if you are on a budget, shopping and buying your food from these markets is the way to go. There is something very refreshing about picking out your fruit from an open-air market or buying a baguette knowing it was made fresh that morning. Not only are you saving money, but you get to experience what it would be like to eat and shop like a local Parisian. 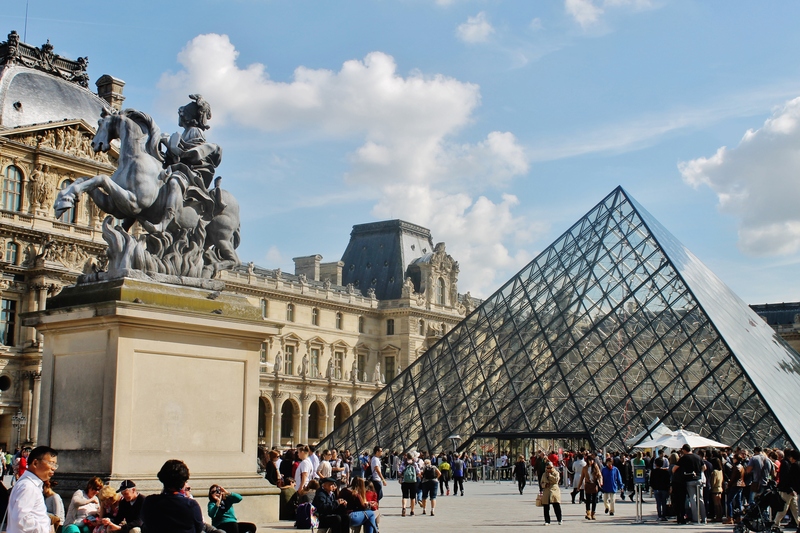 Some travel blogs and websites say that if art isn’t your thing, skip the Louvre. I disagree. 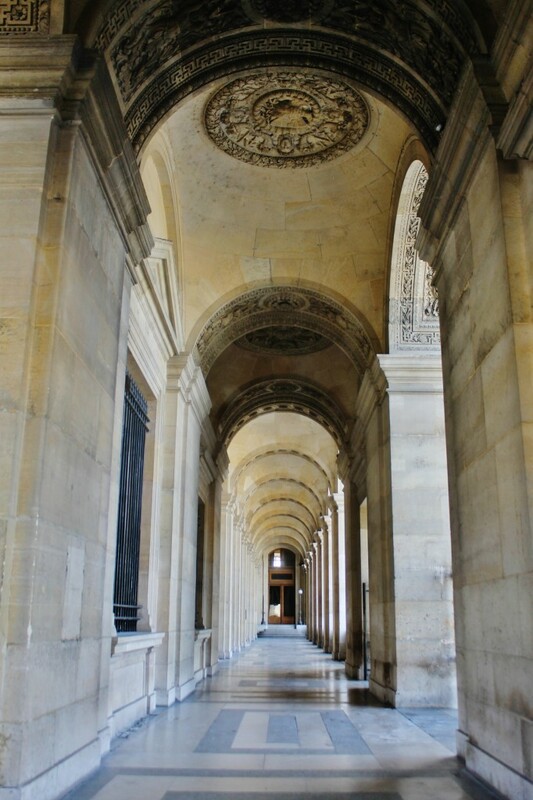 If you don’t have time to wait in the long line, pay the entrance fee or art isn’t your thing, you really should stop by just to appreciate the beautiful architecture of this building. We couldn’t believe the massive scale it was built on! Truly incredible. My mom and I didn’t end up going in because the line to get in was ridiculous and it would have taken up at least half of the day. But it is surely something to stop by and take in. As I said earlier, eating out in this city can be VERY expensive. So, what better way to spend a meal then a picnic overlooking one of the most beautiful views of the city? My mom and I bought some baguettes, spreadable brie cheese and jam. It was definitely one of the best meals I had in Paris. I have tried to re-create it a total of three times in the U.S. and it just isn’t the same. This is because NO American baguette can compare with a French baguette. It also probably has a lot to do with the fact that I was missing the Eiffel Tower view. We got a little five-pack of jam that had different flavors in very tiny jars from a nearby market (I had apricot). They were each less than three ounces so we could take them back on the plane with us. If you plan on picnicking, it’s always a good idea to pack some extra napkins, plastic knife and a little towel. My mom brought a little collapsible bag that we used to carry everything in which was also really convenient. Once you’re done with your picnic, its always nice to take a little stroll around the Eiffel Tower. 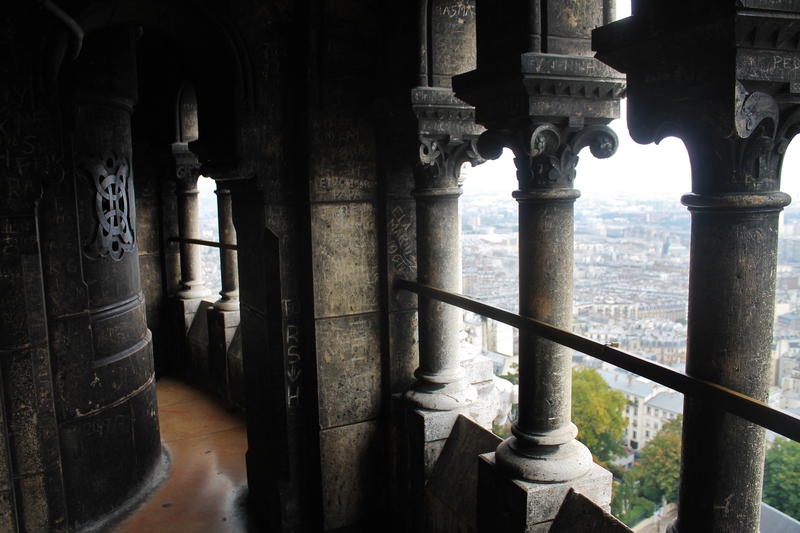 There are many charming views from different points around the tower and a couple neat vendors lining the sidewalks. This was probably my favorite things out of the entire trip. We timed it so that we would picnic at sunset and then be able to see it lit up all at night shorty after. The tower “twinkles” every hour on the hour. 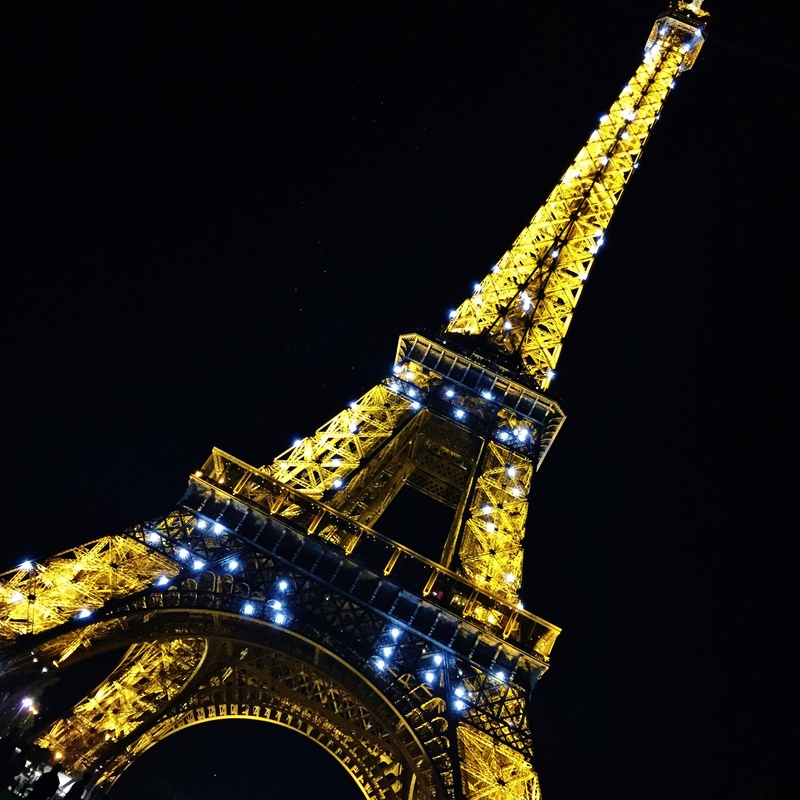 If you see the tower at night, make sure you time it so you are there for the twinkling. We sat down on the lawn and there was a man with a beautiful voice who had set up a microphone and was singing in the background while the tower twinkled. It was truly magical. We did this on our last night there so it was the perfect grand finale to the trip. Here is a picture of the twinkling. Although pictures don’t do it justice at all. 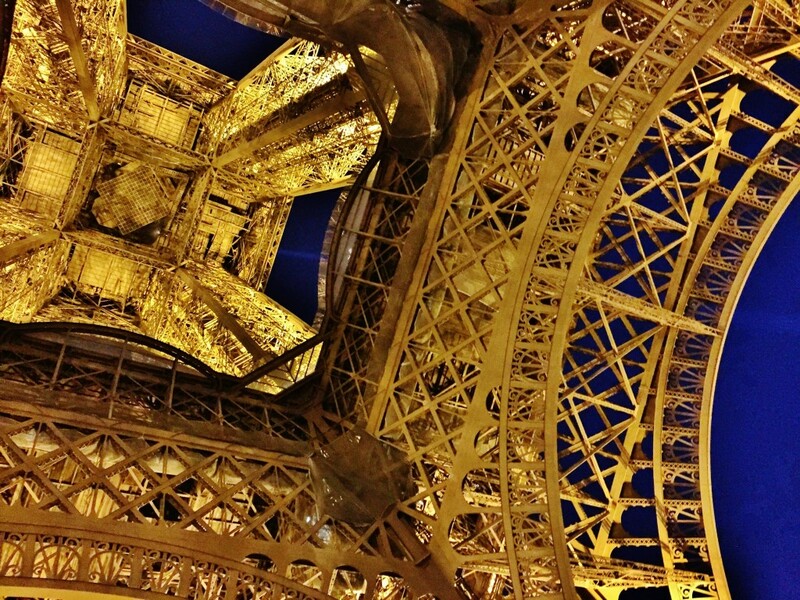 Definitely don’t miss out on this beautiful Parisian sight that is totally free! 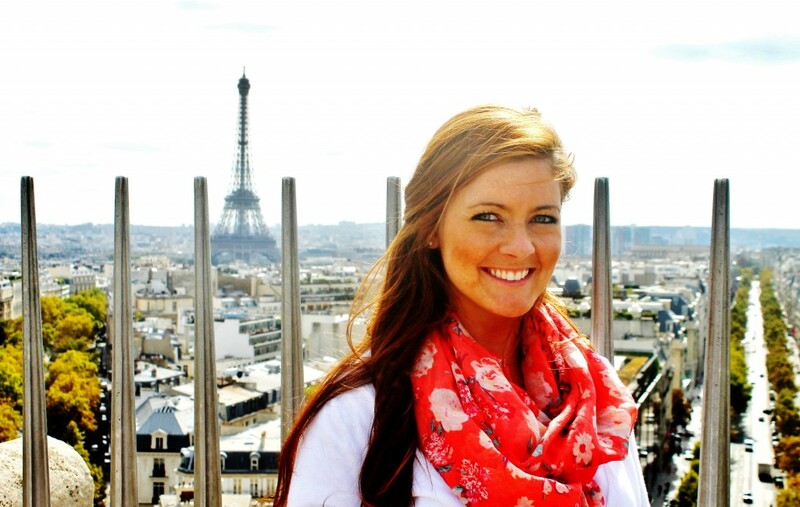 Hope to have given you some good insight on planning your trip to Paris! Au revoir! Copyright © 2019 The Runway Journal.